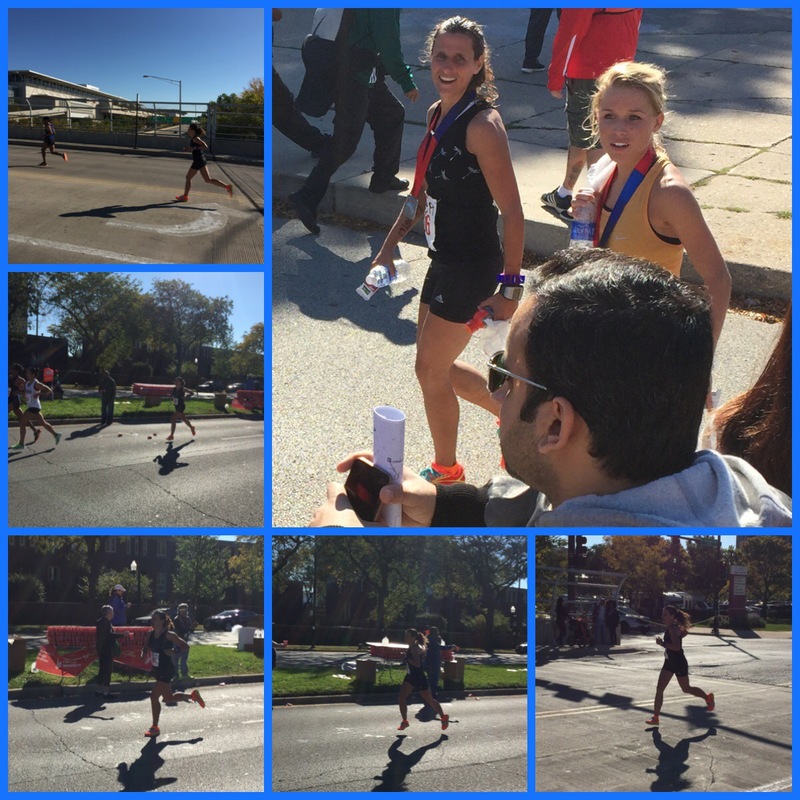 Sunday: Chicago Marathon: I am writing this as I am crying (yes I am a baby) 😂. 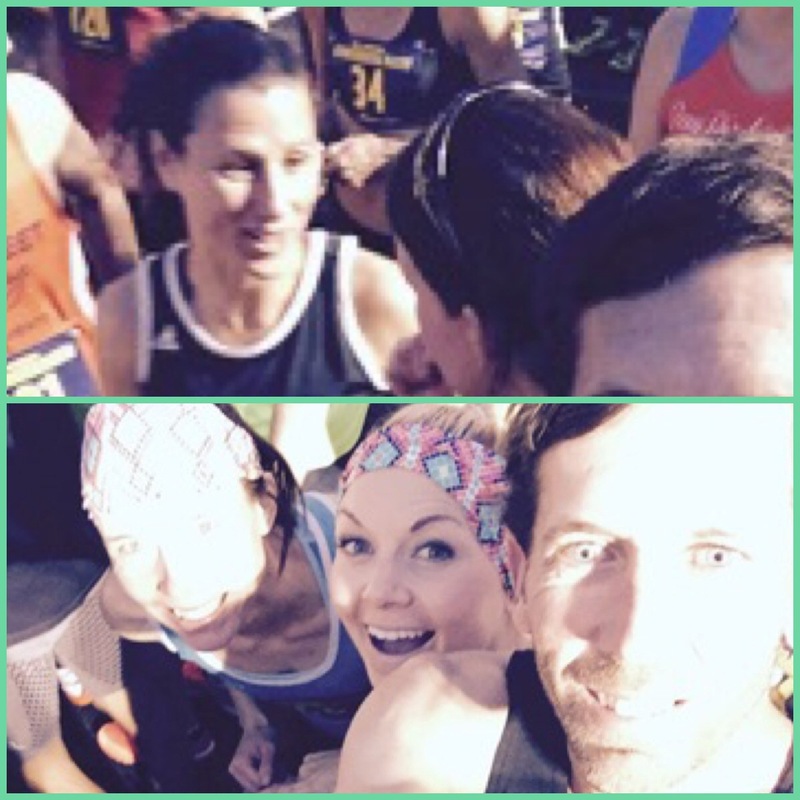 So this will be really emotional… Here is my race report. Everything went smoothly this morning. 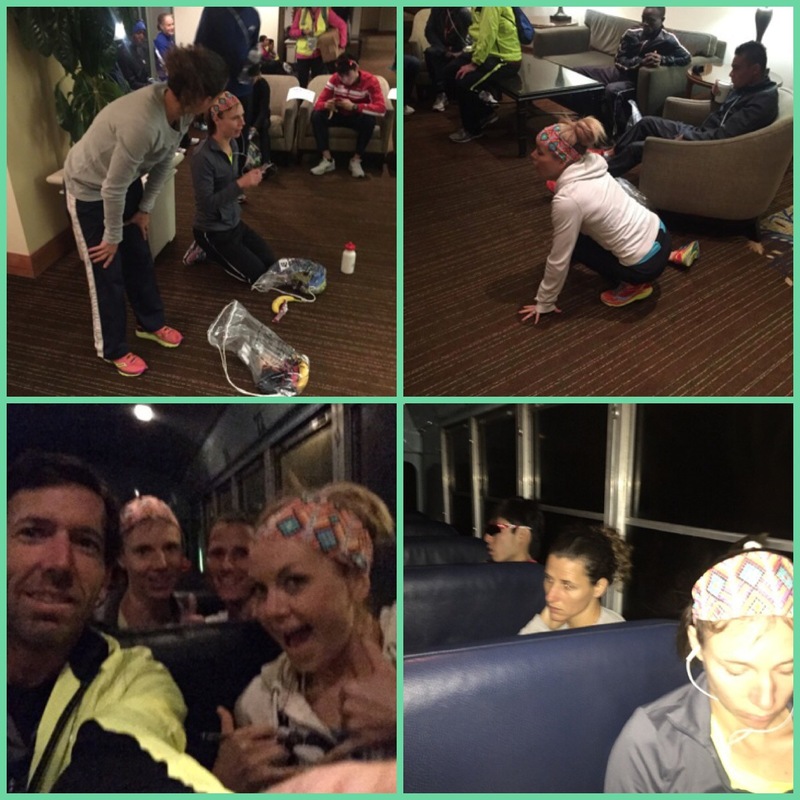 Getting up and ready, walking the streets in the dark to the train, and then connecting with 45,000 other runners. Beautiful but warm and windy morning. But I was not going to let that effect me! 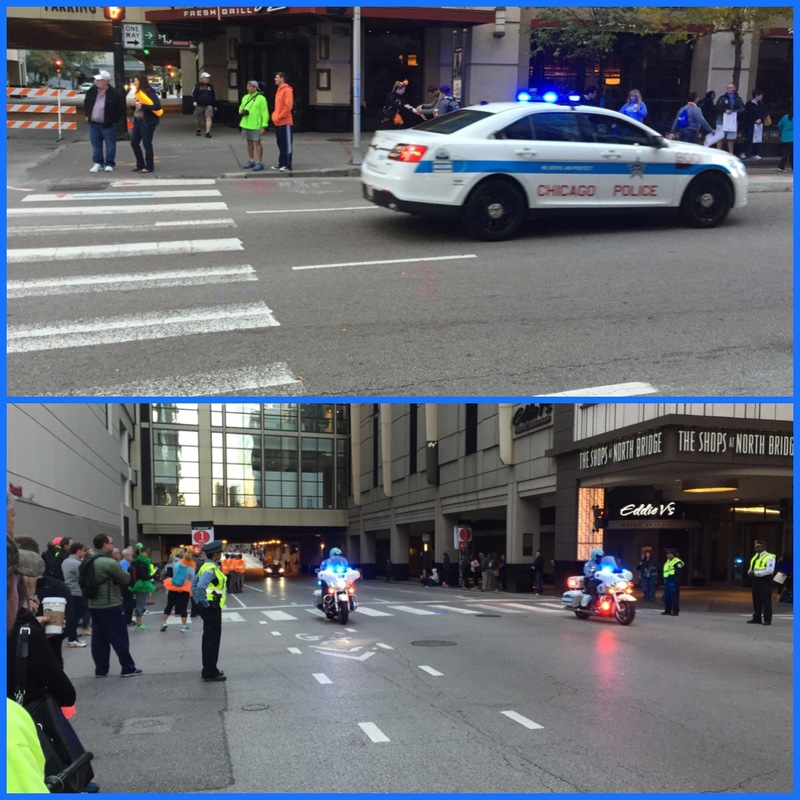 Cops ligned the streets everywhere… It was neat to see. I hung out in the American Development tent with about 200 other people trying to qualify for Olympic Trials… The nervous energy was so intense and heavy! My nerves were so strong. I just wanted the race to start. And then right at 7:30 we were off! I felt so good… More than good, great. My garmin kept beeping every mile and I was faster than my splits! I was excited. My half was right at a 1:20… I knew I had another half marathon in me… These were the 1st 17 miles from my garmin: (my garmin went out on me when I was writing it down and I know that my last 2 miles were a 6:43 and a low 7- maybe 7:03). 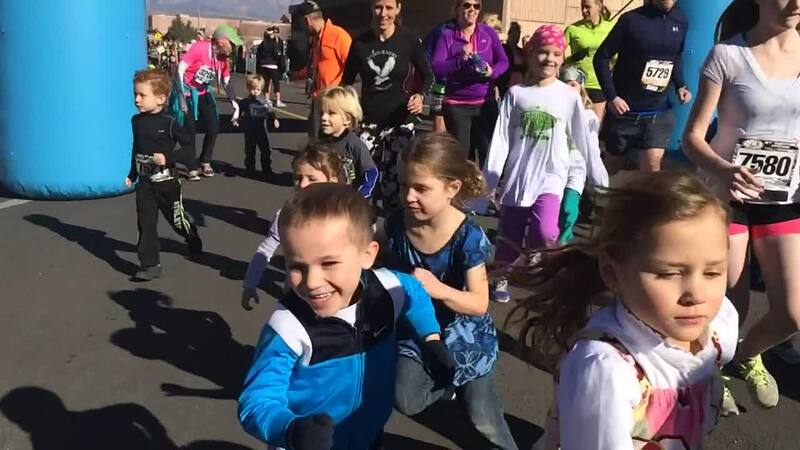 I just kept thinking, my girls are going to be so excited because I told them we will go to Disneyland right after the trials (which takes place in L.A.) I thought about Corom as he was chasing me around the course (he even rented a bike to get back and forth). I did find out that he knew I was off from tracking my number. 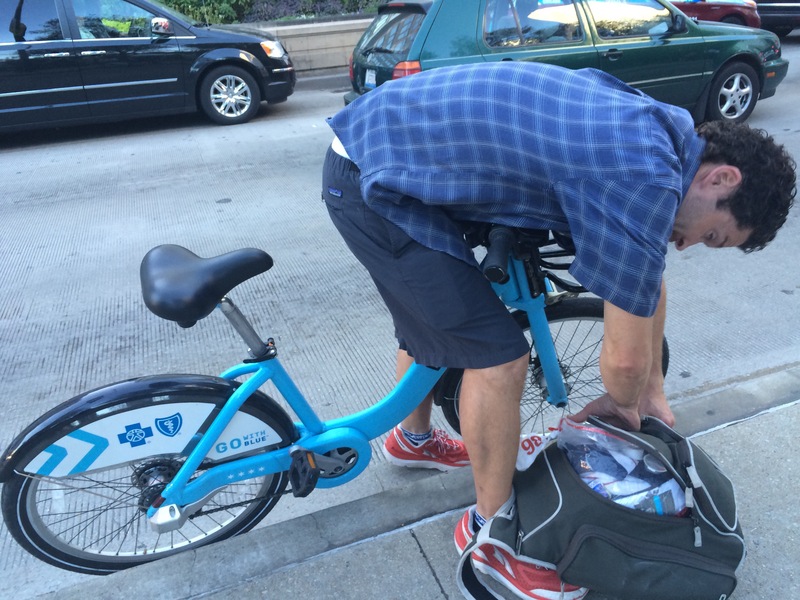 He was afraid to tell me because he thought I knew… As I ran past him smiling and waving every time. 🙂 He was the best out there! I thought of all the kids I coach and the support they have given me, all my friends and church members and then I thought of my coach… How he would be proud. 🙂 These were all the things going through my head after every split on my garmin. As you can see, my garmin was way off… I thought I was hitting all my marks but I obviously wasn’t. I missed most of the flags with the mile markers because the crowd (1.7 million people) were along the entire course and it truly was electrifying!!! Simply amazing with the amount of people out. I am just so frustrated thinking I was on. I do want to say that we have met some really fun and great people here! I will blog about my weekend probably tomorrow because this truly has been a great experience. K I’m going to stop because I will just keep rambling! Thanks for all the love and support!!! I do want to say that it really was fun. Great course, great spectators, well put together and very electrifying! I did love it. 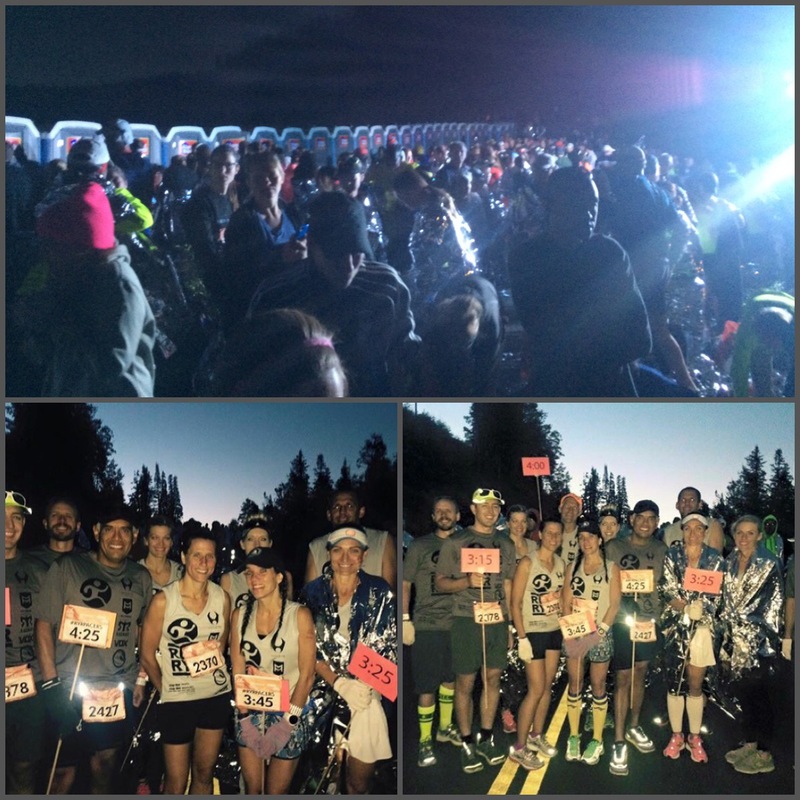 Saturday: I got up at 4:50 a.m. so I could meet up with a group of people for my 20 mile run. 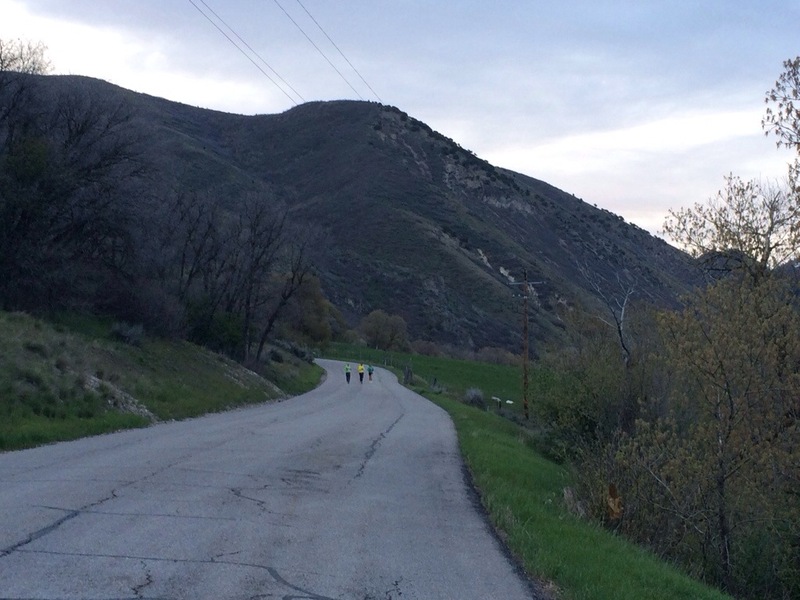 We headed up Provo canyon for 6 Miles and then I turned around and tempoed down the 6. I tried to stay between 6-6:10. 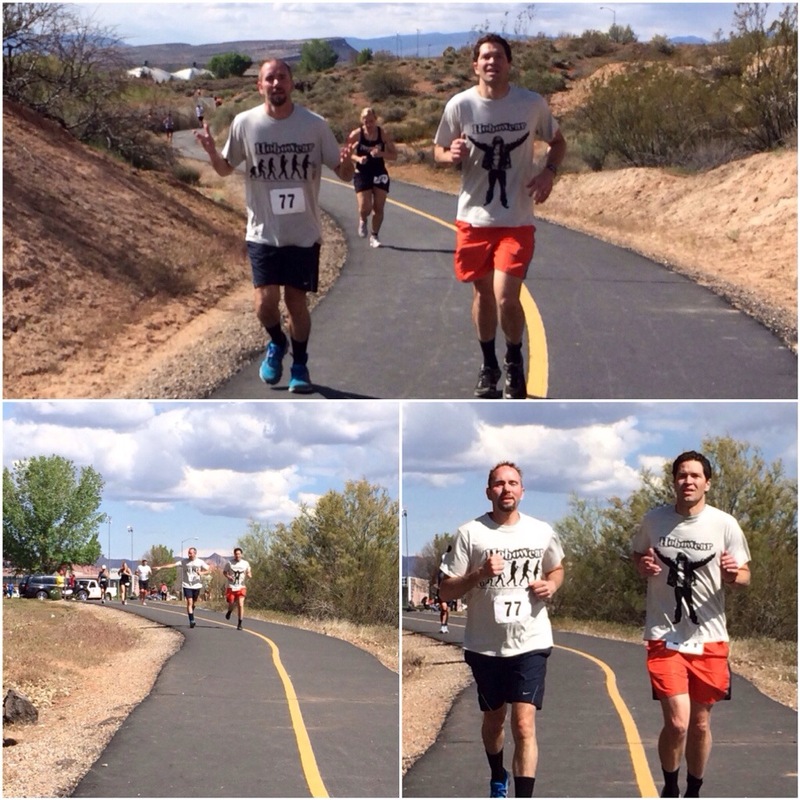 I drove a mile down to a 10k free race… Recovery Days (it was a awareness fun run for addicts). 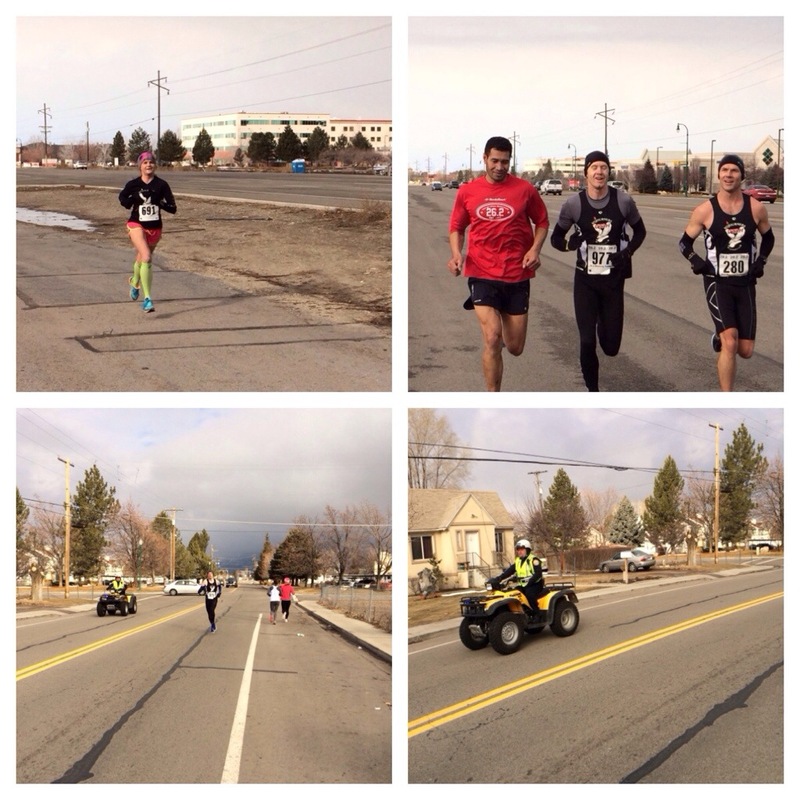 I warmed up another mile and then raced the 10k. I was so tired and felt flat. For 4 1/2 miles I held onto my marathon pace and then I fell back to a 7 minute pace, to finish off my 20 miler. 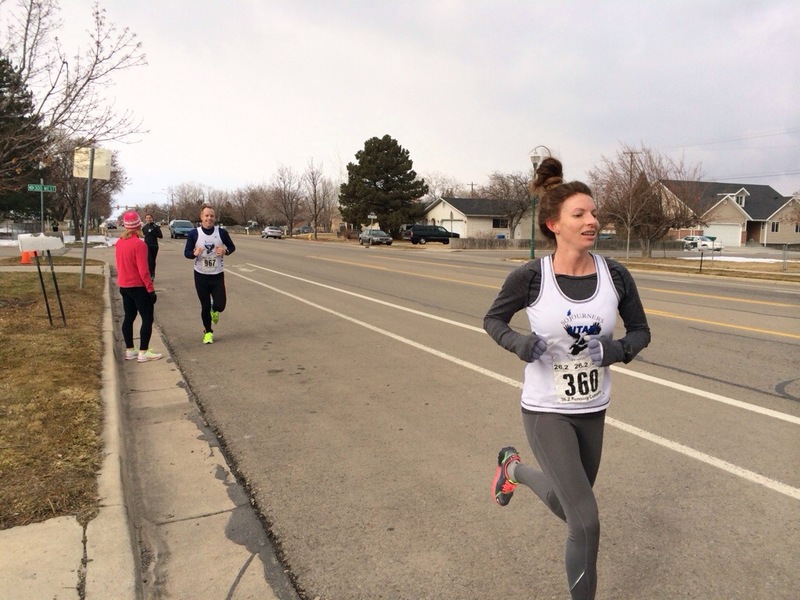 I was frustrated that I couldn’t hold on to my pace for the 10k. I do know that by running the 1st 13 and then waiting another 40 minutes (in the cold) for the 10k threw me off… But I was still disappointed. It was a good workout though. Saturday: Well this morning was my annual half ironman relay race with my old boss from Sundance, Jerry (71 years old) and my friend Megan (she’s my age and Jerry’s daughter-in-law). It is always a fun time with these 2. (this is actually last years pictures because I have not received this years pics yet.) 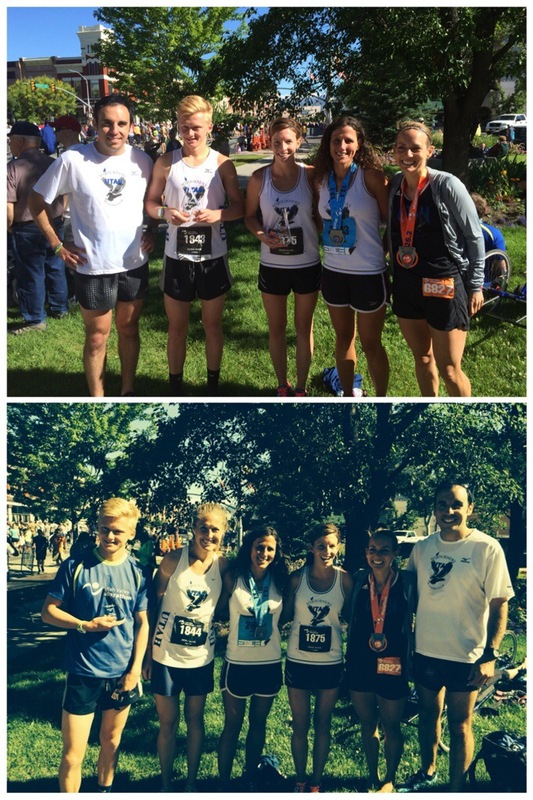 It’s awesome because we were able to take 1st over all the relay teams… Including the BAM men’s team (who were all younger than us… Way younger than Jerry), the BYU men’s team, etc. At one point after the finish, one of the men’s team came up to us and asked who did the biking… They talked with Megan for a little bit, complimenting her, we talked about the running course and then they asked who and where our swimmer was (Jerry was standing right next to us)… When we said he is right here, I think we really surprised them & depleted their egos a little. He did amazing! 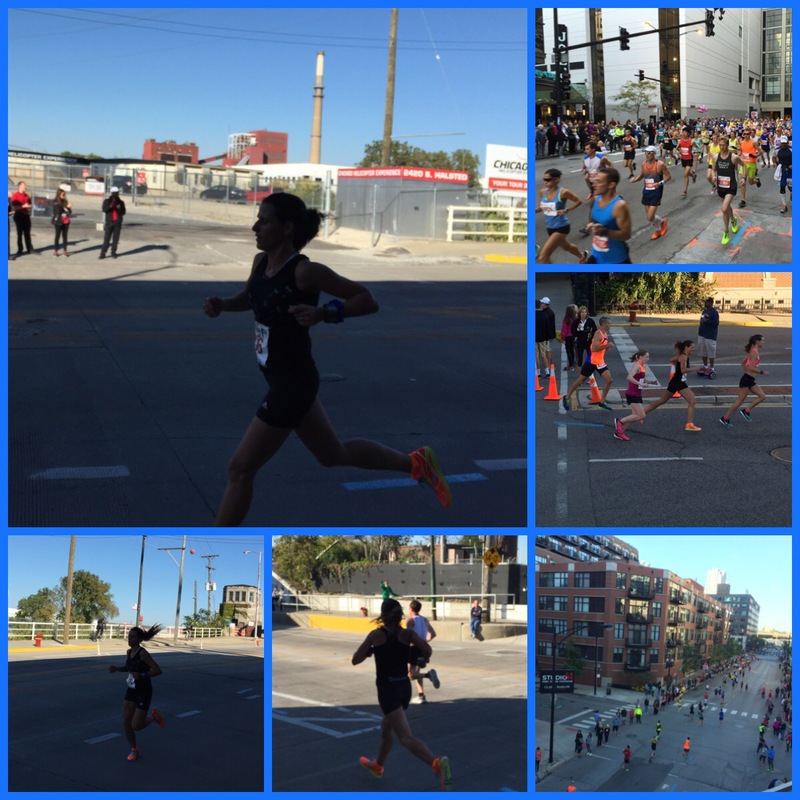 I ran the 1/2 in a 1:24… I thought I didn’t do so well and was discouraged. But I looked at my time from 2 years ago on this course and I ran a 1:25:16, then ran a 2:54 marathon 7 weeks later. 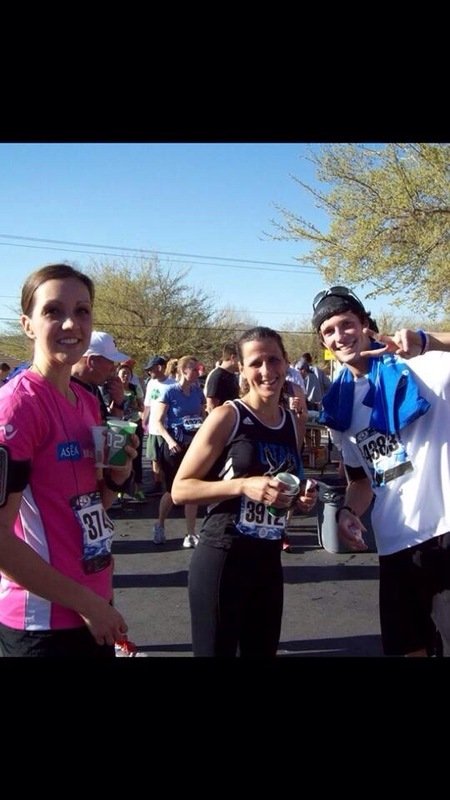 Last year I ran a 1:24.33 and ran the 2:48 marathon. So that gave me some hope and took away a little of my discouragement. But every year I forget that the 1st 4 miles has a slight uphill… And the next has the flat and down (and you repeat the loop). This course is hard with the heat from running that late (10:30-11:54) and with the course not being flat like I always think it is…. I just forget. I was glad to finish. I did run 4.3 before and a little over 2 after (but about 2 hours after). 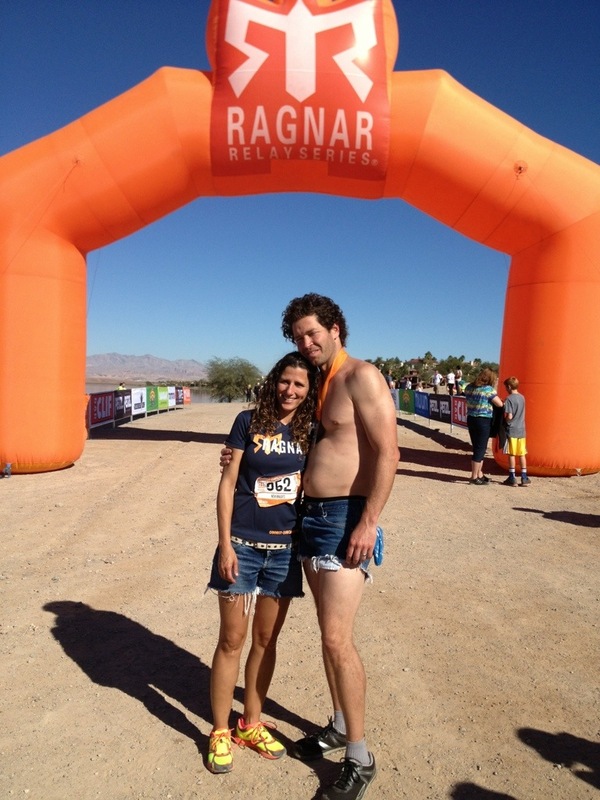 In between our downtime, we would go from team to team and pass out Cliff Bar products in our Barbarian outfits. It really was a blast!! Corom was grateful to have traded. 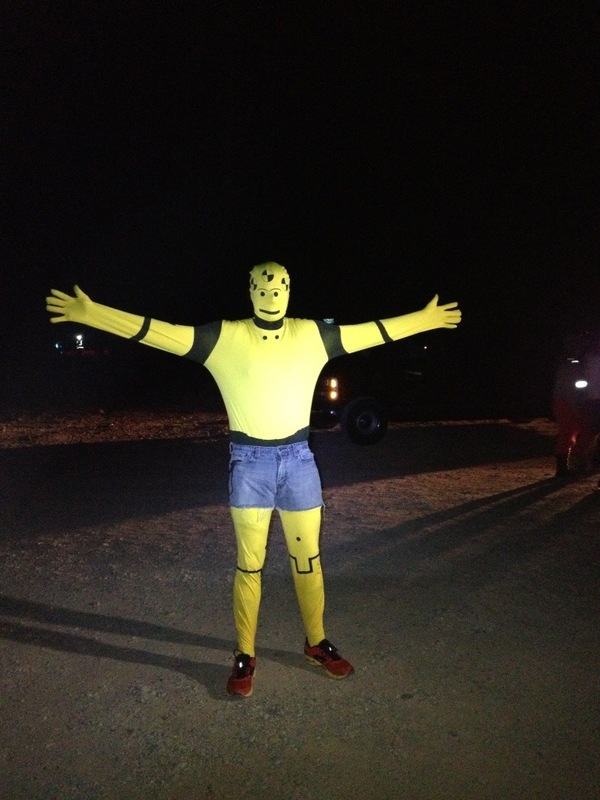 He ran the 3.2 for his 1st and last run with the 5.6 mile yellow one at night. Our team finished a little before one. We packed up our stuff and sadly said our goodbyes to everyone. Friday: Today is the 24th of July… A big holiday for Utah. 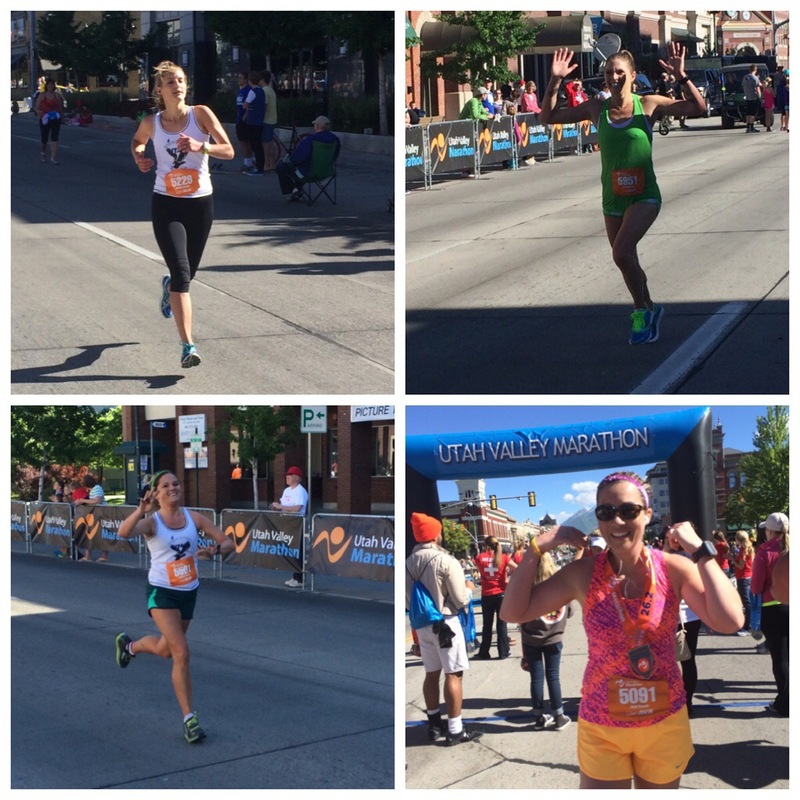 I went and raced the Speedy Spaniard 10k (and then the girls ran the 1 mile run). I held onto a 6:06 pace and came in at 37:55. 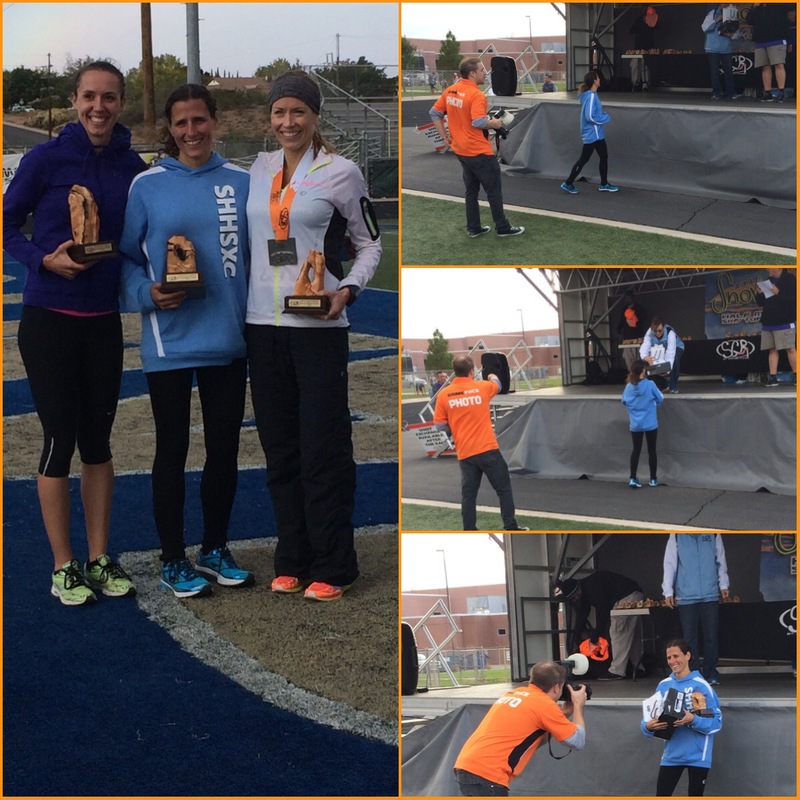 I felt good for the 1st 2 miles and then fought for the last 4 to finish off taking 1st in women’s. It was a good run. I ran 3 1/2 before and 2 1/2 after for a 12 miler for the day. My alarm went off at 3 a.m. I was so tired and I could not wake up the entire morning. I was dreading this race a little bit… And I’m sure it was because I haven’t raced for a little while, and having to get back in shape from an injury; I lacked the confidence in what I knew I could do… Well the gun went off and immediately 3 ladies took off. 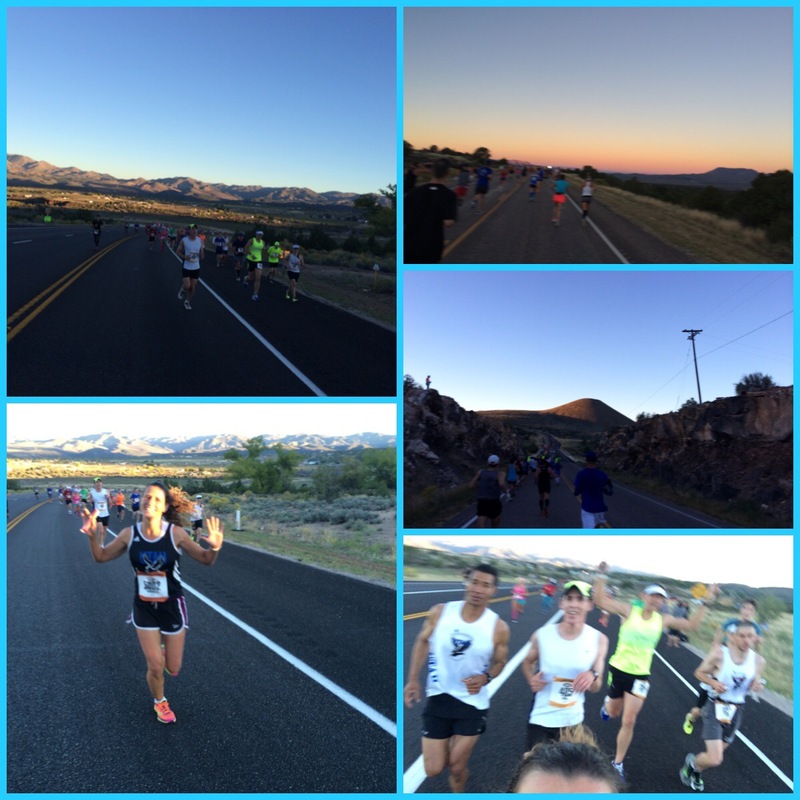 I hung back a little because I knew I was not in their shape… I didn’t want to struggle the last few miles… Well I held onto 4th place the entire race and I had a few times where I went through that mental struggle… But I finished and I’m glad I did it. 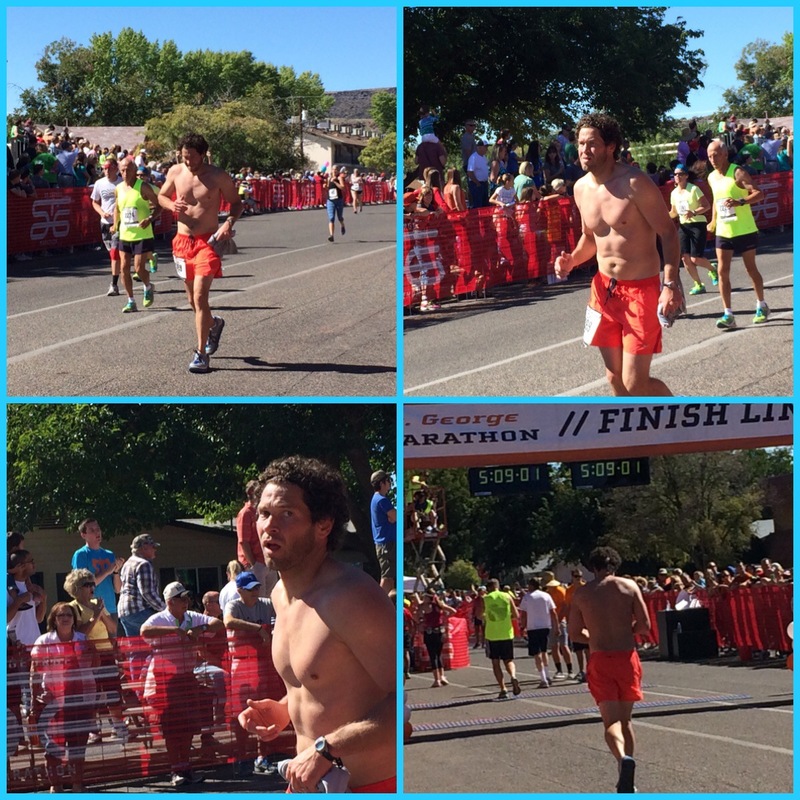 My time was a little disappointing but I did what I could today… My time was 1:21.38. 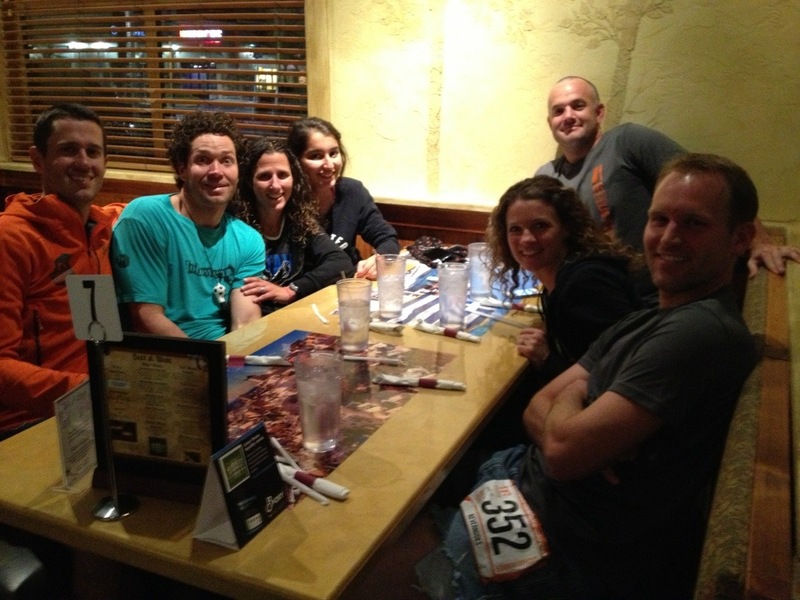 I was also able to meet the top finishers of the marathon… They came in an hour after I finished my 1/2. So fast! The best part… I won $150 for taking 4th. I didn’t know they were doing awards for the top 5. Yep, I was excited to get $! 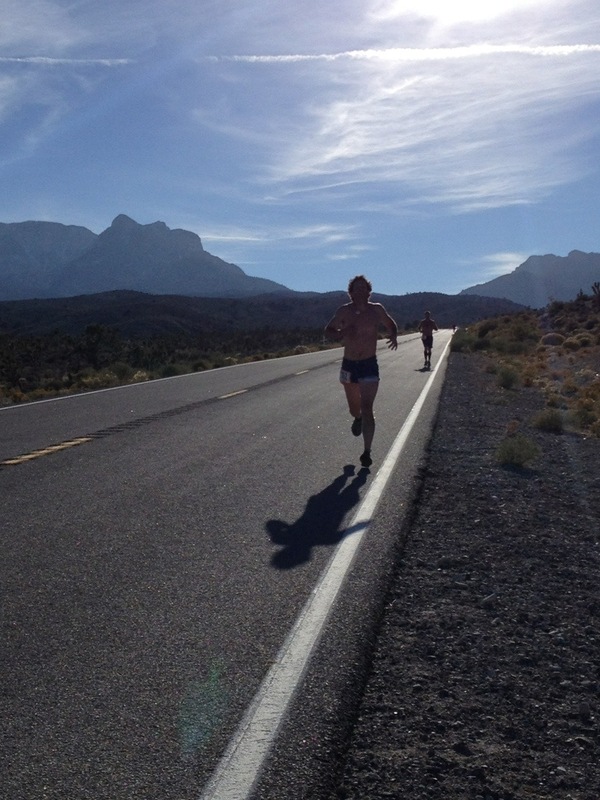 Mike and Corom ran well (57:07 and 57:08). 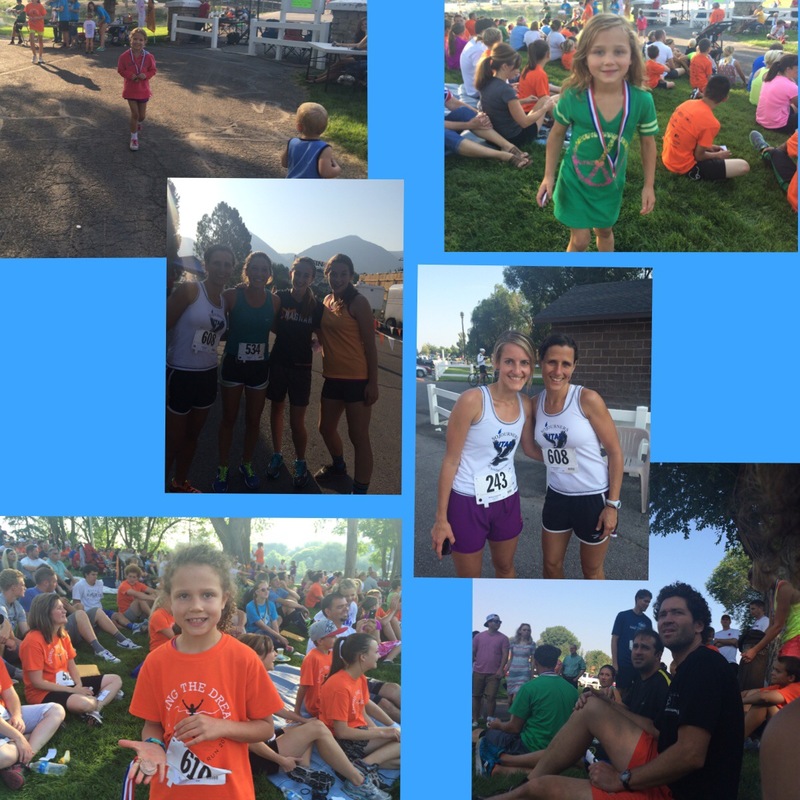 Saturday: It is race day! 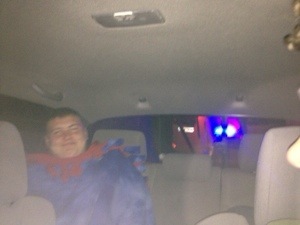 It was an early morning of 3:30 a.m. 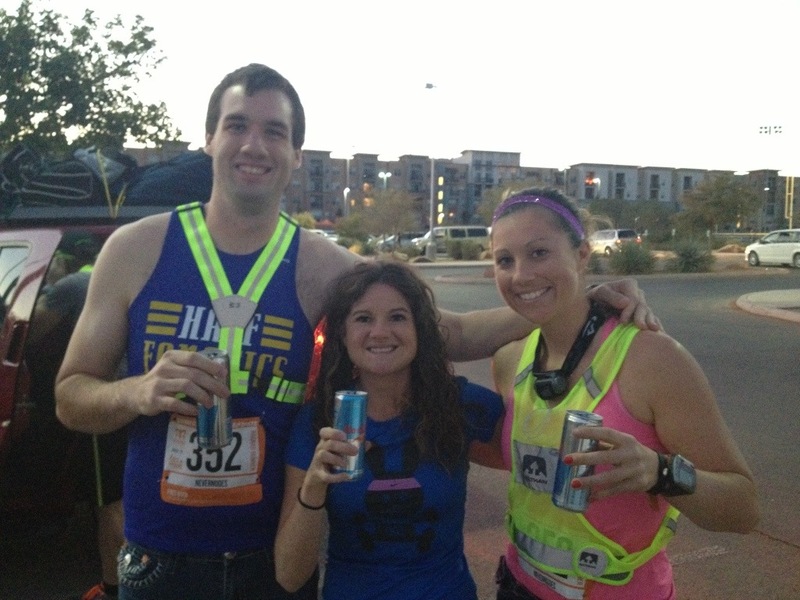 The 3 of us headed out… They went to the marathon buses and I jogged over the the half marathon bus. I was able to get about a 2 mile warmup in before I went to the starting line. I knew, once we all lined up, this was going to be tough competition!!! Yep… I was right. I felt good the entire race. I did back off after the 1st 3 miles because the top 3 runners picked up the pace… Like they were starting their kick already. 🙂 I was able to pick it up the last 10k for a stronger finish. I hung out for a little while after the race to watch some friends come in and to eat all the free stuff. 🙂 Oh and I ran a 2 mile cool down. 17 miles total. 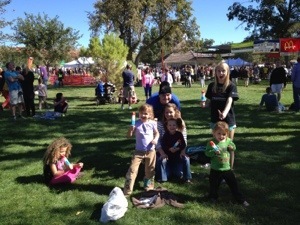 I walked over the park (about a mile away) to meet up with Corom, the girls and the Blasers. 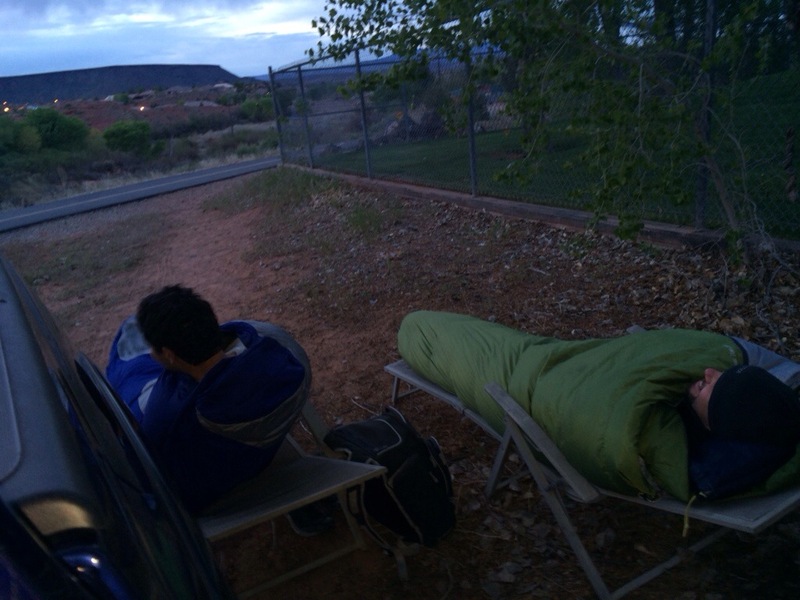 Today is race day… Our wake up call came at 4 a.m. I was able to wake up real quick! So were the other 2. We all had the nervous, jittery thing going on. 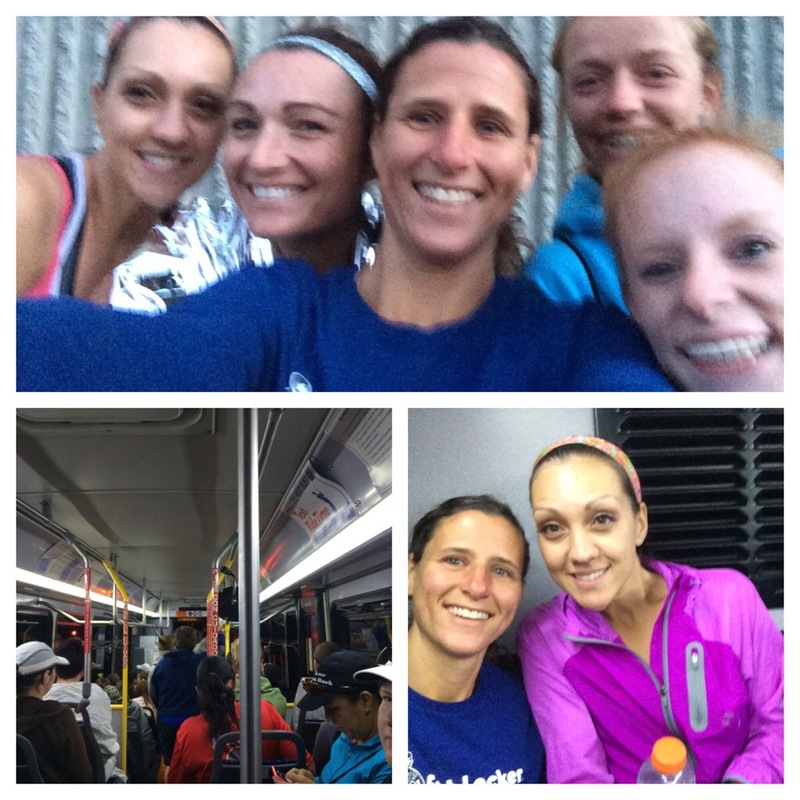 We caught the elite bus at 5 to head on up to the starting line. It was a good morning, nice cool weather, 100% humidity (which was a bit much but ok) and I felt good. 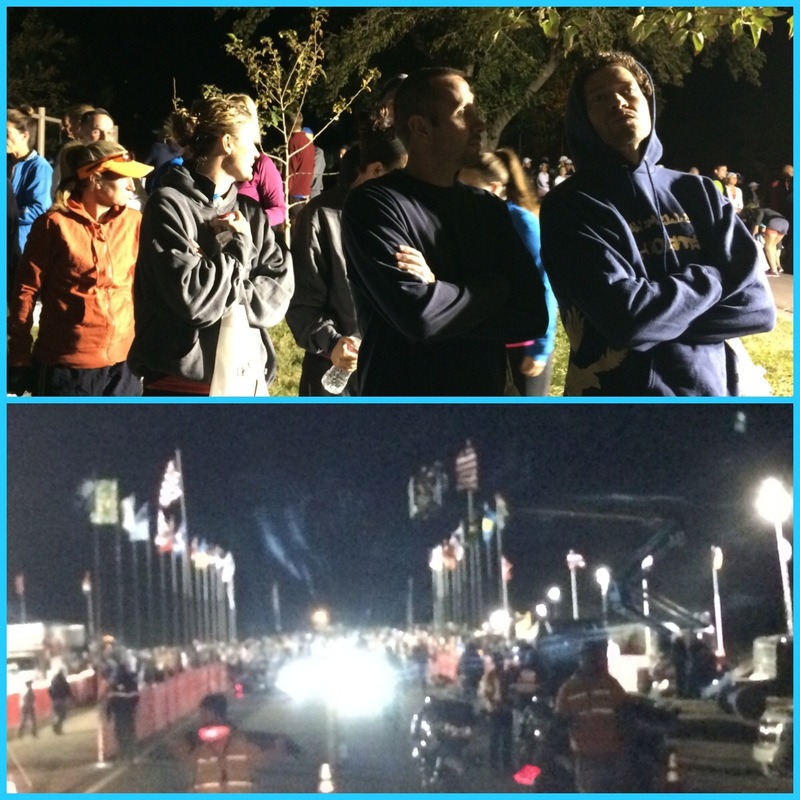 The starting line was amazing… The atmosphere of many of us trying to qualify. 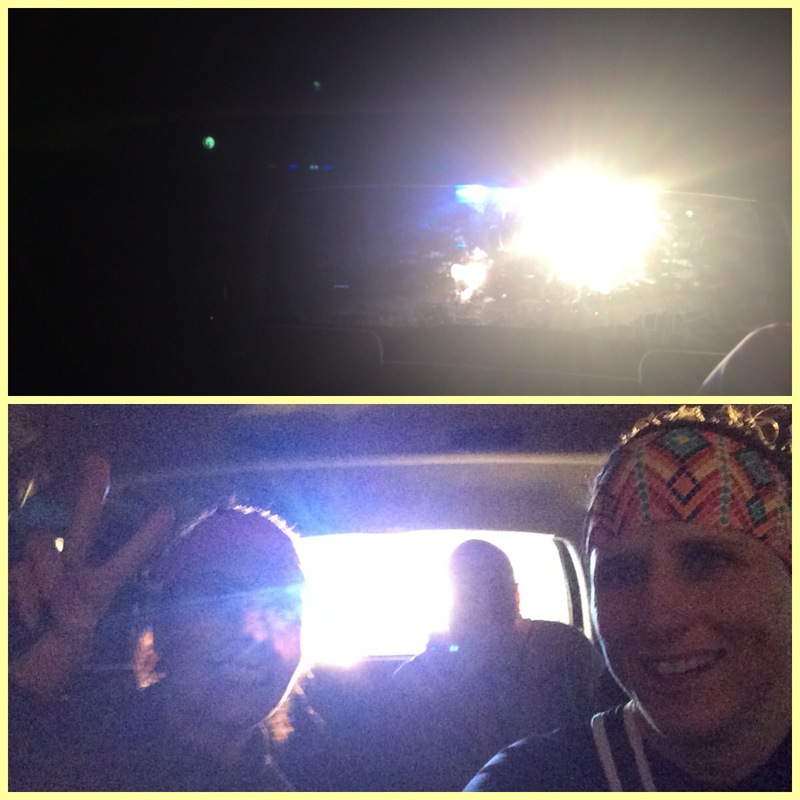 The race started right at 7… We had a pacer with us the entire way… Chris Mocko and Kim Conley (ran 20 miles) the Olympian. They were 2 of the best pacers I have ever ran with! So great and motivating!!! The first few miles we all felt great and there were about 30 women in the pack. 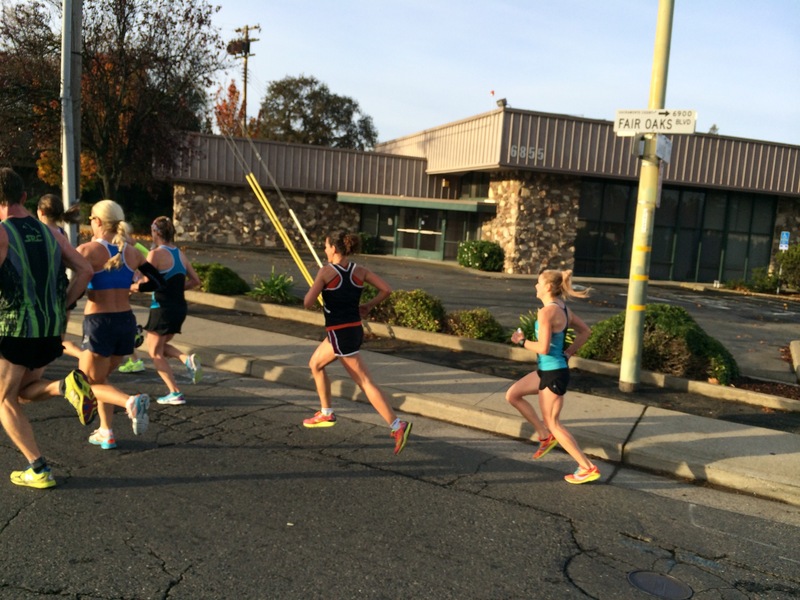 Amber Green was right there with the pack and Emily Jameson pulled ahead after the 3rd mile. At about mile 8, I see Corom there cheering me on and then I noticed a sign with all my girls names on them! 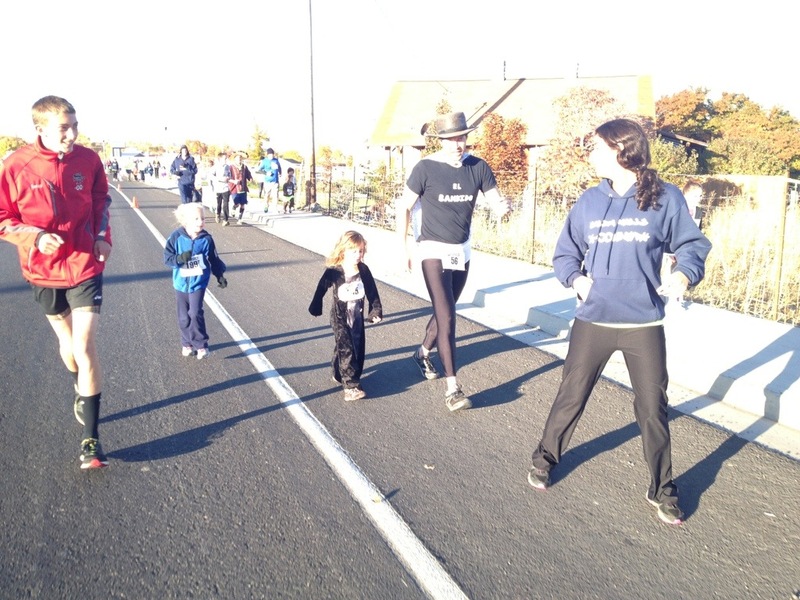 I was a little confused because I already passed Corom up but as I got closer, I noticed Rachelle Wardle and Amber Dunford there (my running buddies from home). They surprised me by driving to California the day before. I was so shocked and so happy! Such amazing friends. 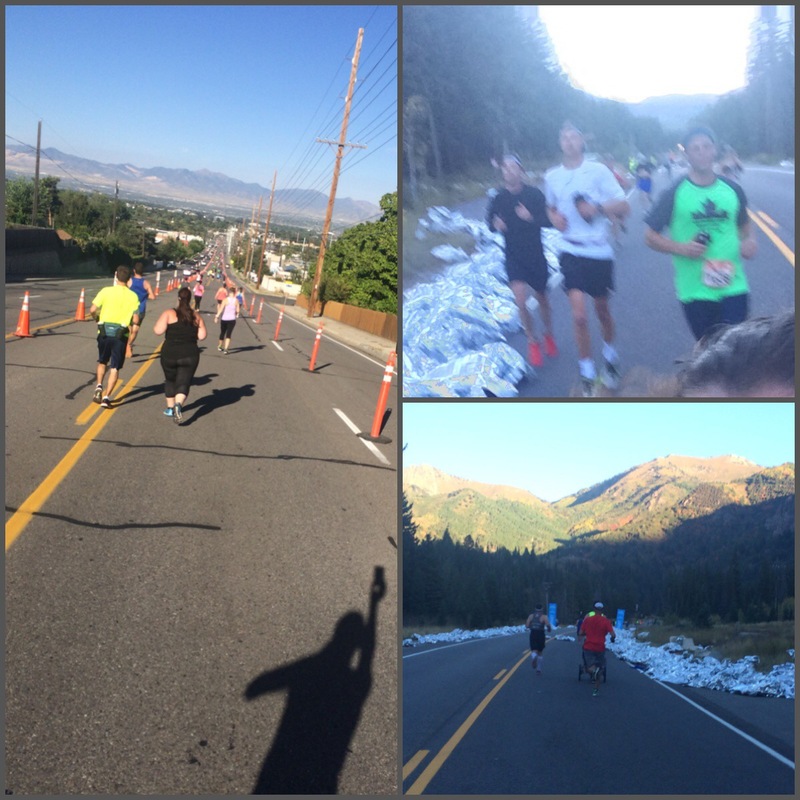 I saw the 3 of them throughout the course a few more times… I came across the 1/2 marathon at 1:21.21. 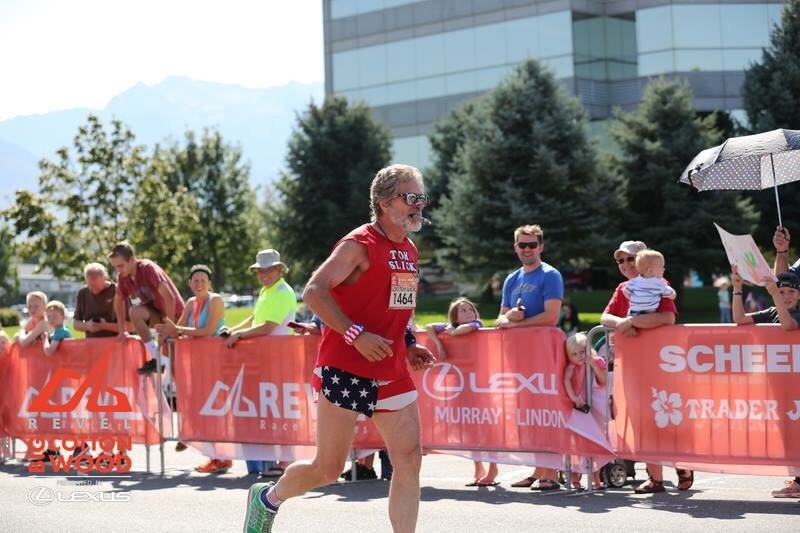 At mile 16, I started to go through a mental breakdown and I fell a little behind from the pack. I noticed that there were not too many women left in the pack (about 8). 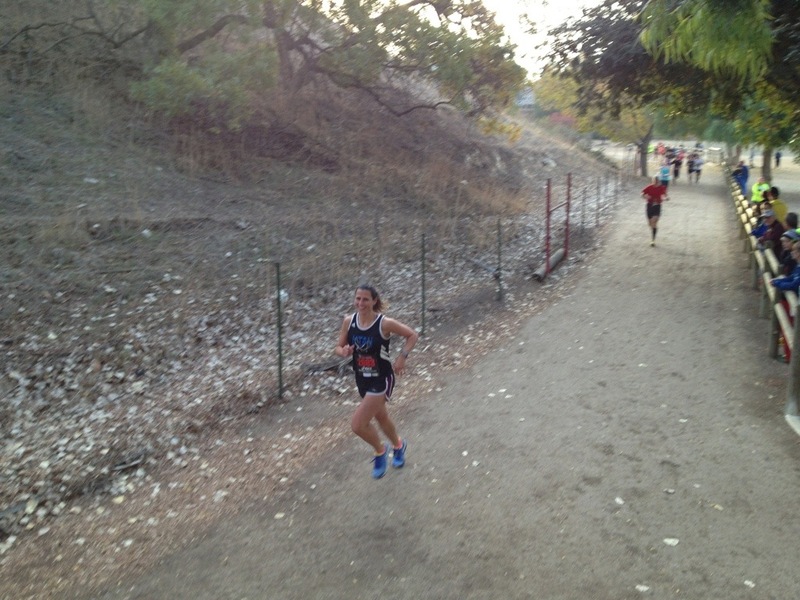 I finally finished with a time of 2:48.43 (I believe)… A 6 minute PR but 5 minutes away from qualifying! A bitter/sweet race. As I was finishing I heard my parents cheering me in. 🙂 I looked over and it was so good to see my dad give me a thumbs up sign. At that time I was feeling so down, so it did put a smile on my face. 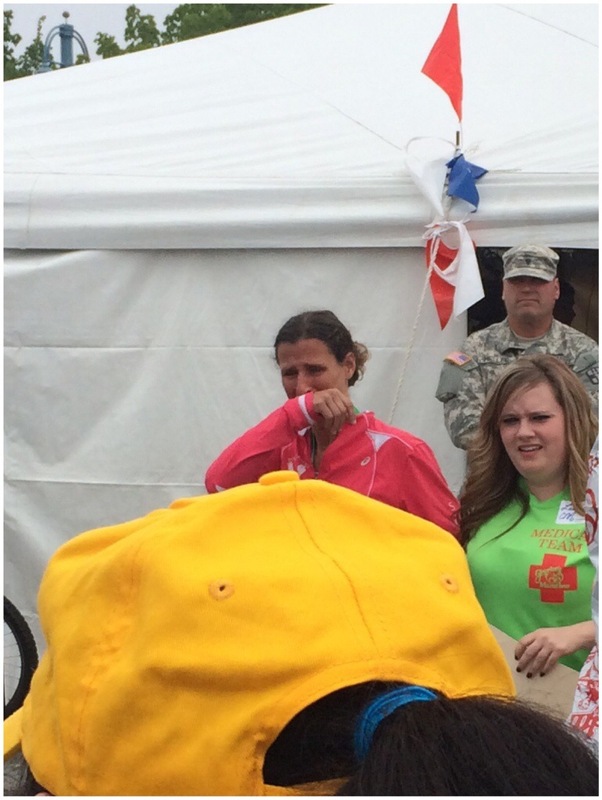 I was able to find Amber G. and Emily J… Emily was so sad about her race. 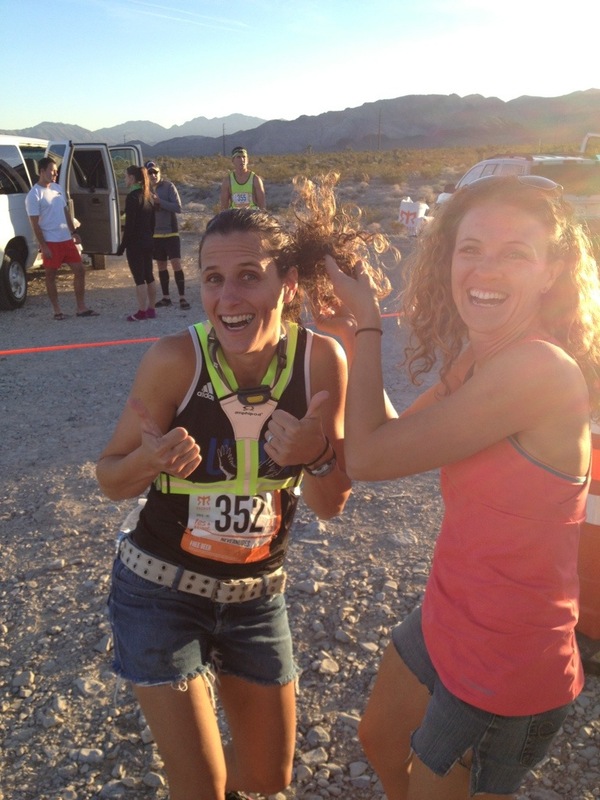 She had to pull out at mile 17 and Amber was 43 seconds short of qualifying. So bummed for the 2 of them!!! We were all happy to have had the opportunity to be with each other and to get to know each other. But it is so hard to train so hard for 1 race and not have it come together! Very emotionally draining. I was happy to be done but wish I could go back to the last 4.2 miles (but don’t we all). I had a great support system and was around amazing people. 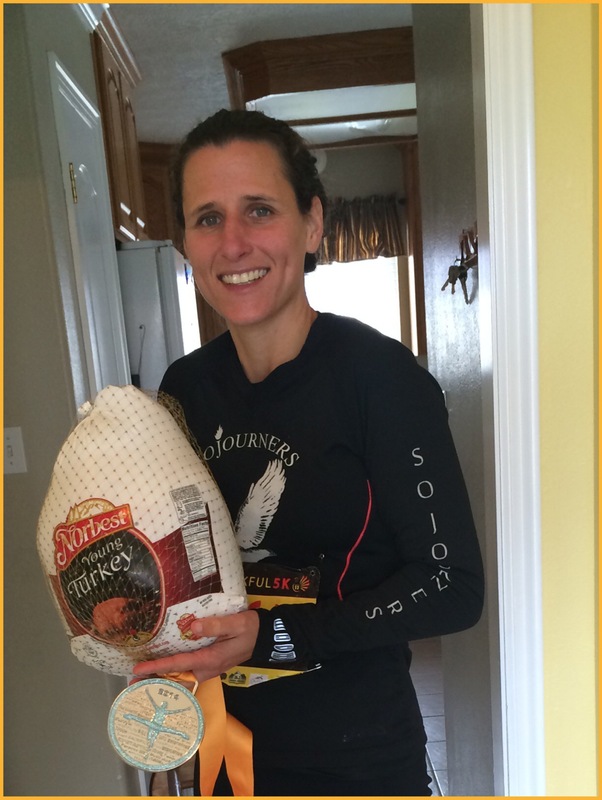 I love the Thanksgiving runs! 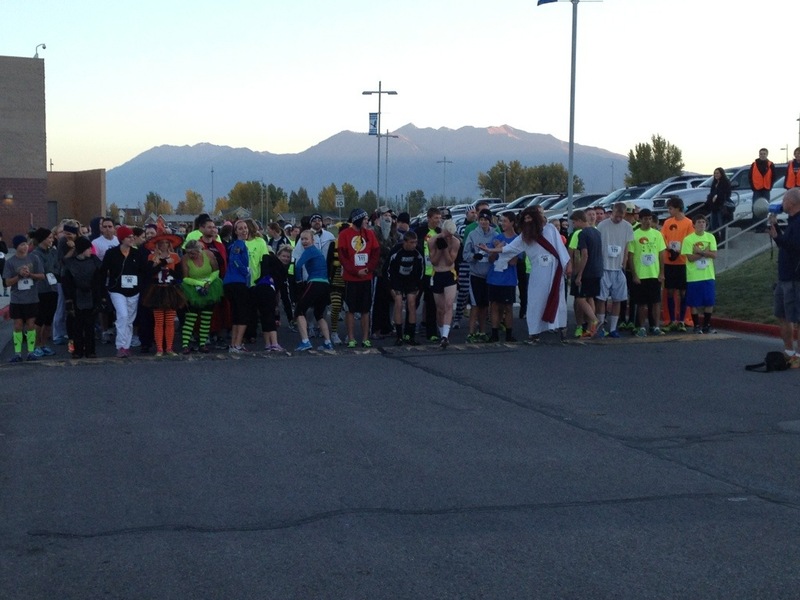 I started off my morning with a 5k race. I ran a 13 min warmup before the race started. I finished with a 3.2 mile cool down in 24:52 (a 7:44 pace). I felt great for the race but before and after I felt un-smooth. I know that doesn’t make sense but it does to me. 🙂 I ran a total of 8 miles today. 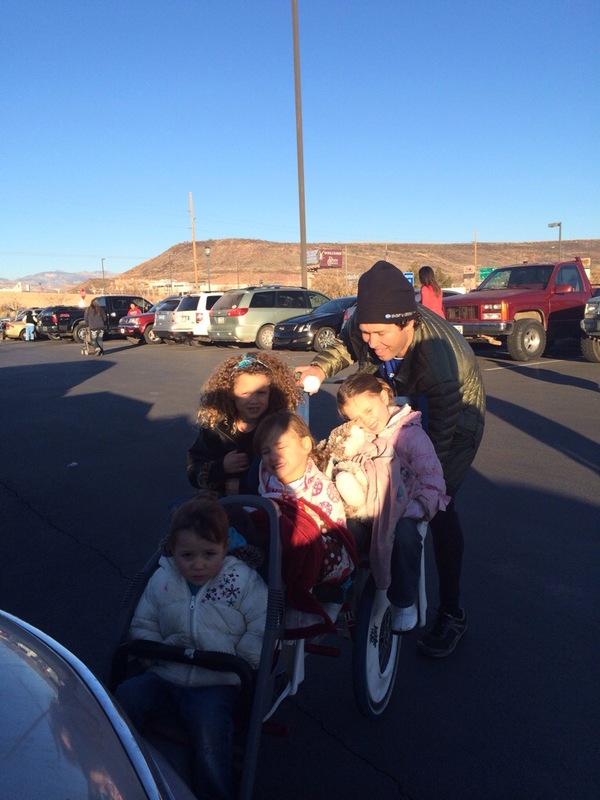 At around 8-8:15 p.m., the Barney’s came and picked me up and we headed off for St. George. 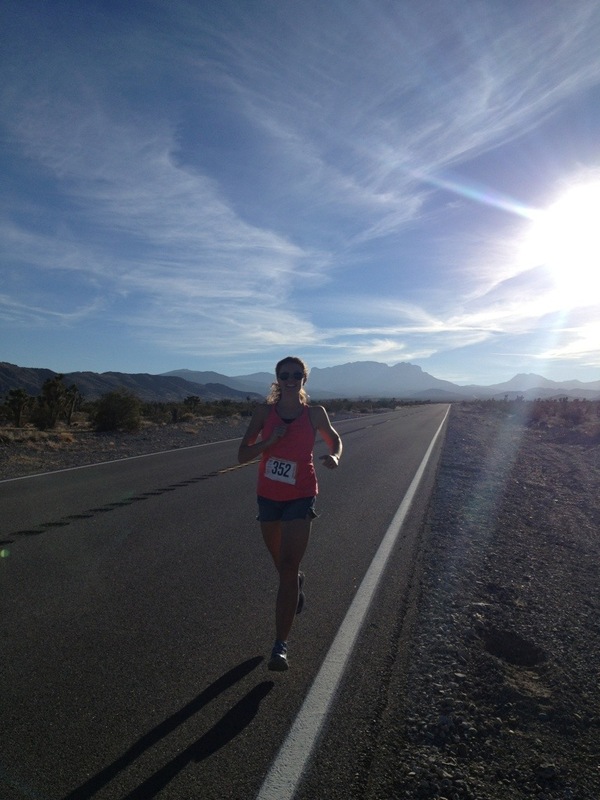 Megan and I are running a 1/2 marathon in the morning (Snow Canyon). Her husband is coming for moral support and Corom decided to stay with the girls because having to pay a babysitter is too expensive! 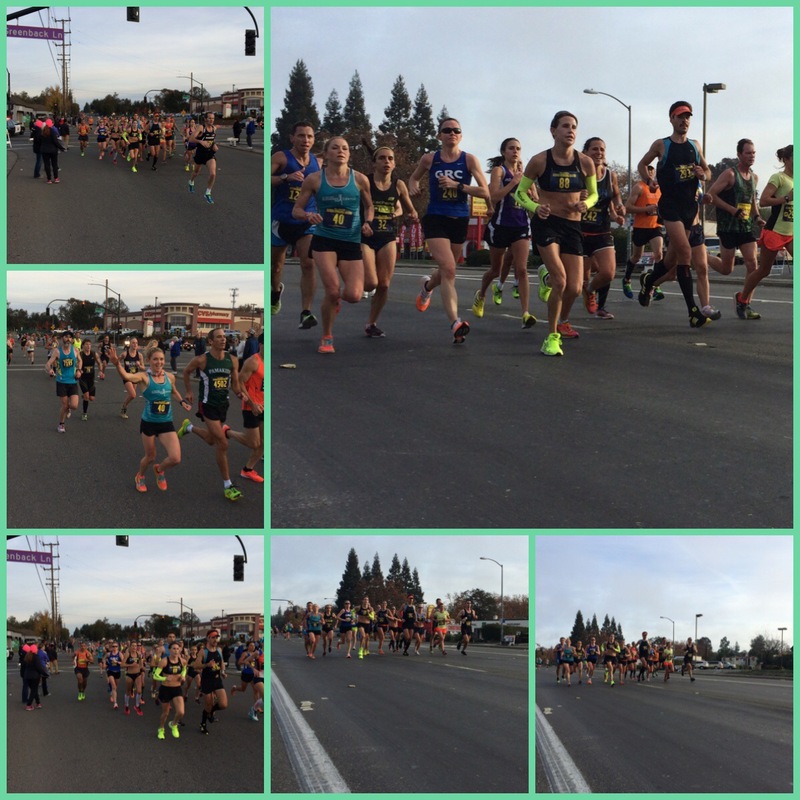 This was a great race for CIM… I just hope I can hold on for another 13.1 miles. We shall see! 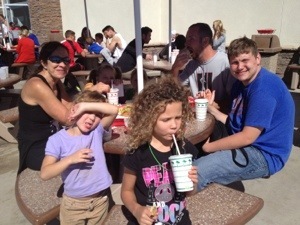 The Barney’s, and Megan’s sister & husband and I went out for lunch, then we headed home. It was a fun trip. 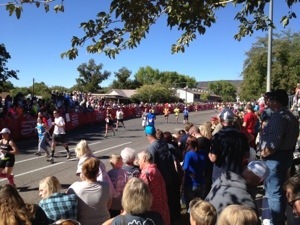 St. George marathon!!! We (Mike, Corom and I) woke up at 4:20 a.m. to get ready and load the buses. Amy was up with our girls at 5:30 :/. 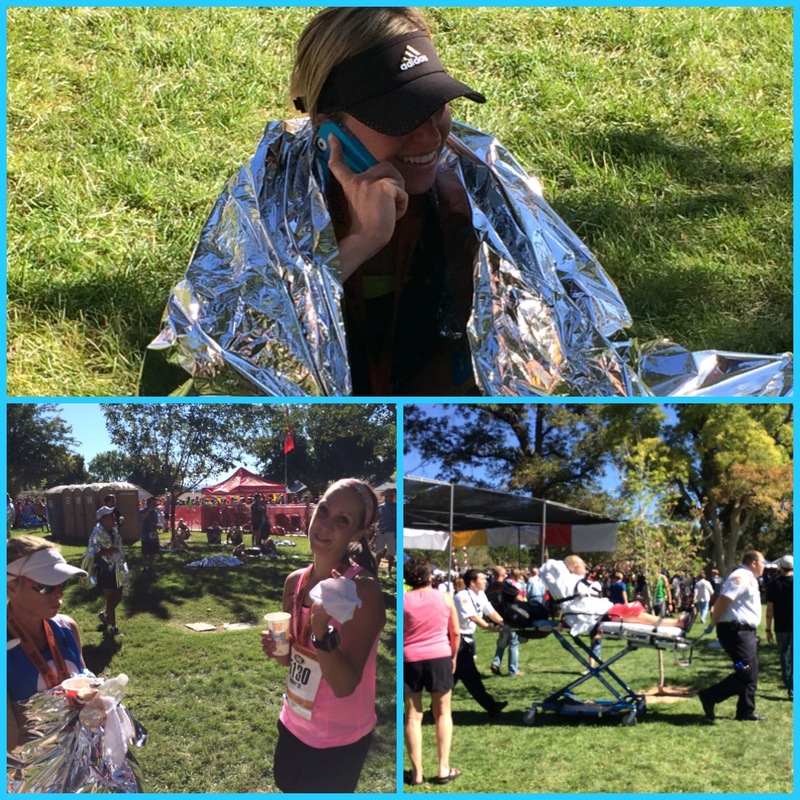 I was not stressed at all this morning… Today I decided I was not going to race the marathon. My race in December is way too important to jeopardize for the wanting to race this one. 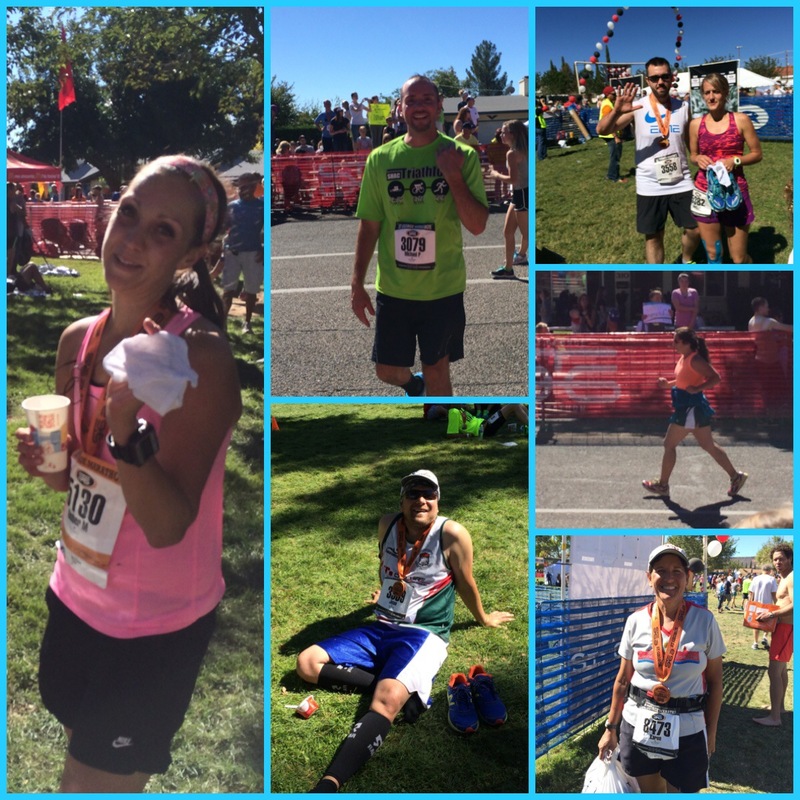 So I used it as a long run (I was supposed to run a 21 miler… What’s 5 more? :)). 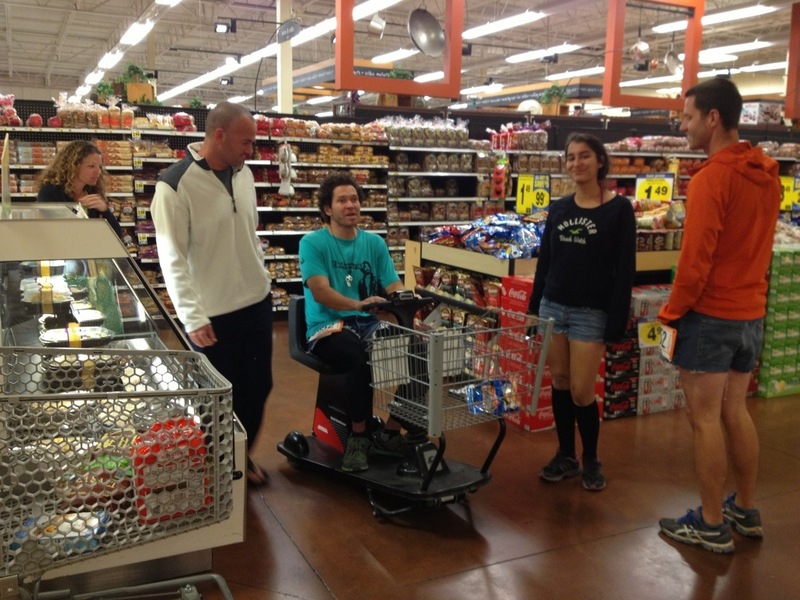 I will admit that at the starting line, it was extremely hard for me to not go out fast. I even battled the urge to “race” up until mile 8 or 9. 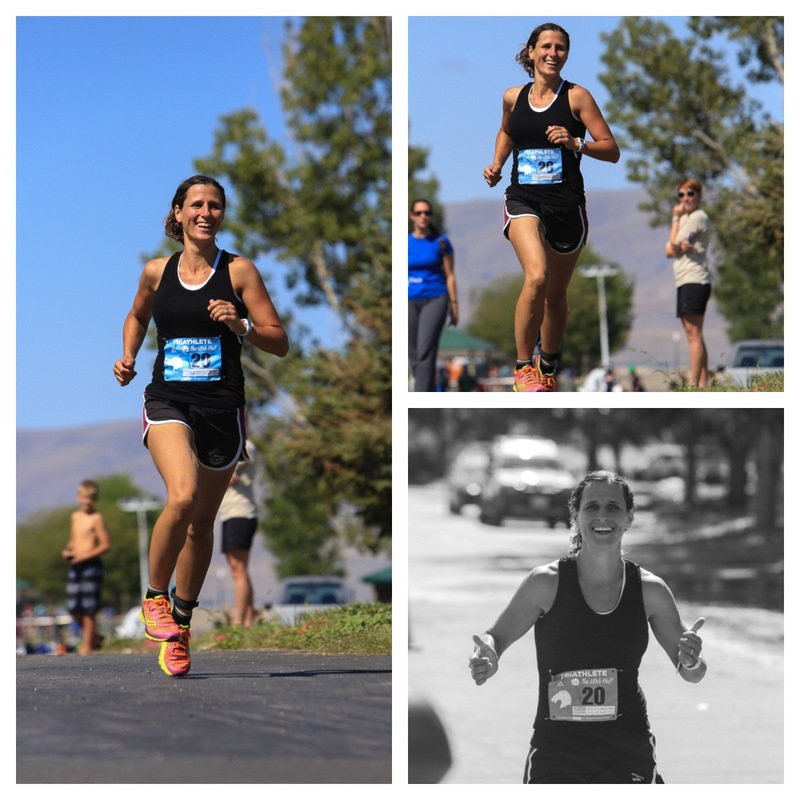 And even when I hit the halfway point (13.1) I had the same itch to want to race… So at the beginning, I started at a 7:15 pace and eventually got up to a 7 minute pace. The last couple of miles I picked it up and finished off with a 3:02.38. 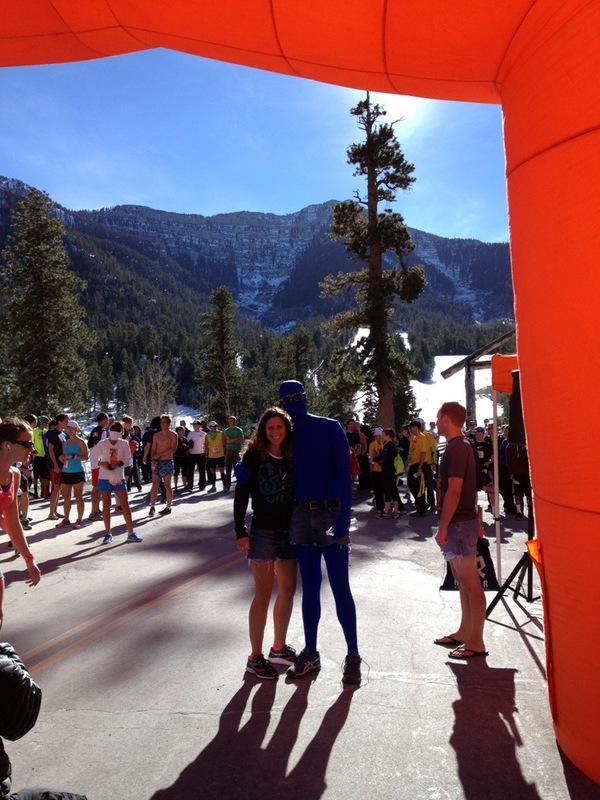 I carried my phone with me so I would be able to take pictures and “relax & enjoy” this run. I felt really good during and after the race. 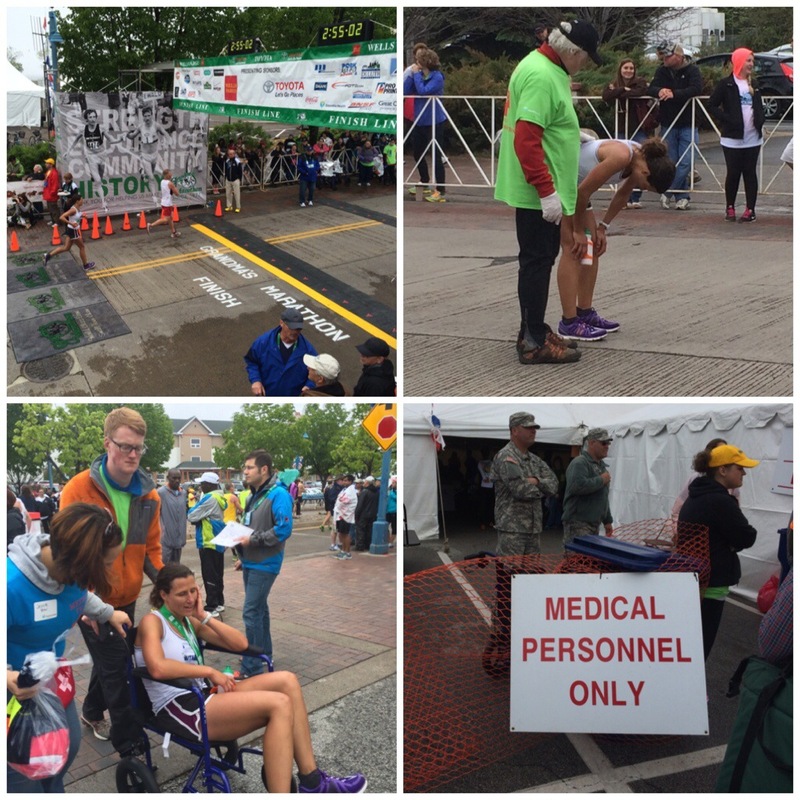 Yes I was sore and tired but not as sore as I usually am after a marathon. I am hoping this run won’t set me back… Come Monday we shall see! 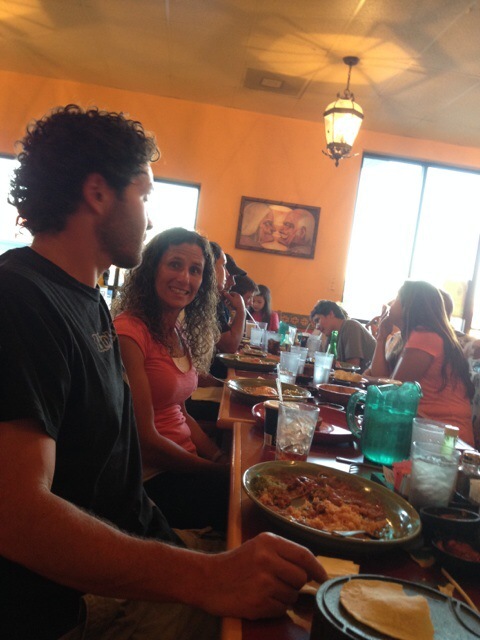 I watched Corom, Mike, Sarah (my mother-in-law), the Booths, & all my running friends come in. Many of them had great races (Beth broke 3 :)) and some did not. For Corom… Not so good, but he doesn’t train!!! So without training it’s not too bad! (Weird :)). Good times. 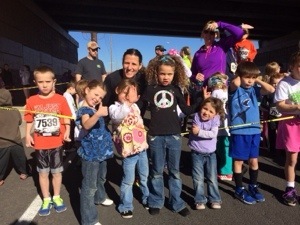 Amy, her kids and my kids, Yolanda (Corom’s sister) and her family all came to hang out at the finish line. After, we (the Fullmer’s and us) went back to the place we are staying at, relaxed as much as we could (as much as our kids allowed), then met up with Yolanda and Sarah (his mom) for dinner. 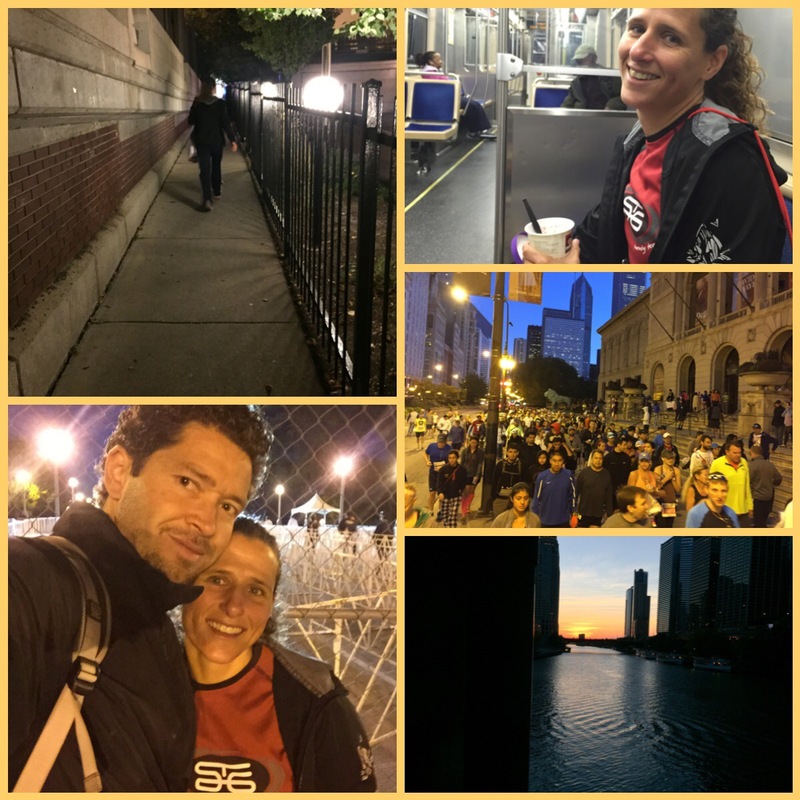 I am so glad Corom arrived home at 3 a.m. That means I was able to go race in a 10k… The Powerhouse 10k. Rachelle, Amber and I ran a 3 mile warmup together and then they ran to the 5k starting line and I ran up to the 10k starting line. I ended up running another 2+ miles to finish off a little over 5 miles in 40:03. 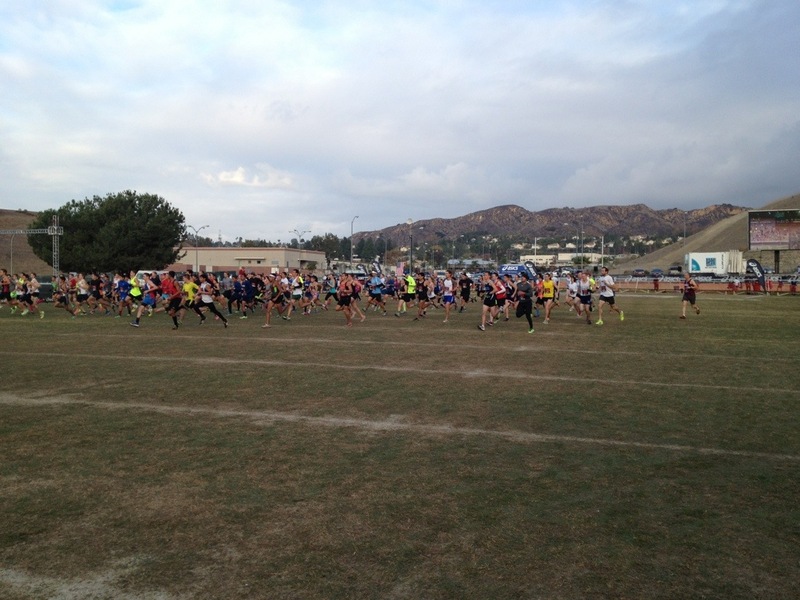 Then began the race… Right from the beginning, a college red shirting female runner took off. I could not keep up with her so I made sure I could always keep her in sight. It was a fairly fast course! 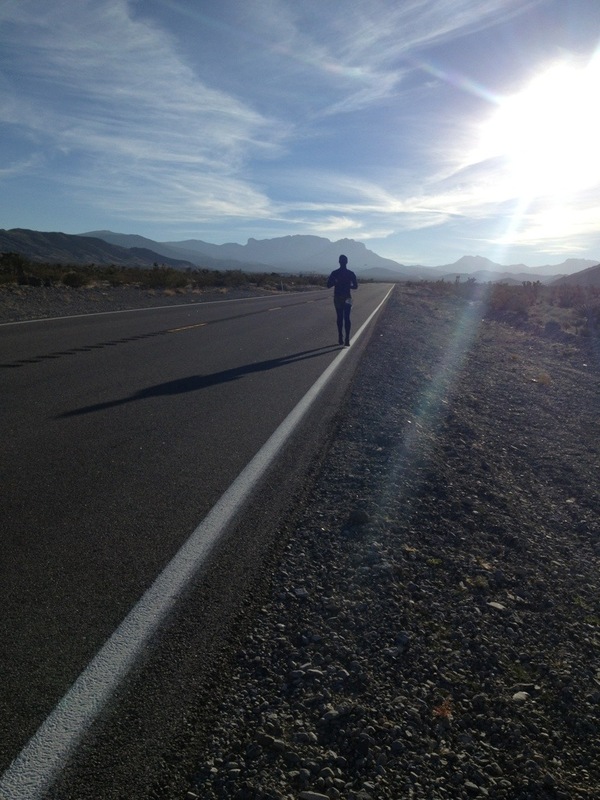 For the 1st few miles, I kept thinking, I am tired right now how am I going to be able to hold this pace for 26 miles. 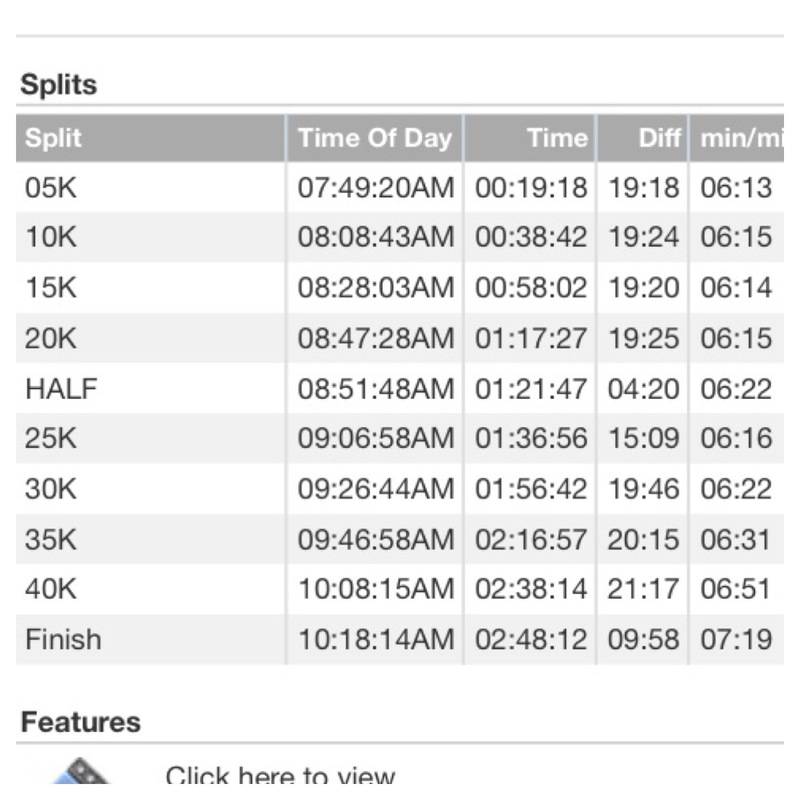 That changed quickly when we reached the half way point… It was a 17:38!!! I finished the 10k with a huge PR (personal record)! I ran a 36:01.9! 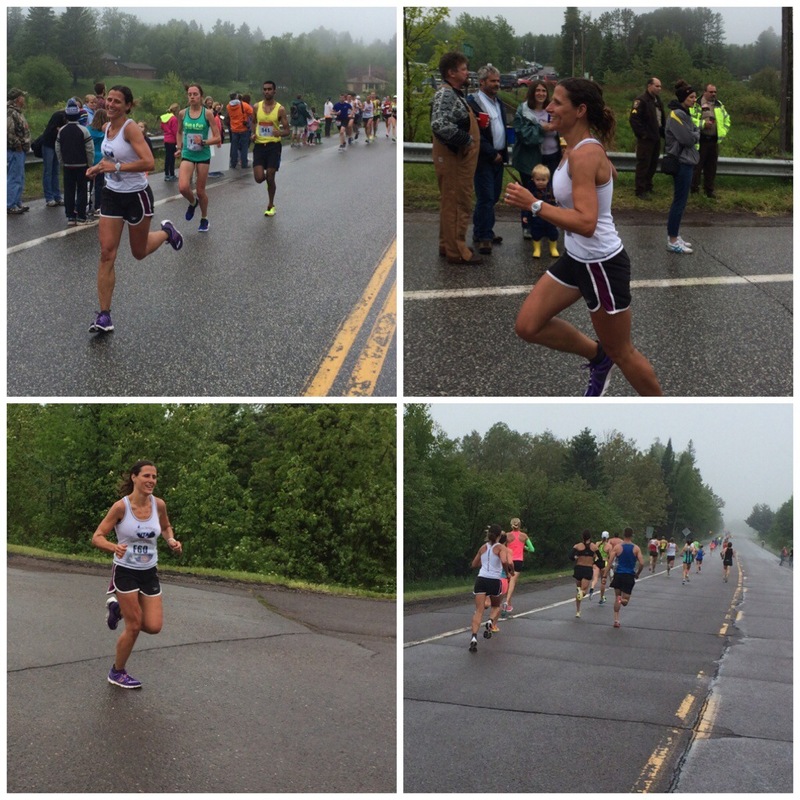 I have never been in the 36’s for a 10k… So yes, I was a little happy about this race. It was a 5:49 pace I believe. 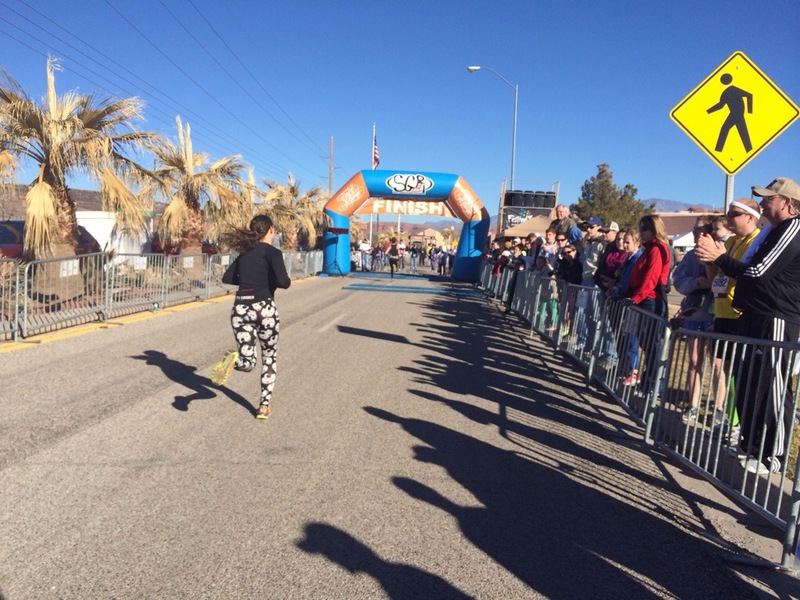 The female ahead of me ran a 35:23… Amazing! Towards the end it began to rain on us and then pour. Loved it! 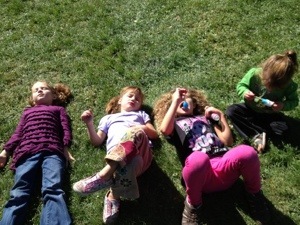 We ran a 2.2 mile cool down, totaling today’s run at 13 1/2. I felt good… Tired but good. 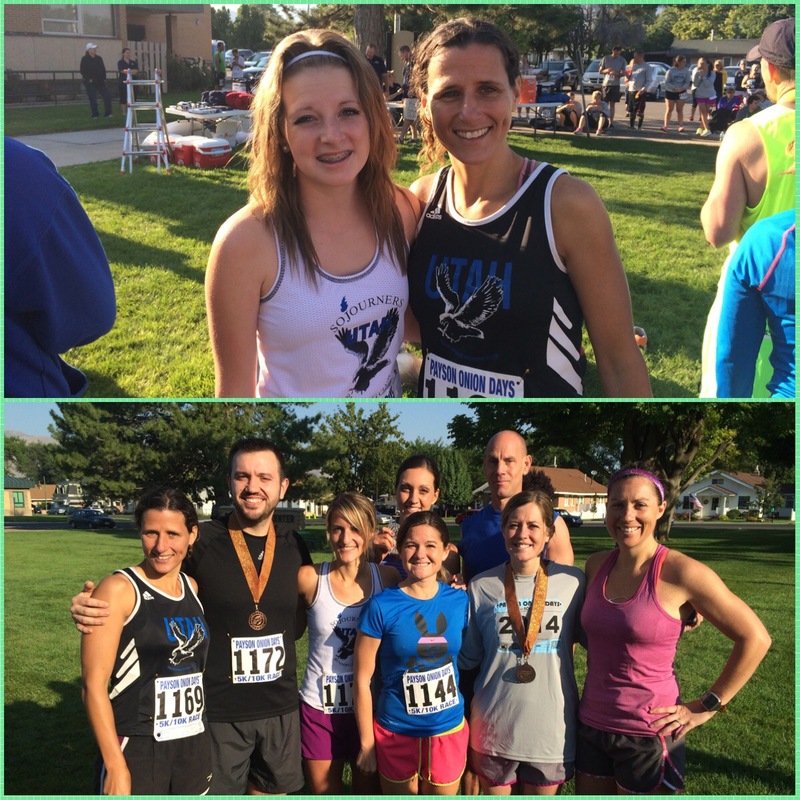 Another race morning… The traditional Labor Day Payson Onion Days 10k. I run this race (or the 5k) every year. Even though, I wasn’t in the mood to run the 10k this morning, I had to do it for traditional sake. 🙂 I chose the 10k over the 5k just for the sole reason of it being a better workout. Well as we lined up at the start, I looked around and saw many women that made me nervous and regret my decision to not sign up for the 5k. 😉 During my race, I did throw in a few surges on the other female competitors to throw them off mentally. I was just as tired but I didn’t want them to know it… Oh the mind games. I felt good up until mile 4. I held my pace but it was tough to finish the last 2 miles on a slight uphill! 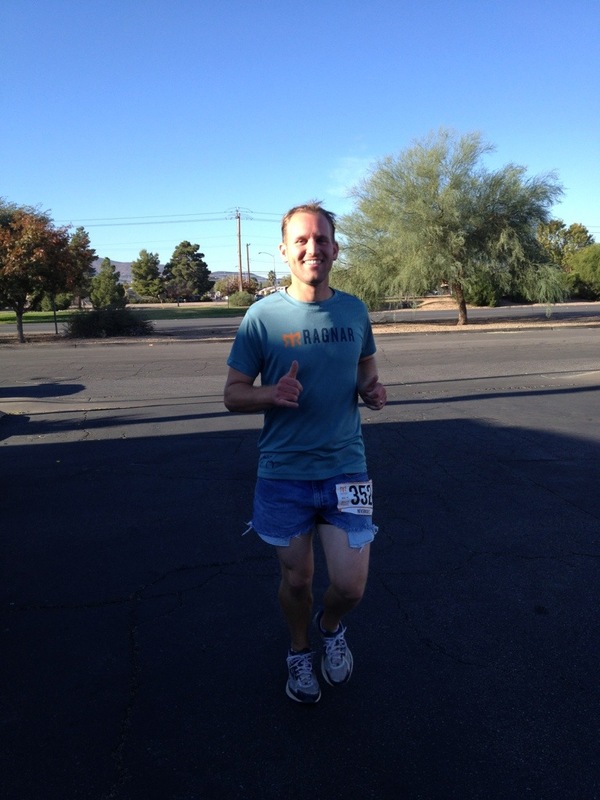 I finished my 10k in 38:14 and placed 1st overall. 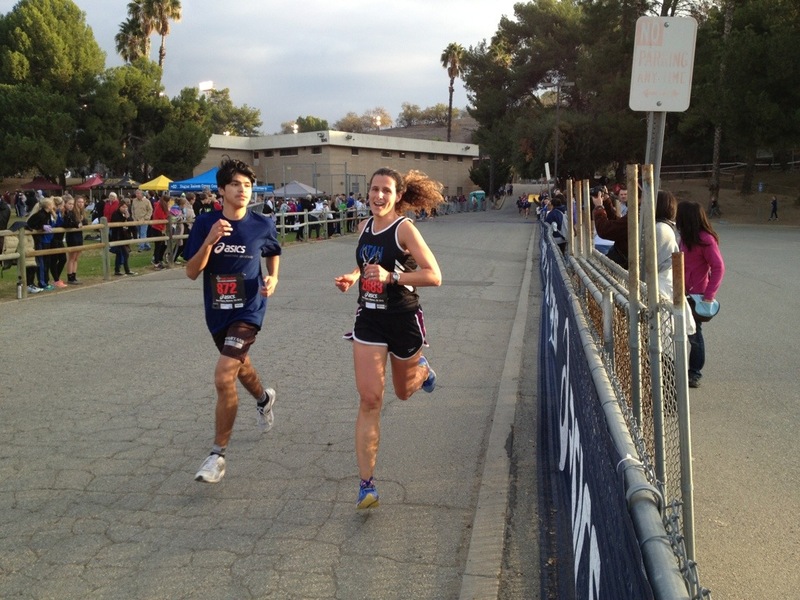 I’m glad I ran the 10k and I was even happier when it was over. For real.. It wasn’t that bad. I ended up running almost 10 miles total… 2 miles before and almost 2 miles after. Good run! I woke up early, early this morning, not because of a run but because of a major thunderstorm. 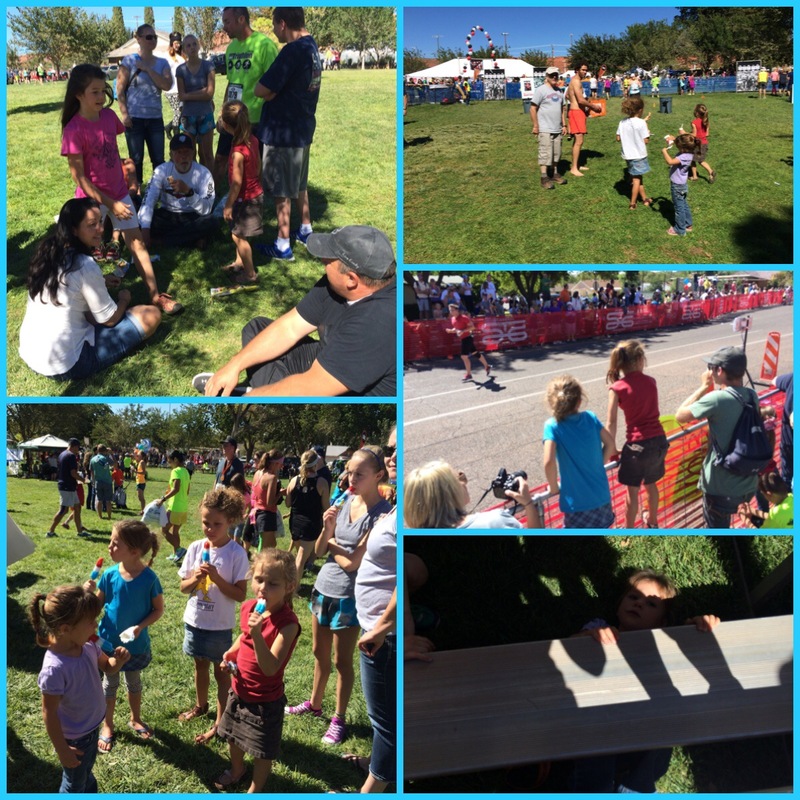 It was pretty amazing… But I did worry about my race. 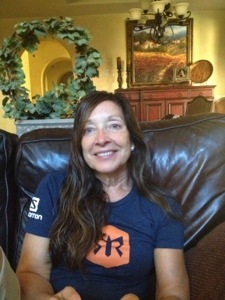 I am running in a relay for a half iron man. I showed up in time for the swim to start… But because of the weather, it was delayed by an hour and 20 min. 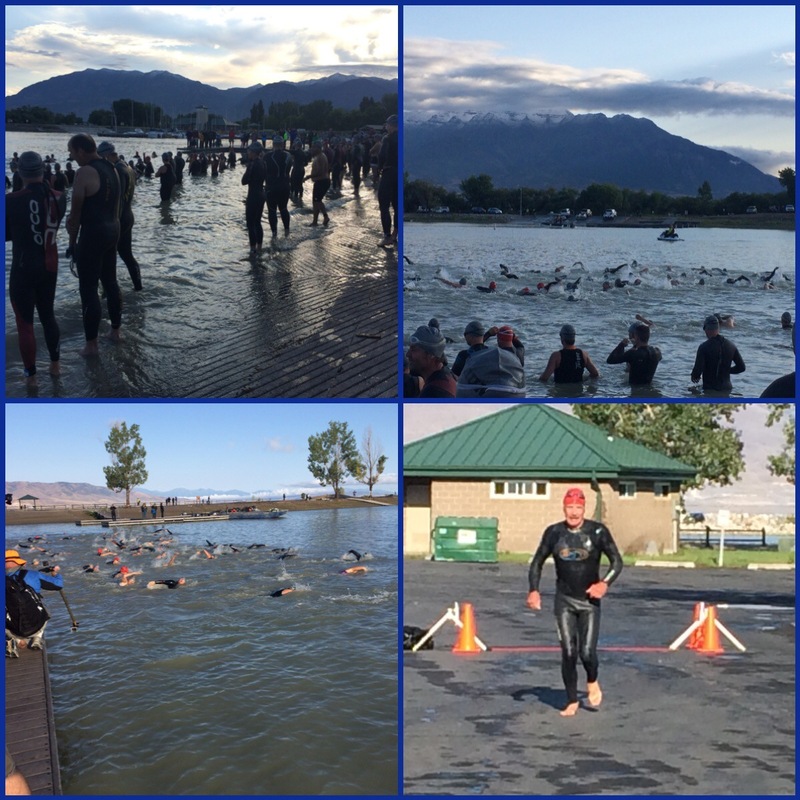 My old boss from Sundance Ski Resort (70 years old) started off with the swim. He is an amazing swimmer! 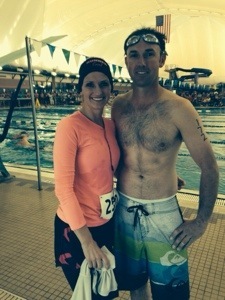 We started with the Elite group and all the other relay teams… It was a mile swim and He came out of the water 6th! (He was a talked about man this morning.) He ran into the exchange station and handed off the ankle chip to his daughter-in-law, Megan. She, too, is a phenomenal biker. 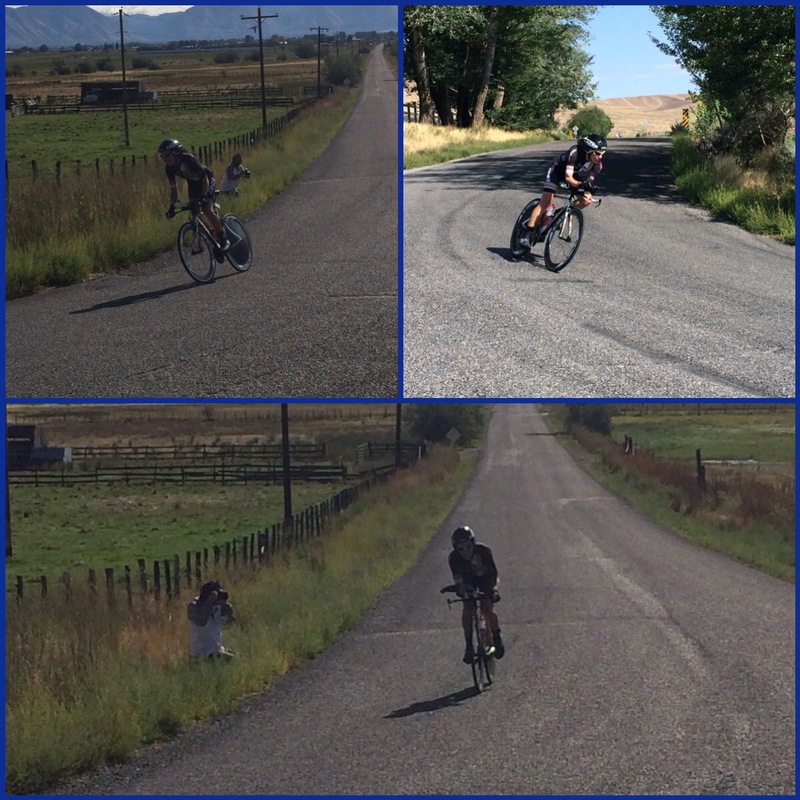 The top female cyclist in Utah. She took off for her 56 mile ride and held on to her spot. She was cruising!!! 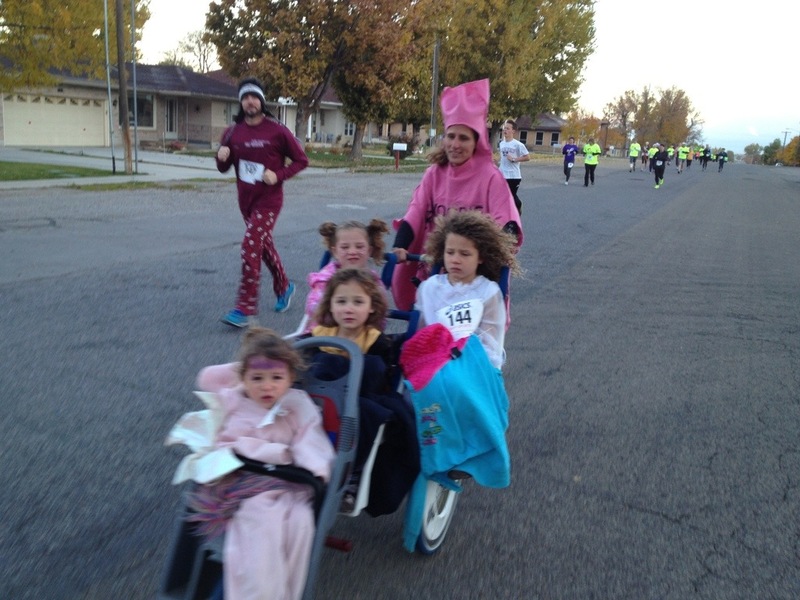 As you can see, no one was behind her… She was able to move with the other 5 or 6 teams ahead of her. She finished her leg and handed off to me. I ran 13.3 miles (a tiny bit more than a half). 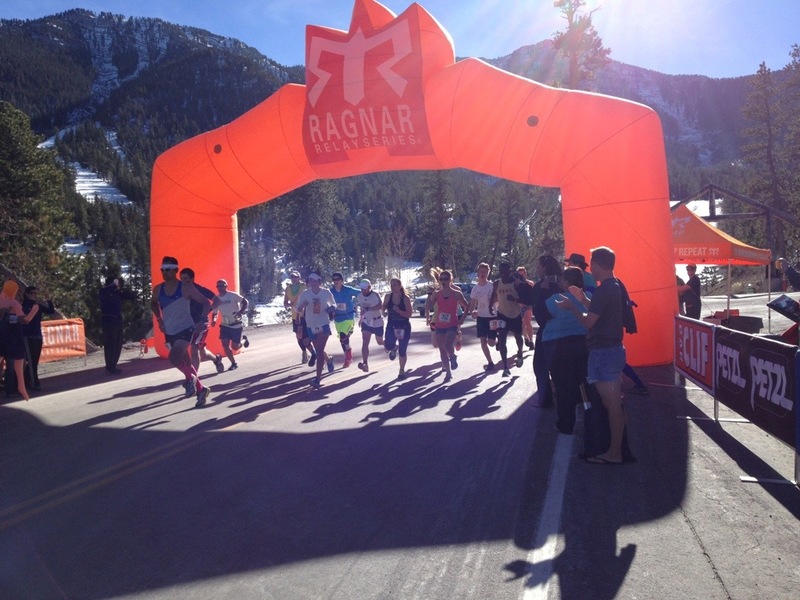 It was good weather, they had aid stations everywhere, and it was a fairly flat course. I felt really good the 1st loop (6 1/2 miles) and was able to pass a couple of the guys. On the 2nd loop I was a little more fatigued. But I held my pace. I caught a couple of more guys and headed into the finish. They did so good. It’s fun to watch them run these races and enjoy them. 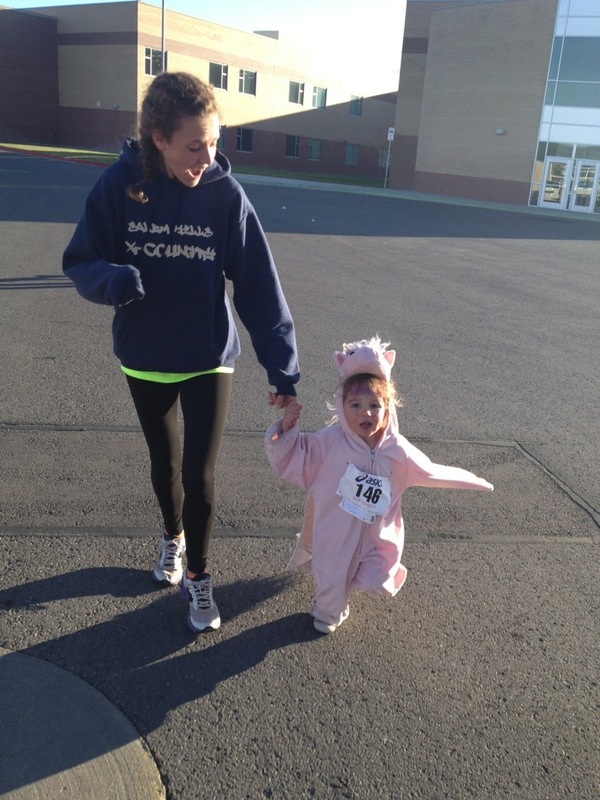 Corom and I ran the 5k right after. He pushed all 4 kids in the stroller. 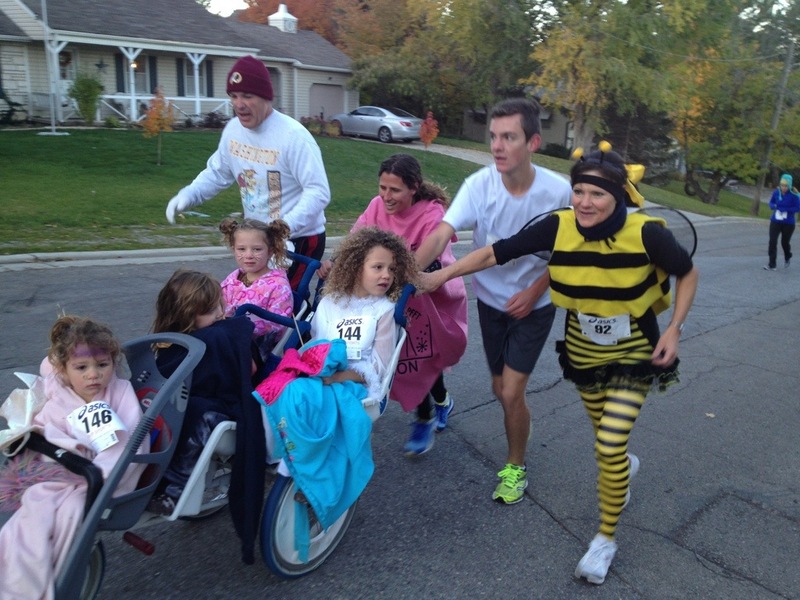 That is a tough race pushing a stroller! 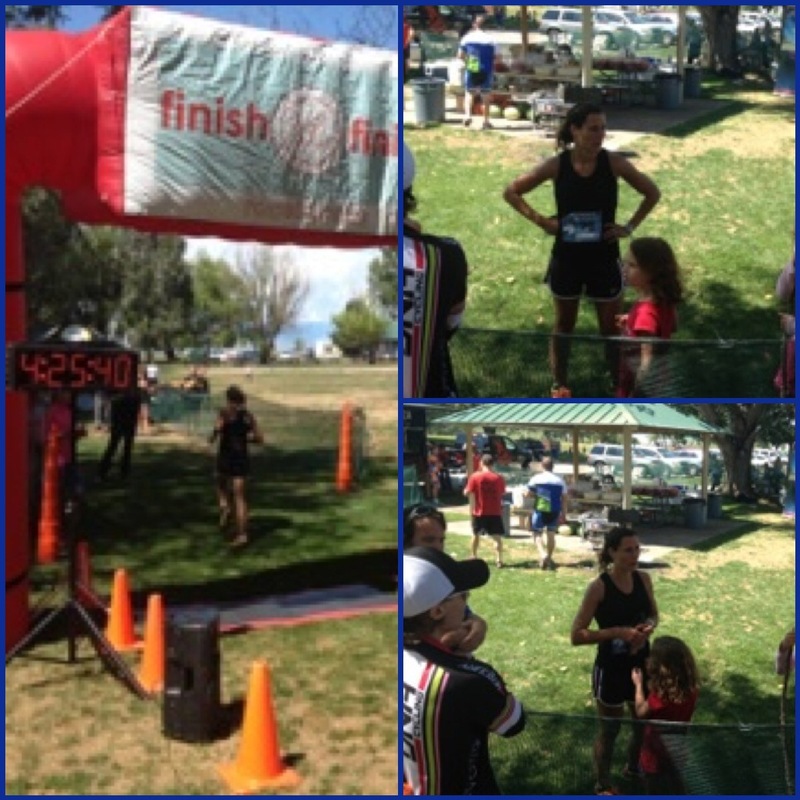 My oldest came in ahead of the other 3 and took 3rd in her age group. 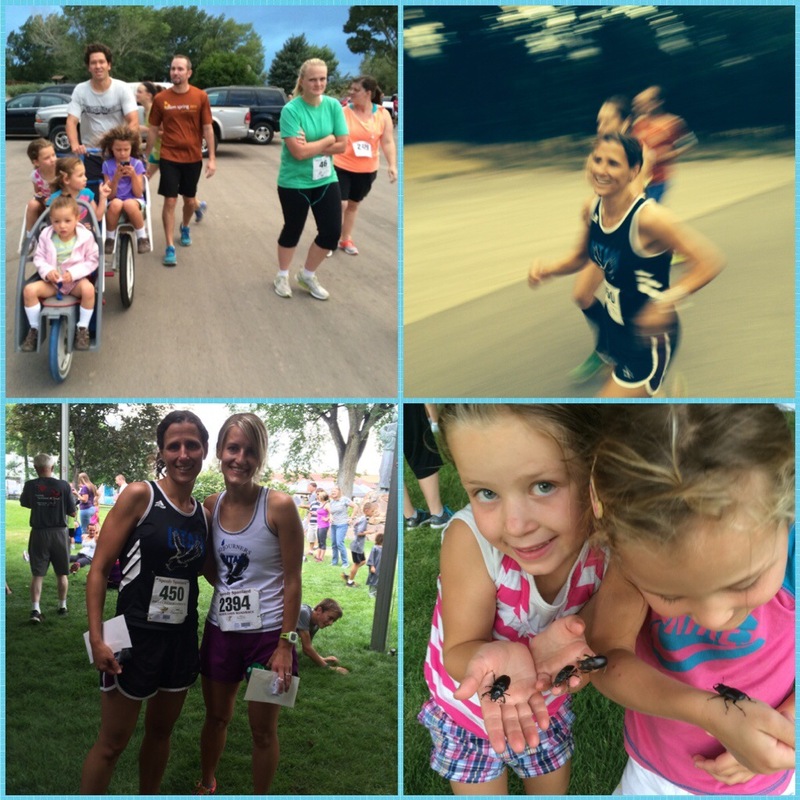 My 2nd child took 1st in her age group; 3rd child took 1st in her age group; and 4th took 4th… Corom placed 3rd in the stroller category and I placed 1st overall in the 5k. I woke up this morning with a little more nerves than I normally do on a race day. I don’t know if it was because I have not raced for a little over a month, or if I was not mentally or physically prepared or in shape for this… But I had to do it because it is tradition. The 24th is a State holiday here in Utah. It is Pioneer’s Day. It was a fun 10k run. 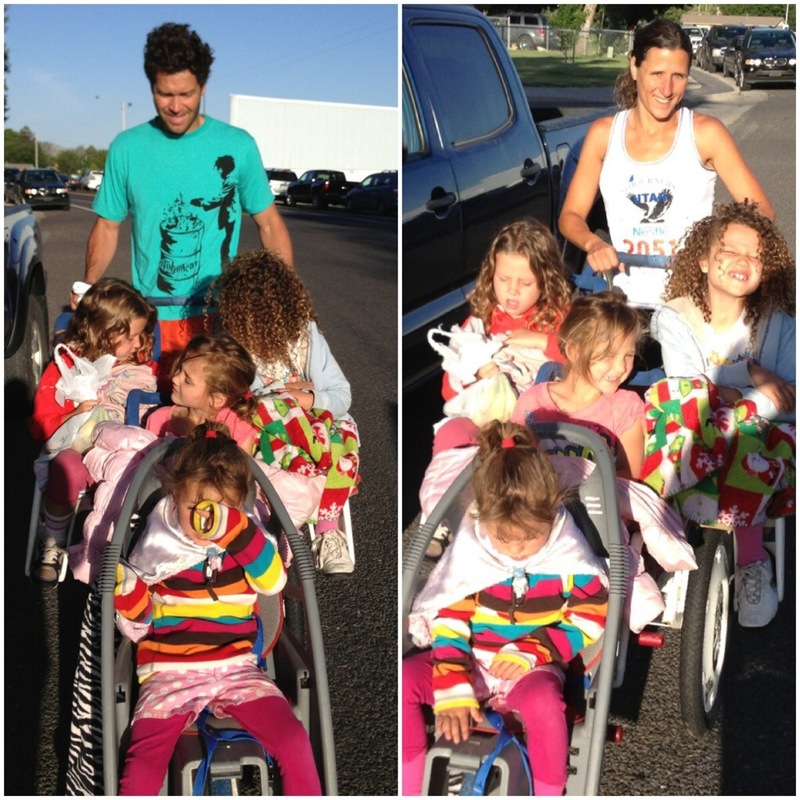 Corom (and Mike Fullmer) pushed the kids in the 4 kid stroller. I was able to race it. My 1st mile I felt really good. But come the second mile heading into the 3rd, I mentally started to think negatively. I remembered how tired I was for the last 10k of my marathon and it really mentally affected me (I know that sounds weird). I pulled it together for mile 4 and 5 but mile 6 I was tired! 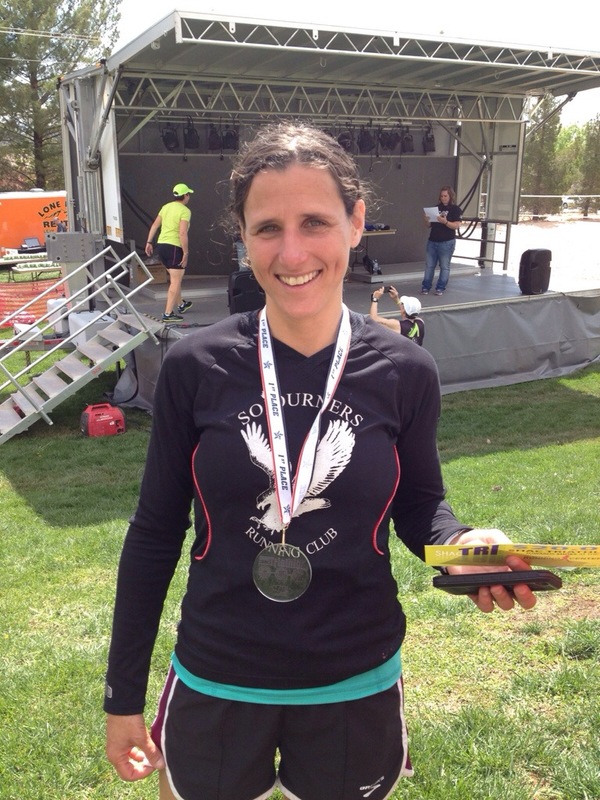 I did hold onto a 6:10 pace (my marathon pace :/) and finished off with a 38:23 10k time. It was a minute slower than last year but I know that training for a marathon is so different than the faster 5k, 10k races. 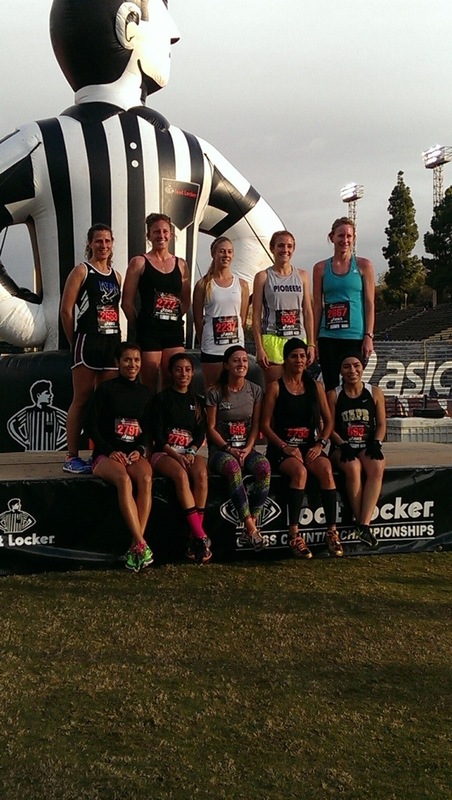 I have realized that my 5k-10k races are not as fast but I am ok with that. 🙂 I did take 1st and won $50 cash. That was a bonus. We had a good group of women all going for the same goal. 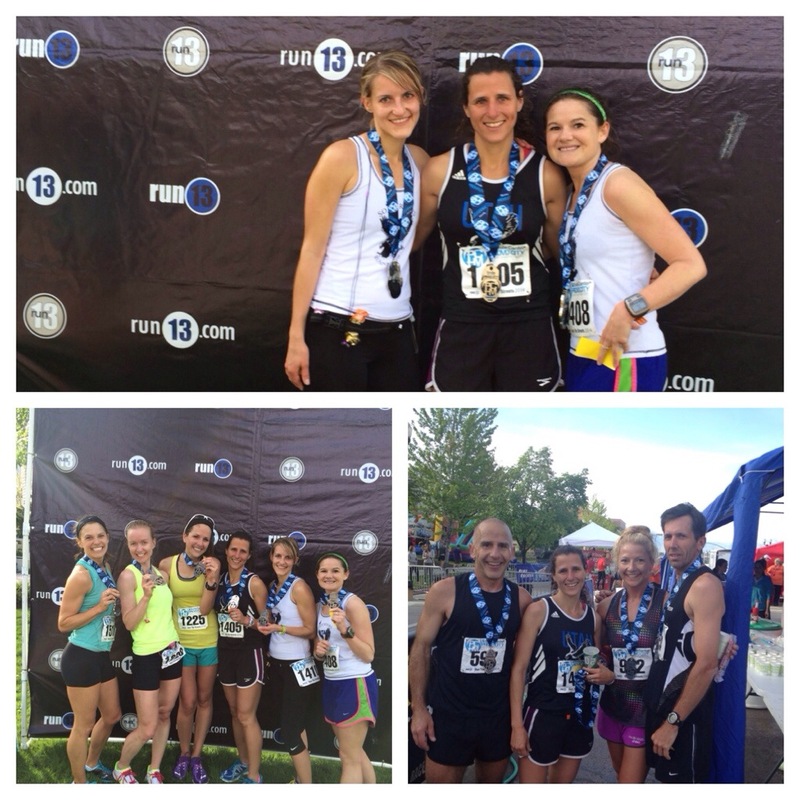 My 1st 10k was 38:26, my 1/2 marathon was 1:21.46, & at 19 miles I ran a 1:56.33. Then it hit. 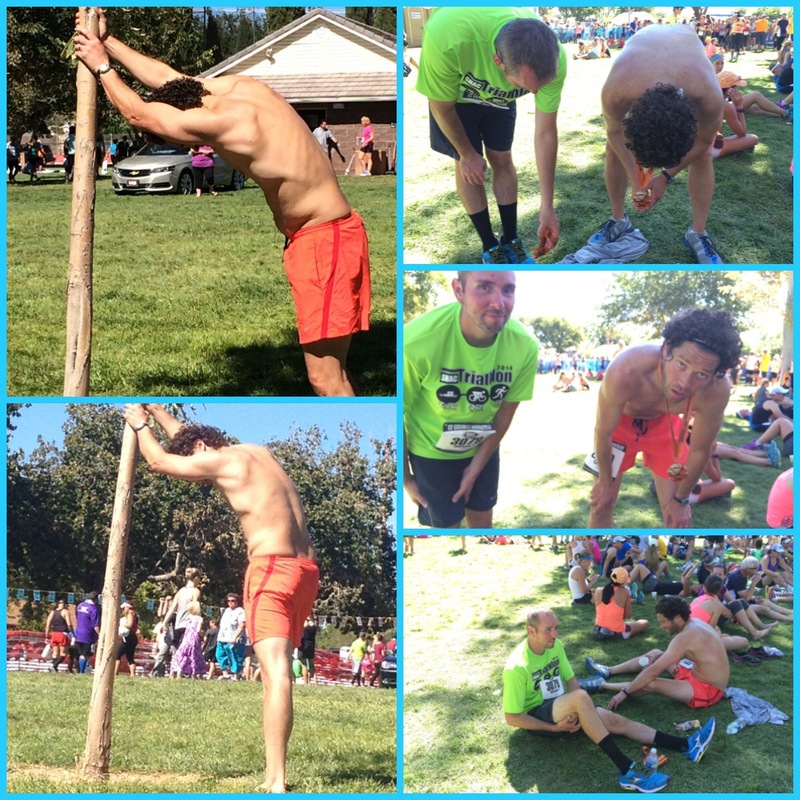 I began to feel a little light headed and I couldn’t get enough water at the water/aid stations. The second I ran past the water station I was wanting more. As I stated earlier my legs just felt like they stopped working. Oh I forgot to add that within the 1st 2 miles I accidentally dropped my shot blocks and at mile 7 where I had my 1st bottle of XOJO at the “elite” table, I missed grabbing it. I kept thinking, ok, no big deal… I had a gu and a caffeine strip left. I took my caffeine strip at mile 11 and it was great!!! I wish, wish I had another strip for mile 19! (But I know that caffeine can make you more dehydrated :/). Anyway… The weather was great today… Perfect temperatures and a fog coverage. The humidity was 93%. We had a very light head wind but nothing big to hold you back or effect you (it was 2-5 mph). It was beautiful out and being in this atmosphere was magical! So many excellent runners trying for the same goal! So why did I crash so hard and so sudden? I felt dehydrated and I didn’t have enough food/calories. I didn’t drink at all this morning and I couldn’t stomach down a decent breakfast. Yesterday I didn’t drink to much either… To be honest, I was afraid I would have to go to the bathroom while I was running! Dumb, right! I’m going to break up my last 10k… The 1st 5 miles of it was about an 8 minute pace. But at mile 24 and 25 I kept blacking out. I would be running and everything would start to spin around, I wouldn’t be able to see (I’m guessing for about 1 to 2 seconds), so I would have to shake my head to see straight. 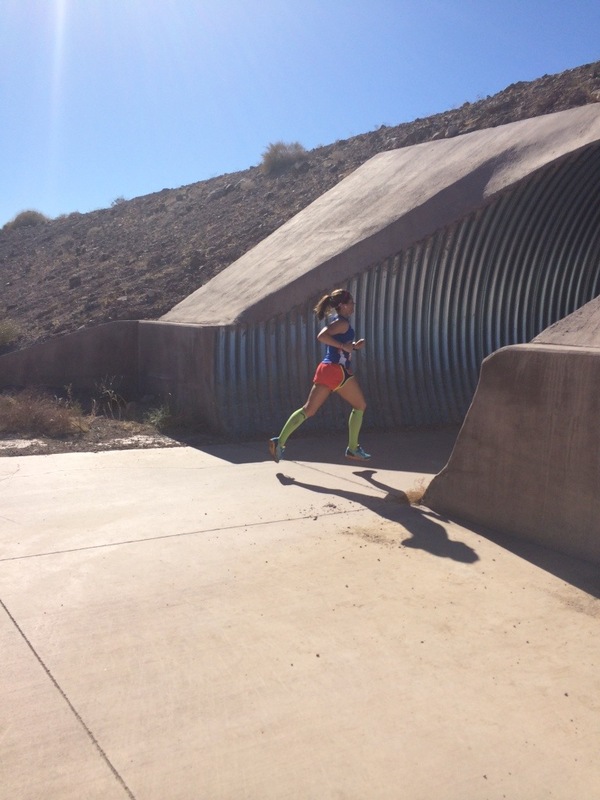 It was the weirdest feeling because I knew that I was not doing well but my body/legs kept moving forward. I felt like I wasn’t really there but yeah… It is really hard to explain. My last mile was a 10 minute mile. I finished and one of the volunteer helpers ran over to me… Right when I leaned on him my legs gave out and I pretty much dropped on him. I was so dizzy and couldn’t see straight. 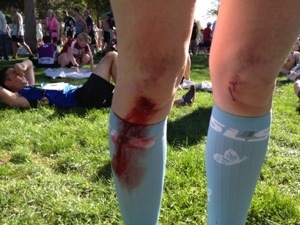 Oh why we runners do this to ourselves :). 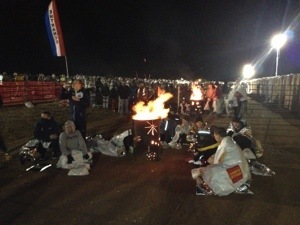 In the tent (which Corom was not allowed in), my legs, feet and back (even my ribs) starting to seize up-Charlie horse. It was so bad… Due to no water!!! I guess I was in there for 55 minutes with the medics and a physical therapist filling me with liquids and rubbing/stretching my legs. Oh and my feet hurt so bad when they took my shoes off! I was able to get up after that time and walk out without the dizziness and blackouts. Oh it was not fun!!! When I walked out… I saw Corom standing there and I just broke down! I could not stop the tears. Yes I was so sad and disappointed knowing that I was so close and felt so good. 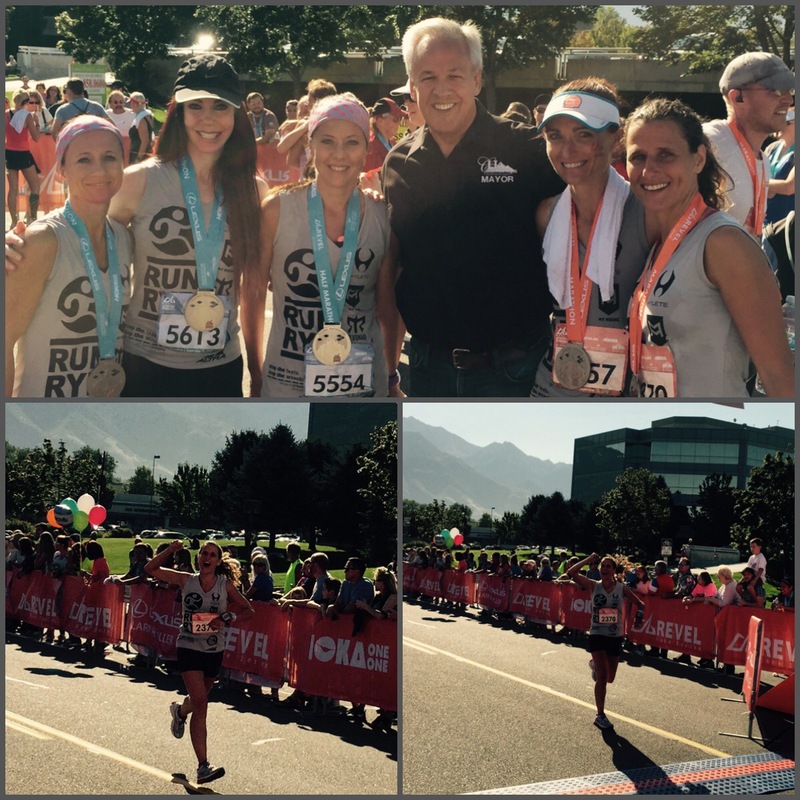 I really, really thought I had that Olympic Trials qualifying time! I really did… And to see it slip away so quickly (because it really hit me fast and hard), I didn’t realize how sad I was until I saw Corom! We hung out there for a while, Corom grabbing all the food for me to refuel (the lady in the tent gave me a slice of pizza…so good)… We eventually went back to our dorm room, I showered and then crashed into a good nap for awhile. Back to the morning… I did meet up with Amber Green. We rode the bus up and everything. She, too, was on pace. We were within a few seconds of each other until mile 20. She was able to keep going but also felt a little blah. I guess when I finished, that was the 1st question I asked Corom, was if she made the time. She barely missed it and I was truly sad for her. She deserved it!!! She is a strong runner and it was so fun to hang out/run with her. Amazing person! We will go to the trials together! The top 2 pictures and the bottom left were at the hotel where the “elite” bus picked us up. The bottom right is Amber in the blue tank top and pink shorts and I am in the white tank top a little behind at mile 15 I believe. Corom showed up at so many places during the course! 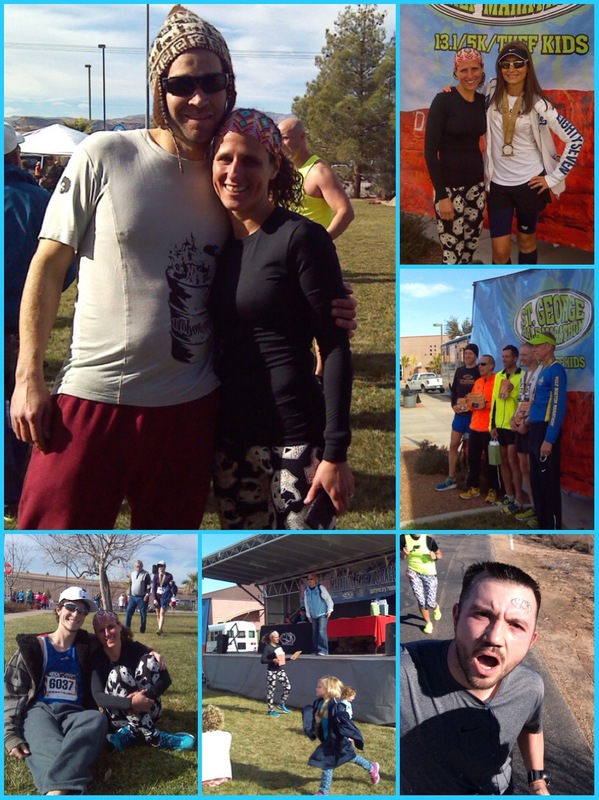 He was amazing and so helpful (at mile 21 or 22… He had “Sail Away” from Enya playing… Love that song)… Anyway, after my nap, Corom and I met up with Amber at the awards ceremony (amazing runners) and then we all went and grabbed Mexican food. Then we hung out after dinner for awhile and Corom and I headed back to the dorms. We have met so many great people here. A great experience here. 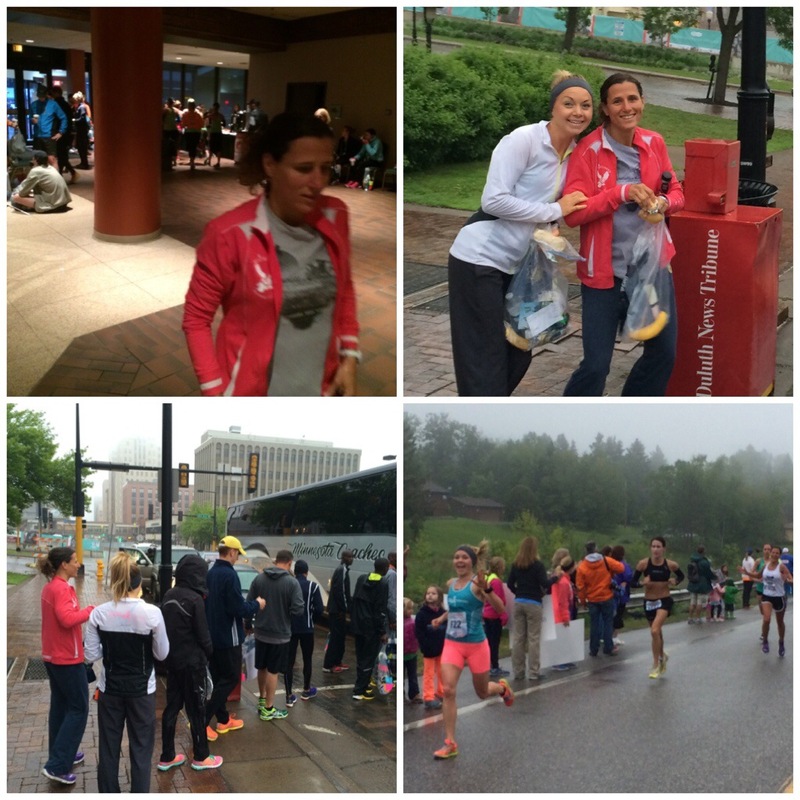 As I stated earlier… I am bummed about the results, but something did spark in me knowing that I can do it! I will take this experience and grow and use it as a positive!!! I am so grateful for everyone for supporting me and helping me through this!!! 3:35 a.m. came around way too quick! 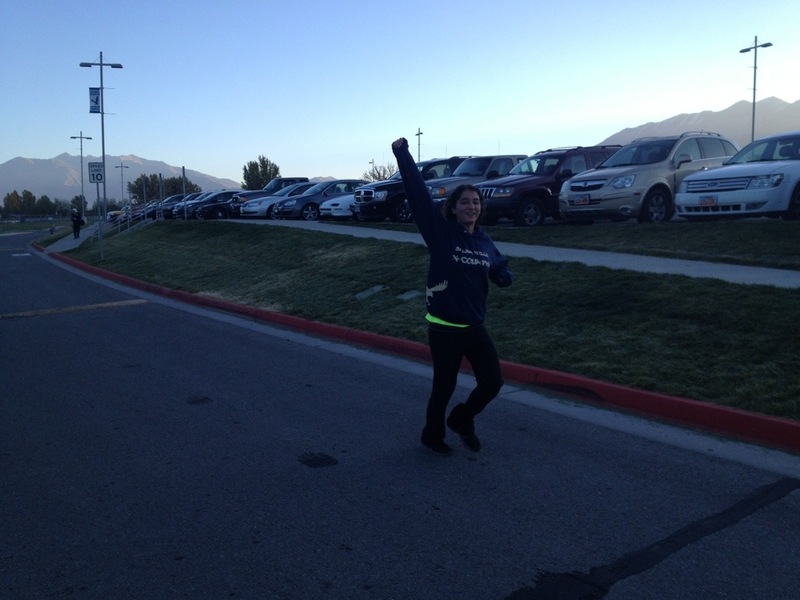 I grudgingly got out of bed and proceeded to get ready for the Utah Valley 1/2 marathon. Amber came and picked me up and off we went to catch the bus at 4:10 a.m. 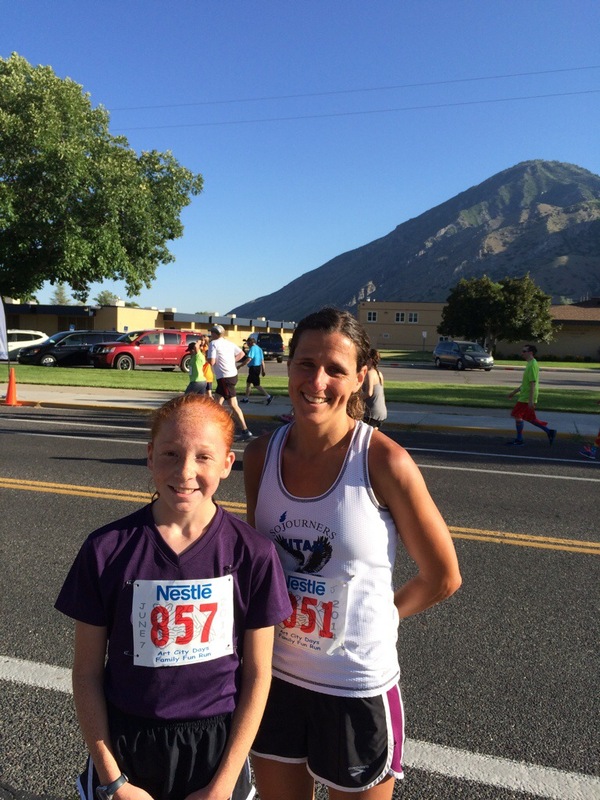 I was excited to run this race because I was running with my friend Amber. There was no pressure of racing today and I was able to enjoy the run. 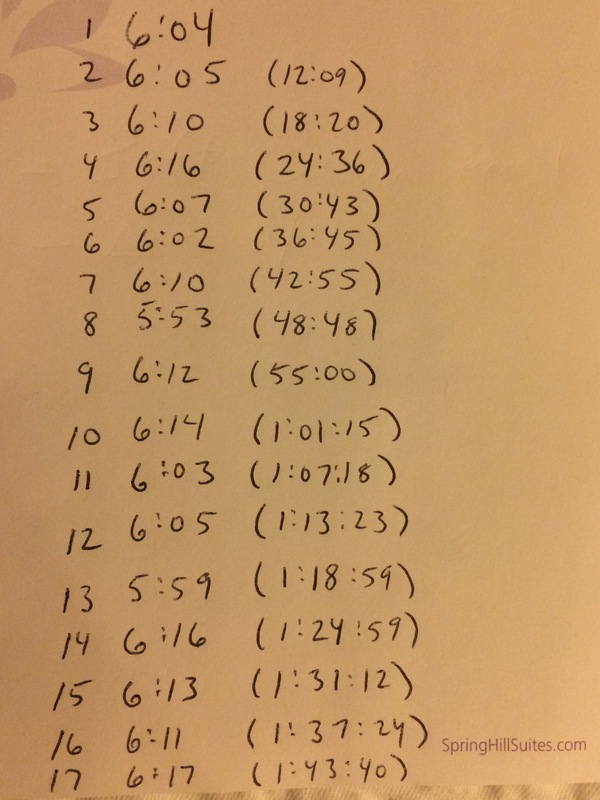 I ran the first 9 with Amber at an average of a 7-7:10 pace and then picked up the pace for the next 2 miles. The last 2.1 I went at a 5k race pace. (6:00’s). 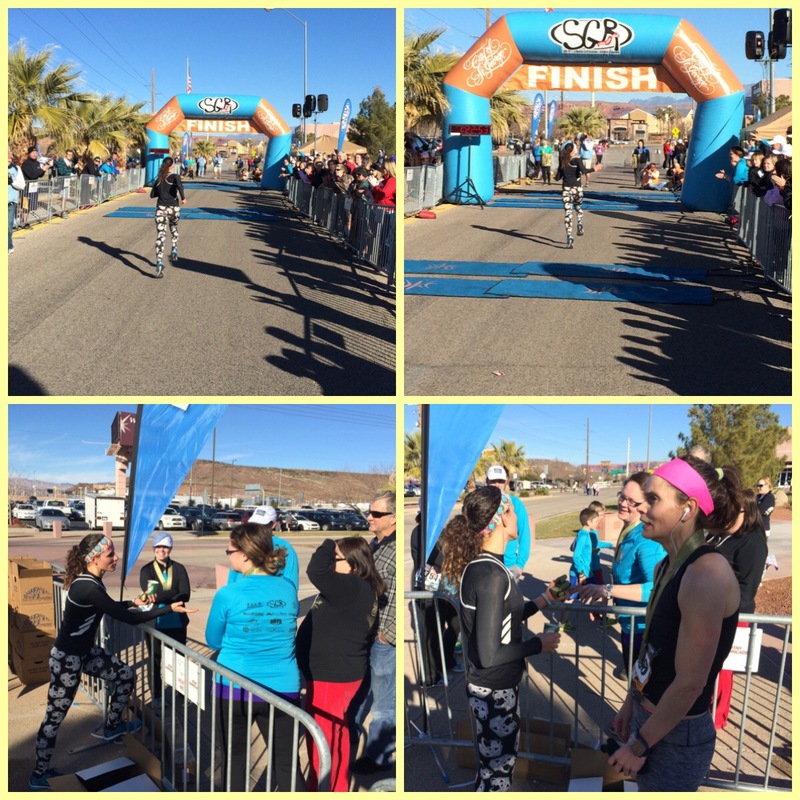 I felt good and ended up placing 4th in my age group. I ran a 1:30.50. I didn’t do a warmup or cool down because i didn’t want to put in extra miles. I had many friends running today and many that ran the marathon. Because we were the 1st ones there, we had a 15 min massage… So nice! There were a few of us from our racing team and they ran so well! 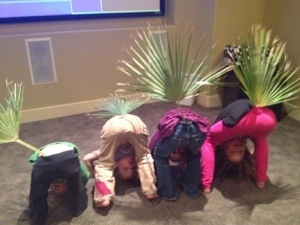 Very talented runners! Well today’s main purpose for me was to get a 13 miler in. What a great way to do it! 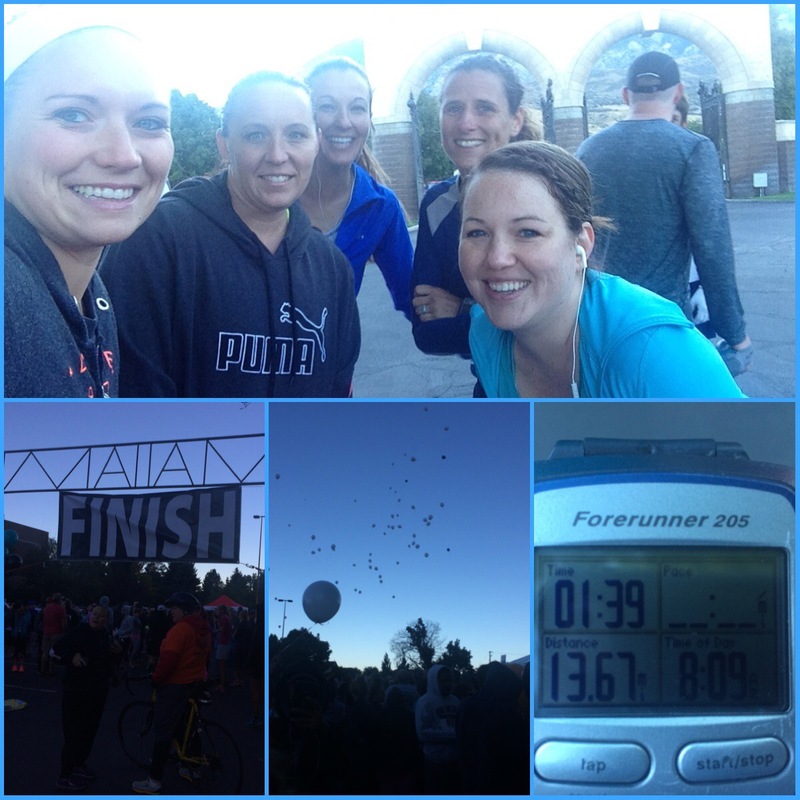 We (Corom, the girls and I) woke up early and went to the Nestle 5k run. I found out she is 10 years old!!! She came in 2nd… Yeah I was very humbled. My excuse to everyone is that I am training for a marathon now. 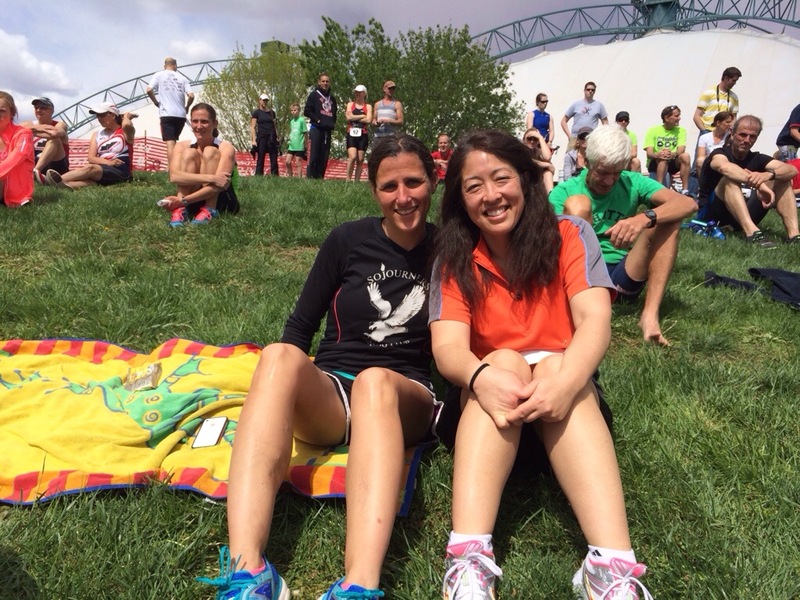 😉 I did go on a 31 minute run afterwards… A good chunk of the run was with my other fellow Runner’s Corner teammates. They are all very talented runners and work hard at it. 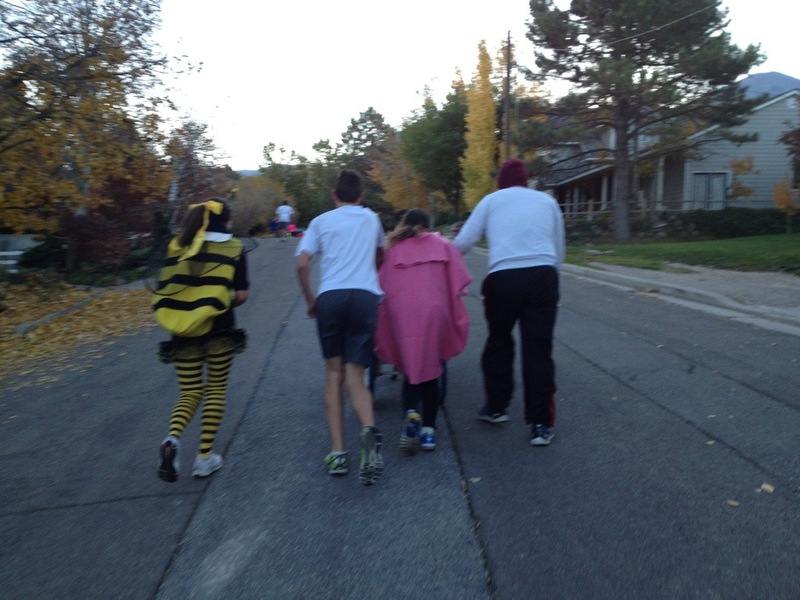 The other part of my run was running back to Corom and Mike as they were pushing the stroller and helping them out. 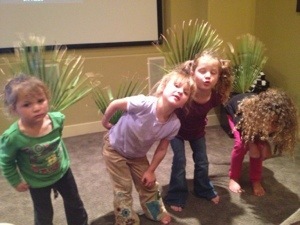 I love that the girls love to do these races. I need to get them running the 5ks now! 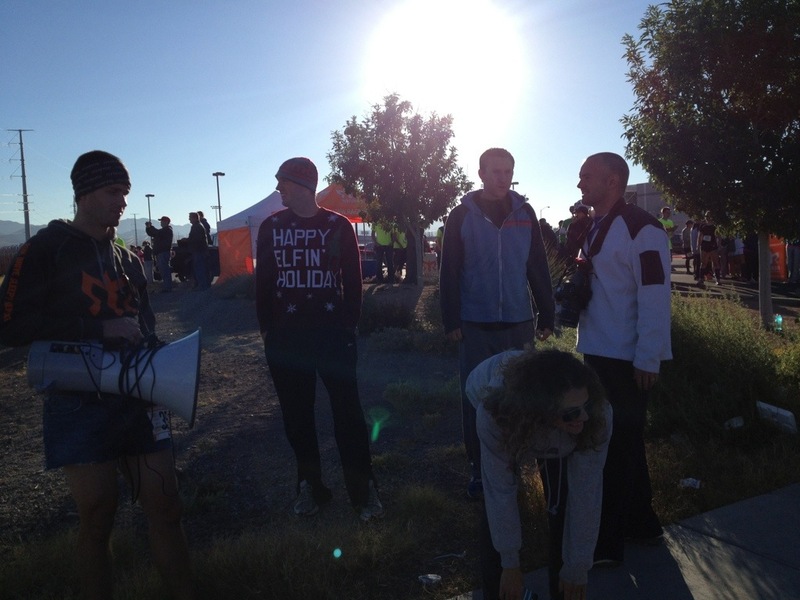 I also saw a few of the kids I coach at the high school at this race. They raced well!!! I went out for another 44:12.39; 6 1/2 miles. I ran a total of 1:55 +/- about 16 +/- miles. My legs are tired. 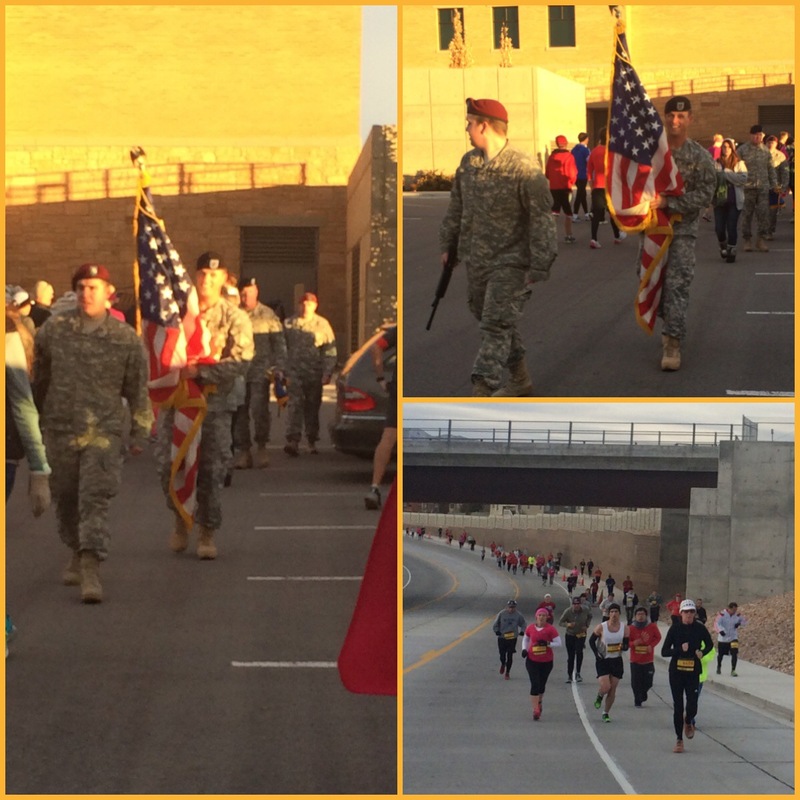 I started of my day with a Memorial 10k fun run. 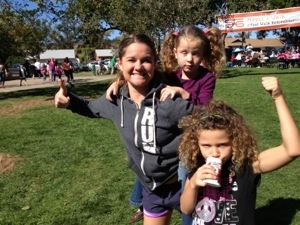 Amber, Rachelle and I met up at the race and ran a 2 mile warmup. 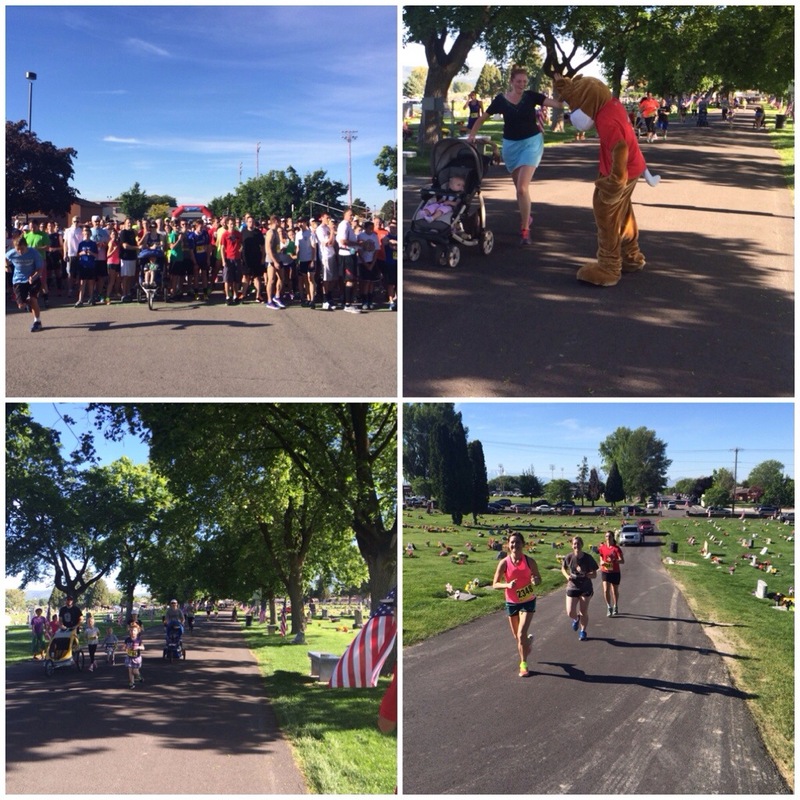 It was a beautiful, warm morning… The course was very hilly and we were able to run through the cemetery. Loved it. I was able to pull off a 37:44 (a 6:04 pace) and was happy with it. I will admit that I wanted to run a faster time but with the course being a tougher one and my legs still a little tired from last week, I was ok with it. I was able to take 1st in woman’s but they didn’t do awards because all the money/donations went to the Military. 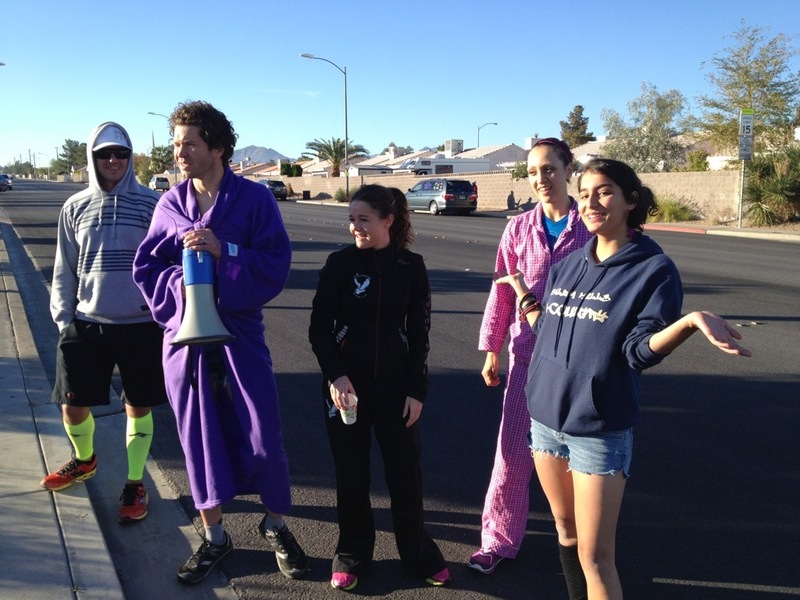 After the 10k, we went on a 2 mile cool down. I went to the BYU meet and watched my distance runners in the mile and 800 and in the relays. 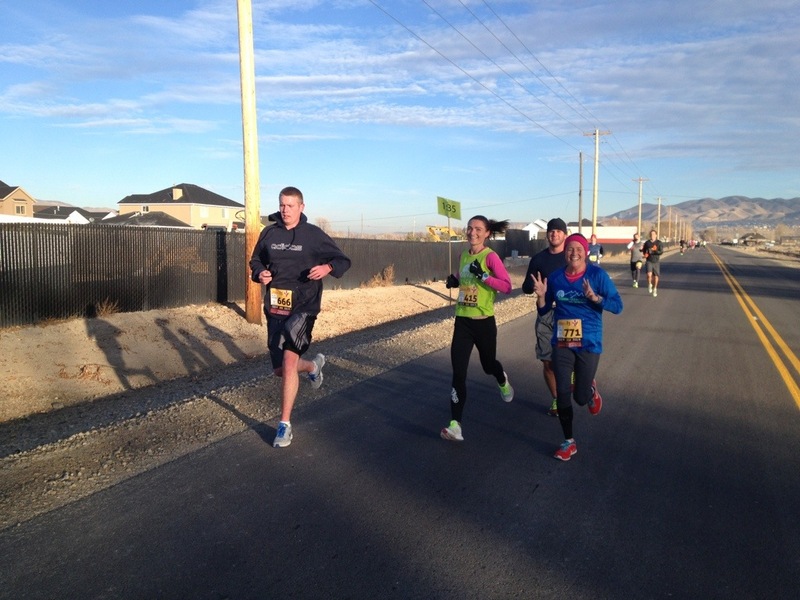 Well today I headed out to Thanksgiving Point to run a 1/2 marathon race. It was a very rainy morning and it really didn’t let up. 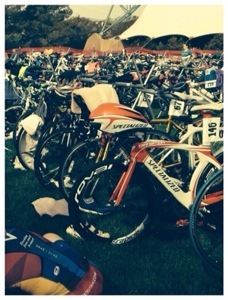 On with the race… A 400 meter swim (a quarter of a mile), a 10 mile bike ride and a 5k (3.1 mile) run. I am so bad at swimming… This will be interesting! This was our friend Brady swimming (he started about 20 minutes before us)… Corom is loudly cheering him on. Oh the swim was the worst part!!! 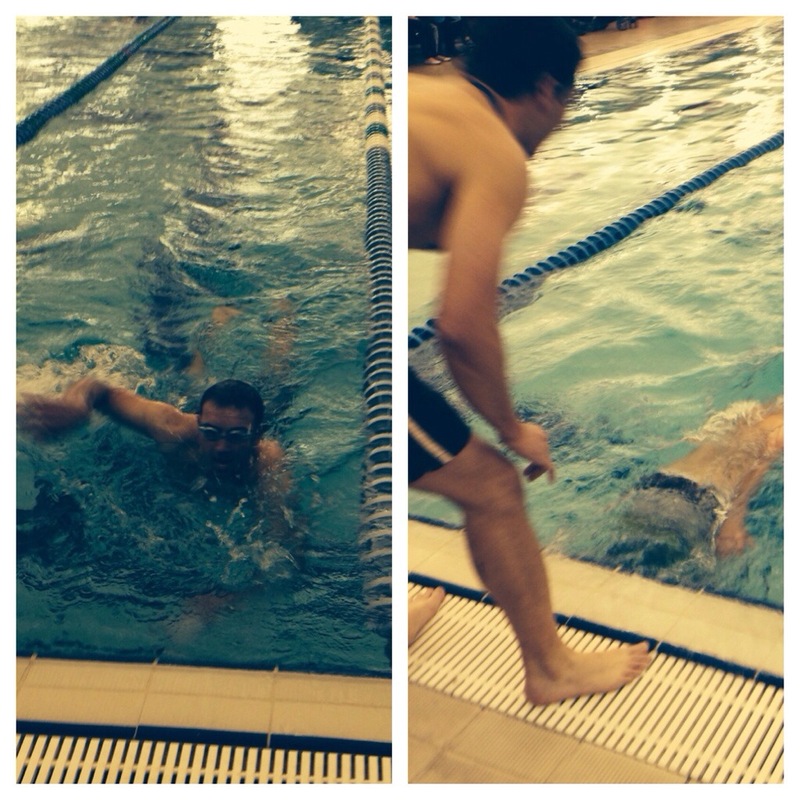 I am not a strong swimmer (as I just stated) and it was tough. I had to doggy paddle at one point in the race. I was grateful when the kid who was counting my laps finally said I was done (the swim was in a pool… Thank goodness and it was 16 laps total). 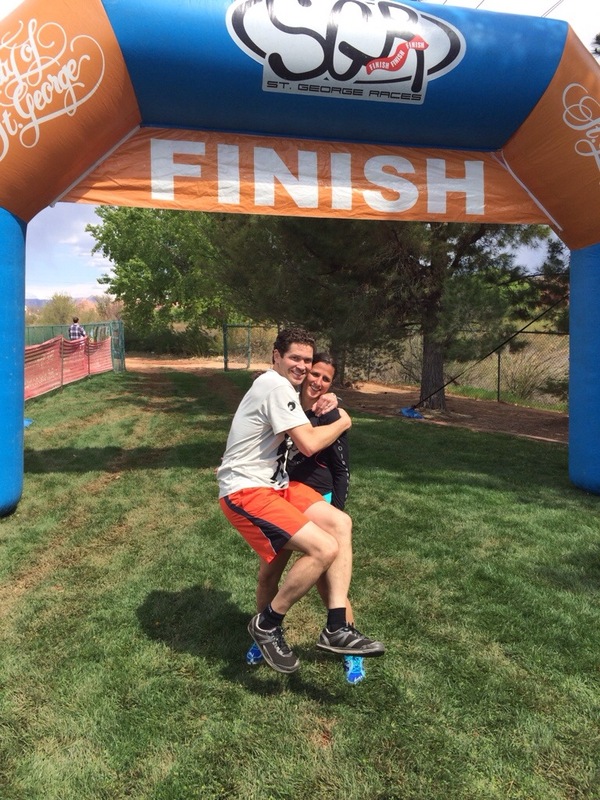 I finished that in 10:23 and ran out to get my bike and put on shoes, clothes, etc. 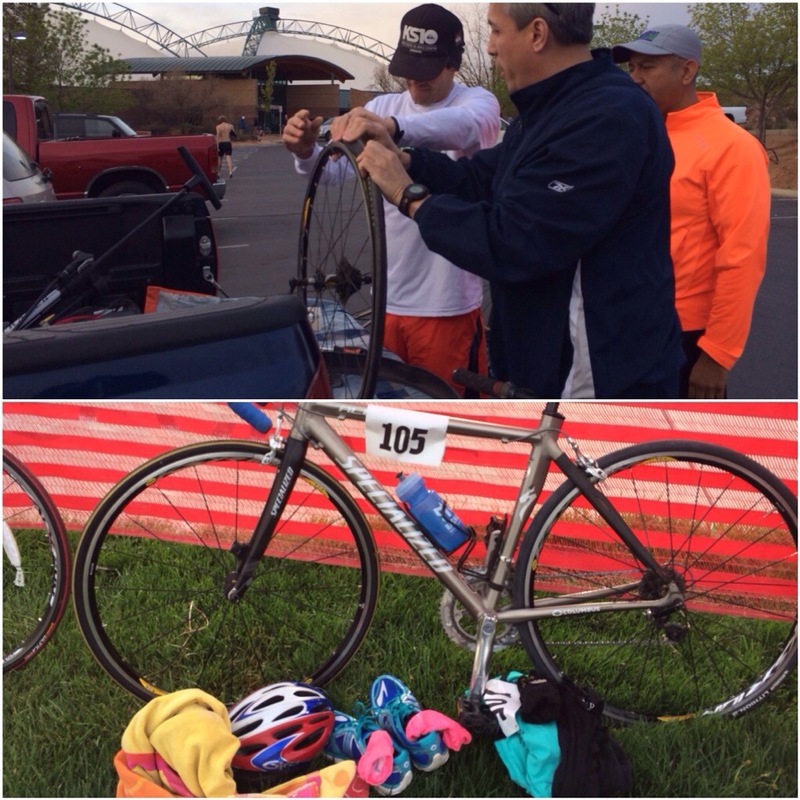 I used my mother-in-law’s road bike… What a huge difference from a mountain bike! A road bike is a lot more smooth and a lot easier! 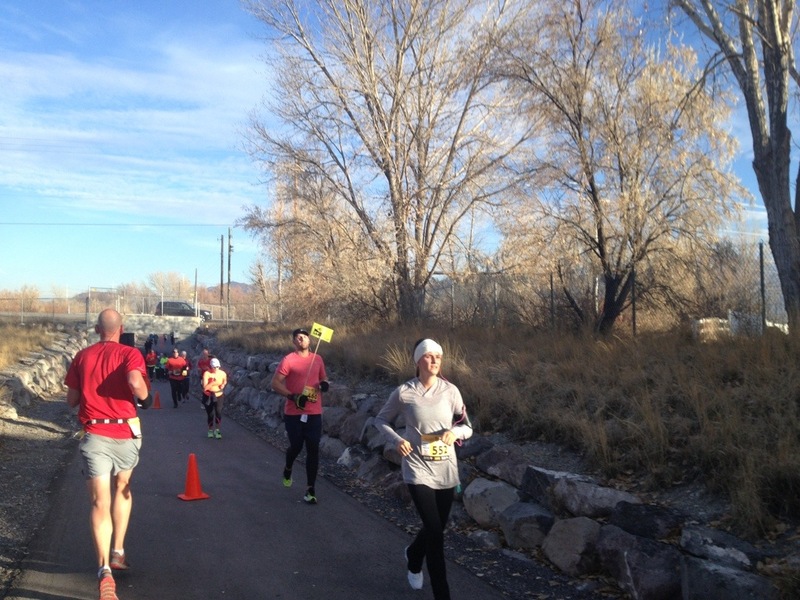 I finished the 10 mile bike ride in 34:23 and starting off on my 5k… I saw Corom and Mike starting their run as I headed into the last mile of my run (it was a loop). 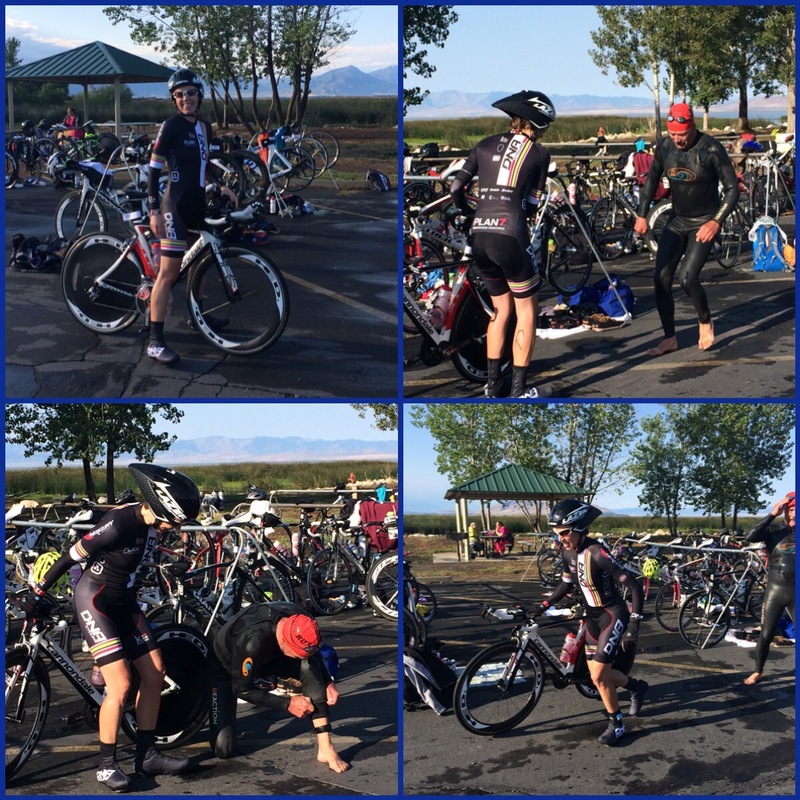 I finished with a total time of 1:07.13 (the exchange times are included with this- how long it took from the swim to heading off on my bike and then from the transition from the bike to the run). 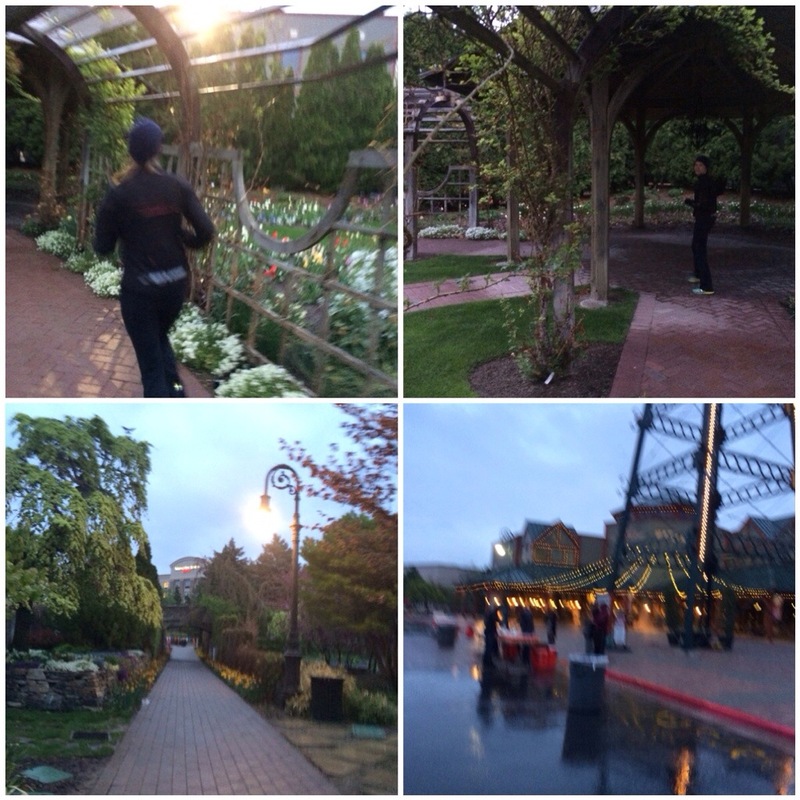 I headed back out to run with the 2 (Corom and Mike)… And ran another mile and a half. They came in around 1:27. 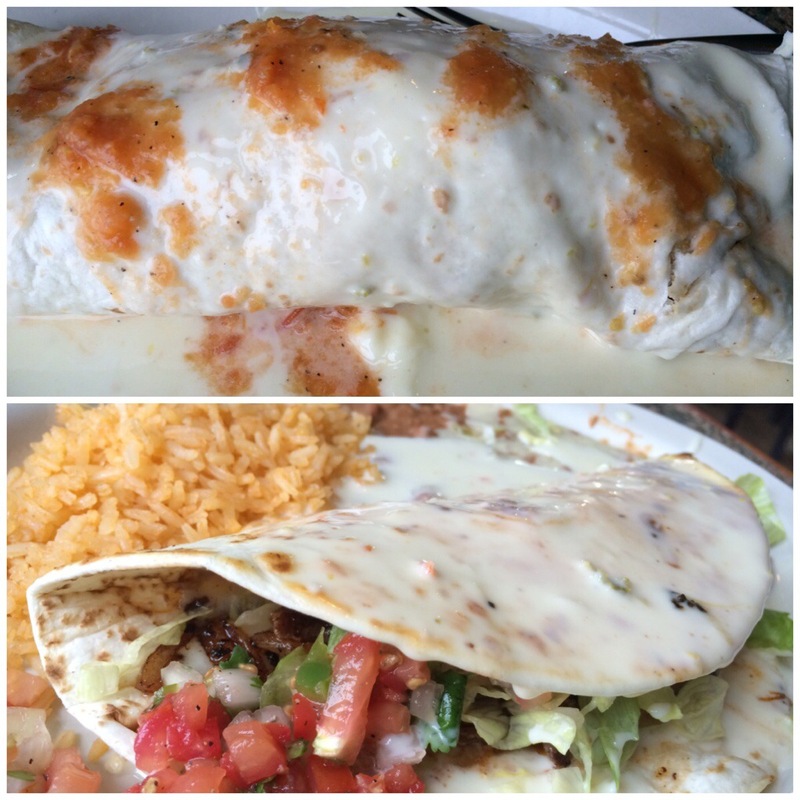 I wanted to get more running in but the food at the end looked to enticing! 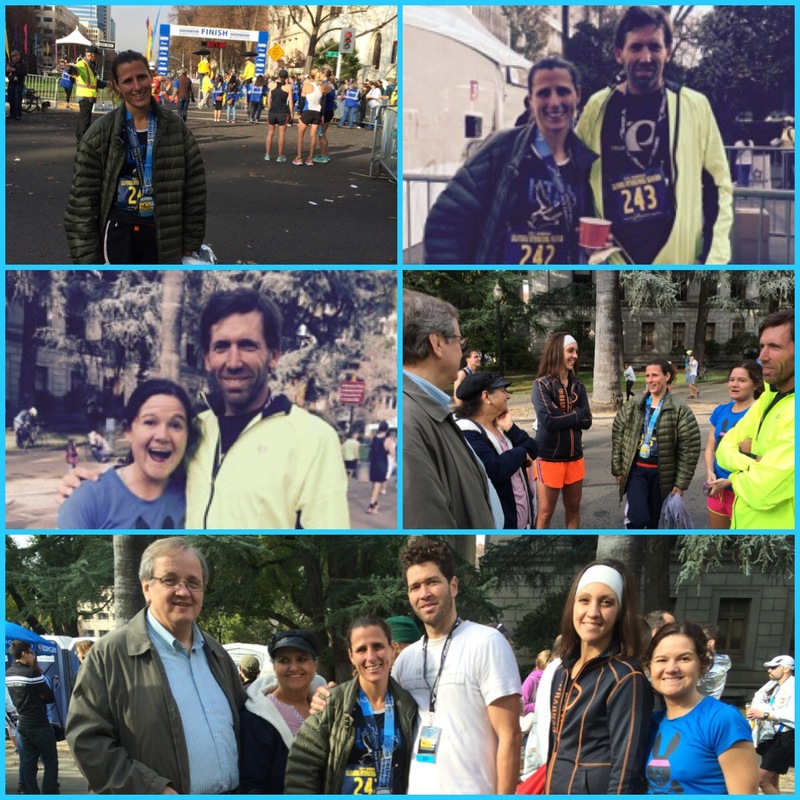 We ran into many friends there and they all did great! Soon after we headed home (about 3 1/2 hours). I decided that I was not going to get into race mode with it being my 1st week back. 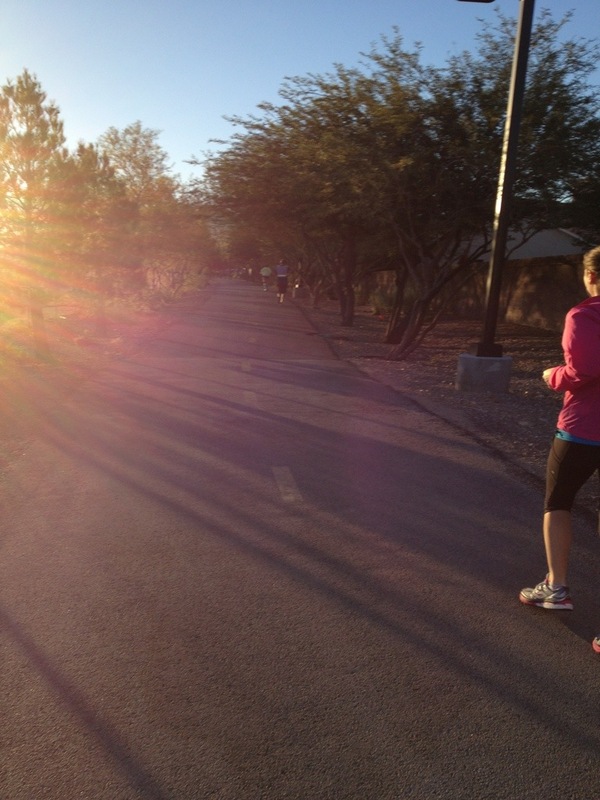 I ran a 20 minute warmup on a trail… So beautiful!!! (I am kicking myself for forgetting my phone:(). The race began and there were about 15-20 ladies in front of me for the 1st mile. We crossed the first mile and I looked at my watch… 5:30!!! Before I go on, it was a very aided mile downhill. Steep downhill! 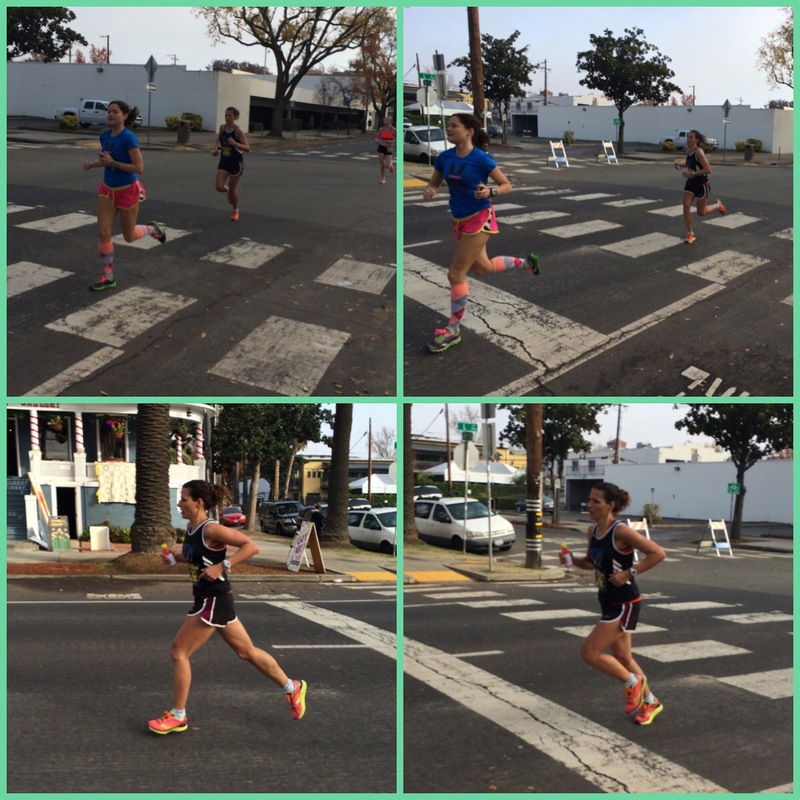 Miles 2 and 3 were also downhill with a few up (a rolling down)… Still fast and aided. 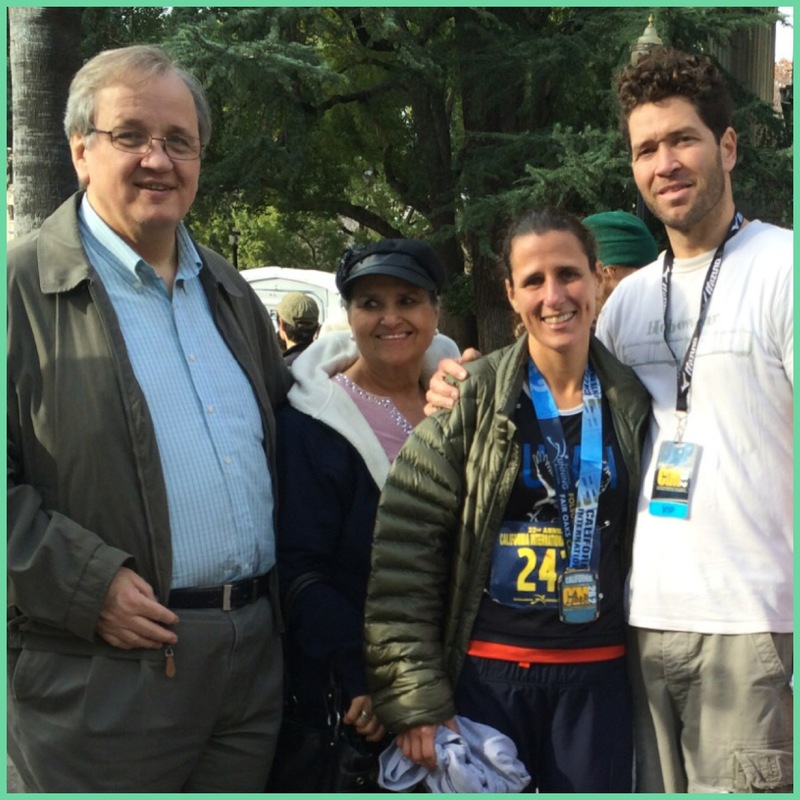 I felt great and began to move up… That is when my competitive side took over. I can’t help it. 3 1/2 miles later we were out of the canyon and on the main road. I was in 3rd place now but didn’t think I could hold onto it. 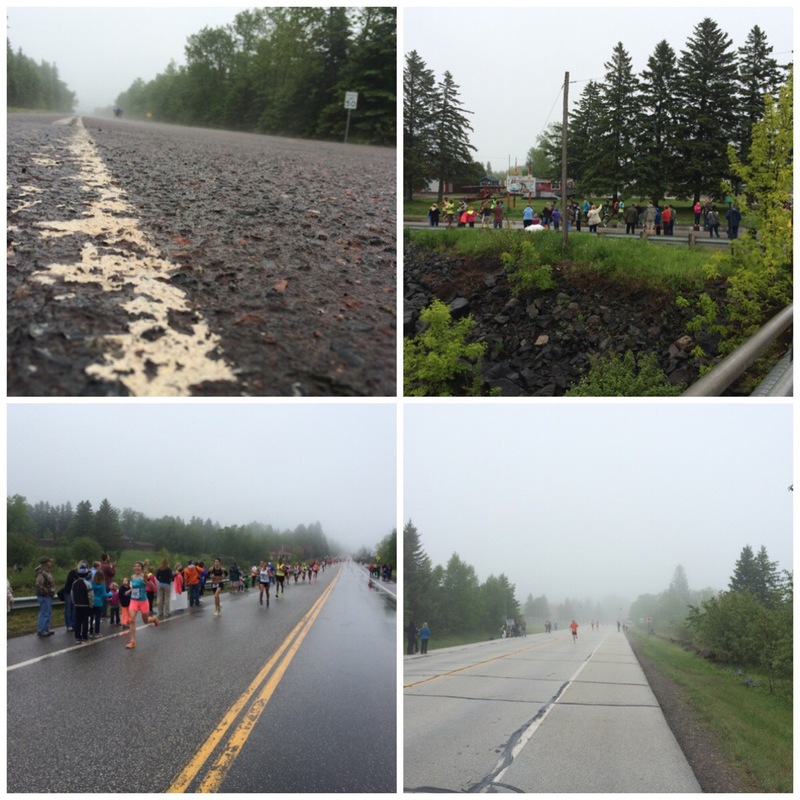 I was so winded by mile 4-4 1/2… The downhill took it out of my legs. 3 1/2 on was flat and up-hill and one short downhill close to the finish. I felt my endurance struggling! 🙂 I finished off with a time of 37:44 and I was able to hold onto 3rd. I was tired!!! I went on a 13 minute cool down. My legs were shot and so sore. But I am glad I was able to run this race. 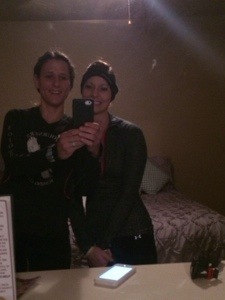 We ran a little over 5 miles (40:32) for a nice little run, warmup, to throw in extra miles, etc. before the race. 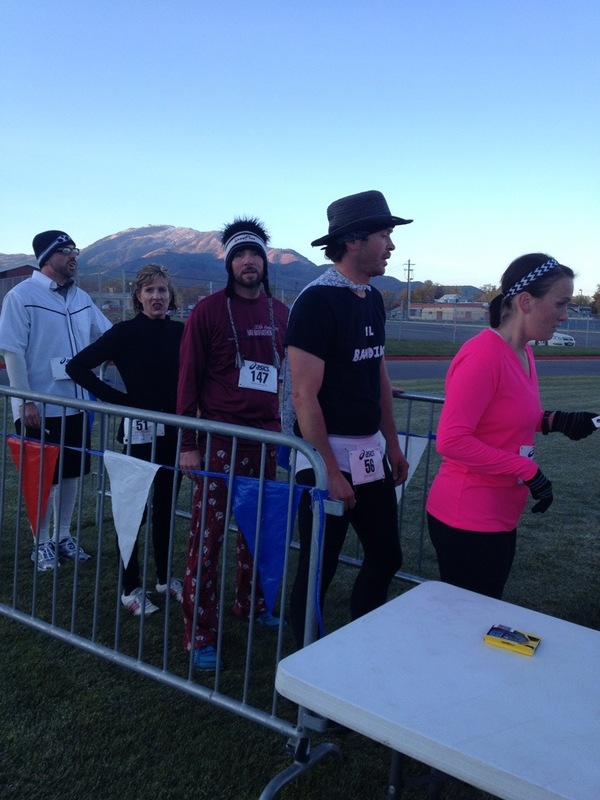 I ran 2 strides before the race (at the starting line) did about 15 to 20 hops on each leg and then waited for the gun. The course was flat, then a good mile down and flat, then a mile and a half up hill to the finish line. I do love hills! I was in 2nd the entire way until the last 1/2 to 3/4 of a mile left. I pulled in 1st and was able to hold on to that spot. I really look up to Amber Andrews (the girl that took 2nd). She is one of my role models and I know that if she was in shape I wouldn’t stand a chance. She has only been running about twice a week! My time was 18:23.0. 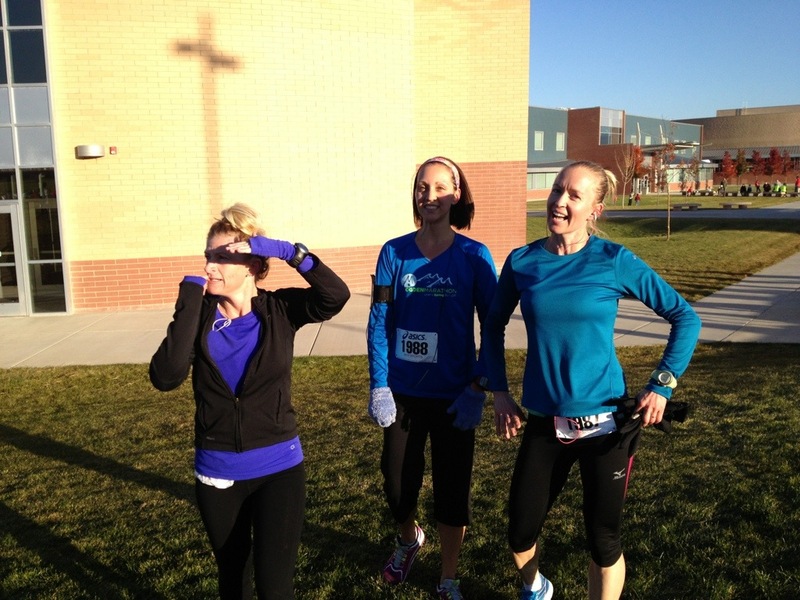 After my race, Amber, Josse, and I ran back to run our friend Rachelle in from the 10k. 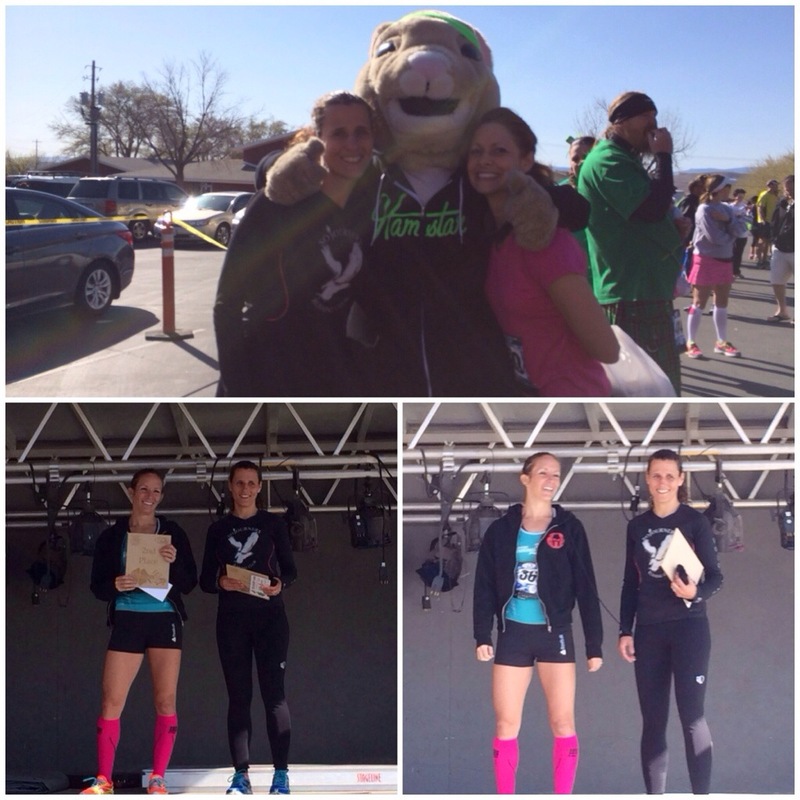 She was the 10k top finisher with our friend Rebecca in 2nd. I ran a mile back with Rachelle and continued on for a cool down. The guys all ran great, too. They did the awards and I won a season (a year) pass to the Hale Theatre (I love plays), a year pass to Thanksgiving Point, and in the raffle… An hour ride for 2 in a Hot Air Balloon! That kind of freaks me out. Oh on a side note… Corom bought those pants for me… Thanks Corom! 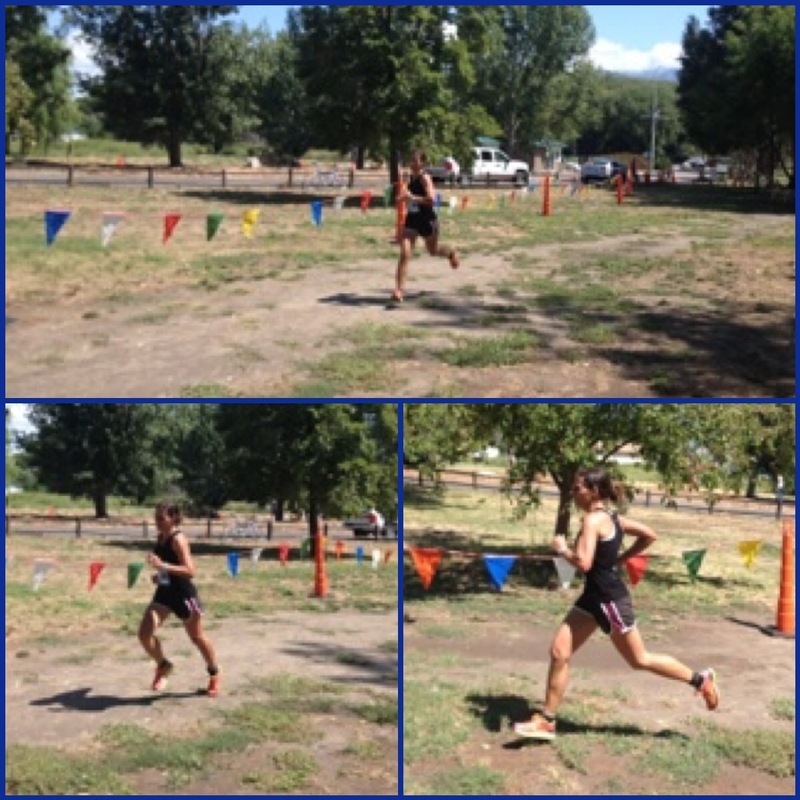 I took 3rd behind Kassi and Sierra. 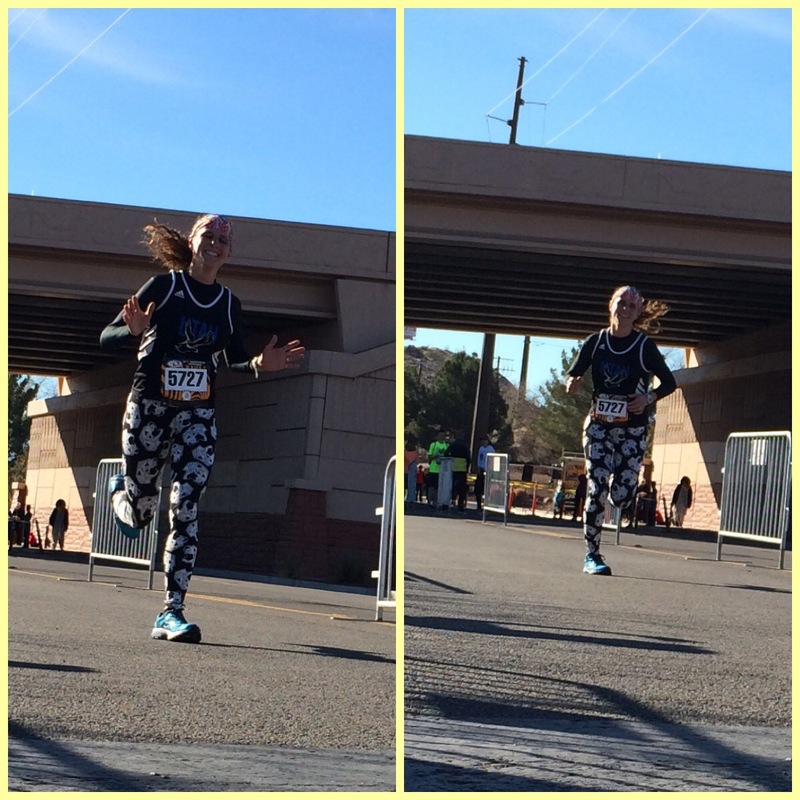 I know Kassi well… She is an amazing runner!!! Very strong and works hard. I ran a total of 16 miles today. 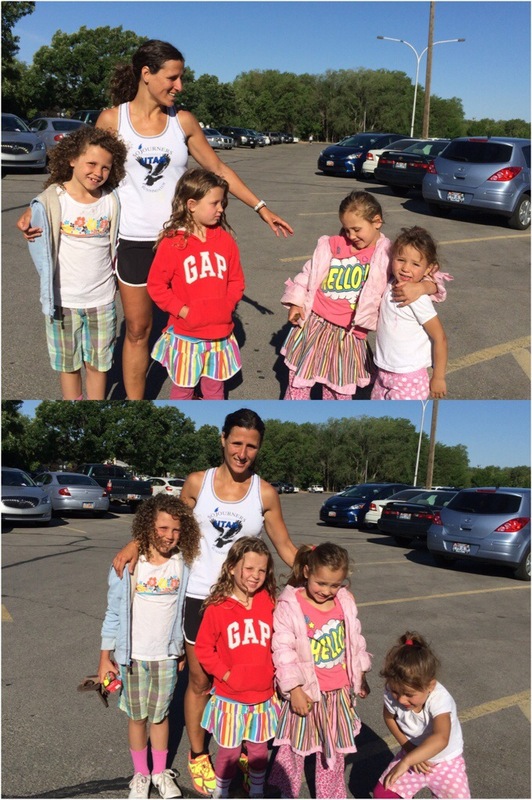 2 mile warmup with Amber D, Amber A, and Kassi and then a 1 1/2 mile cool down with Amber D. I then ran a half a mile with my girls in their Tuff Kids 1/2 mile race. 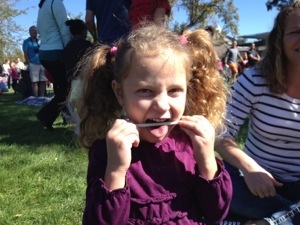 They loved it… They got their own medal! I ran a 18:22 (last year I ran 18:34) and took 4th. There were some fast runners there. It was fun (once I was almost done :)). It did take me a good mile to get into it but that is when the major hills started. The last hill, I actually felt pretty good. Last year I remember struggling up that one, but this time around it was different. 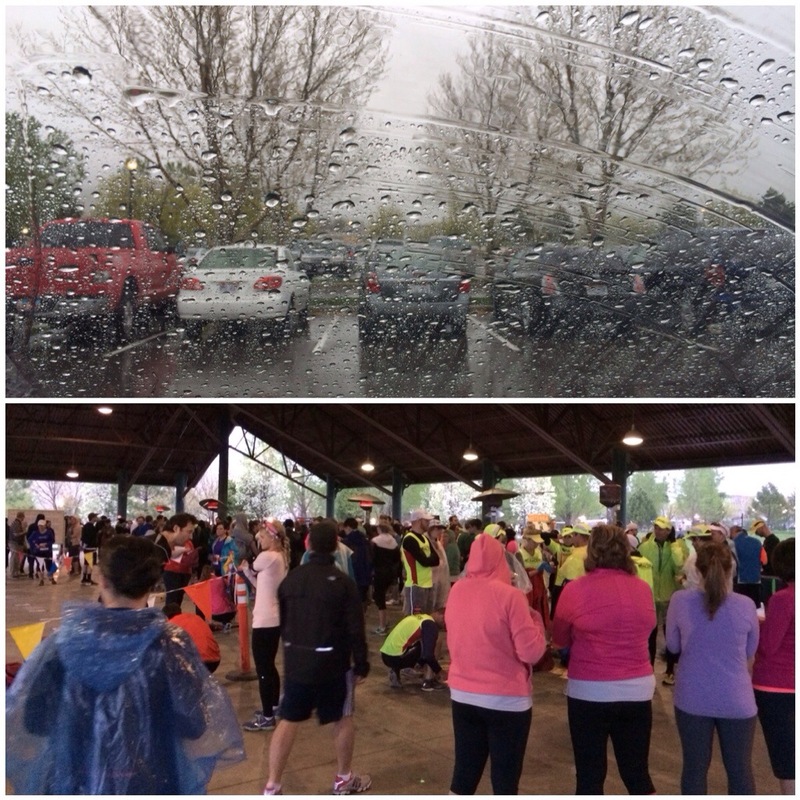 To tell you the truth… I am so glad I raced this morning. I was not mentally into it but for some reason when that gun goes off, I can’t help but go. I wasn’t planning on it until the last minute and I know I would have regretted it if I didn’t run. I ran a total of 60 minutes (I would run with the high school kids on their warm ups and then a couple of us ran back to our hotel for a nice cool down). It was a good run today! 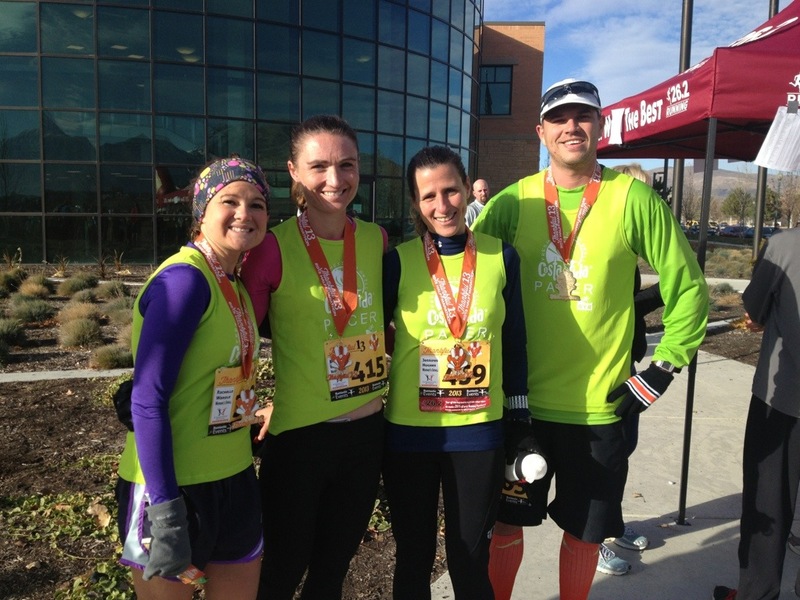 I ran the Thankful 13 1/2 marathon today but as a Pacer. 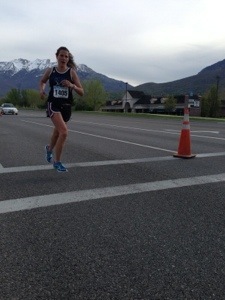 Beth Ericksen and paced the 1:35 group. We came in at 1:34.48. It was a 7:15 per mile. 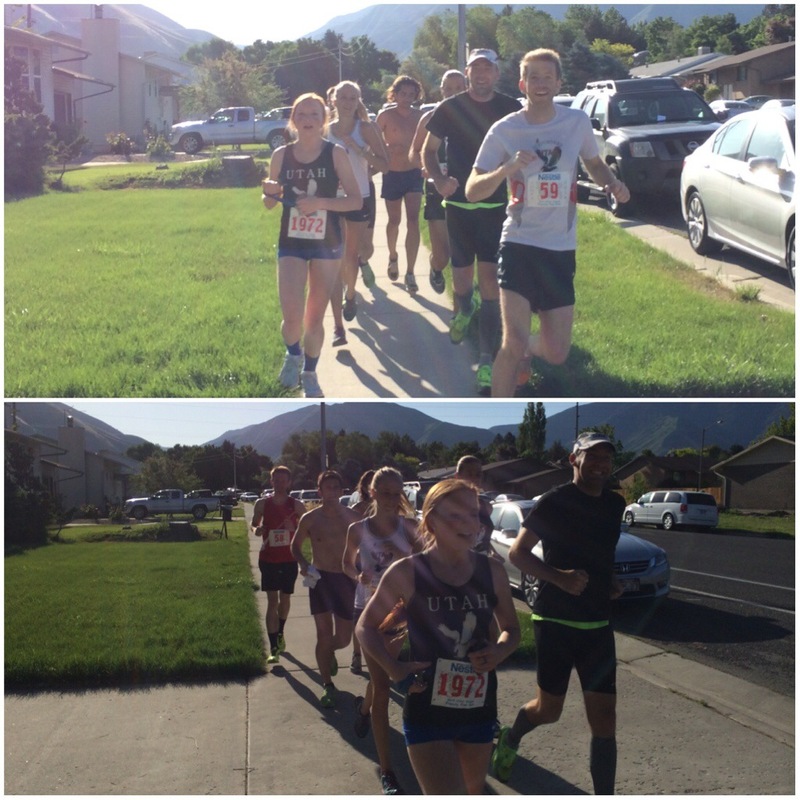 We ran with a pretty great group the entire way. The last mile we urged the people with us to go ahead. It was great and they did great. Probably the best group I have paced! 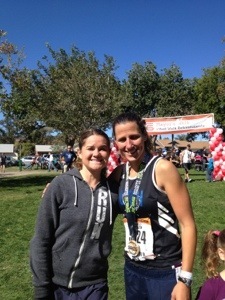 My friend Melissa (that I helped this summer with training and is now running with us when she can) took 1st in the women. She did great! 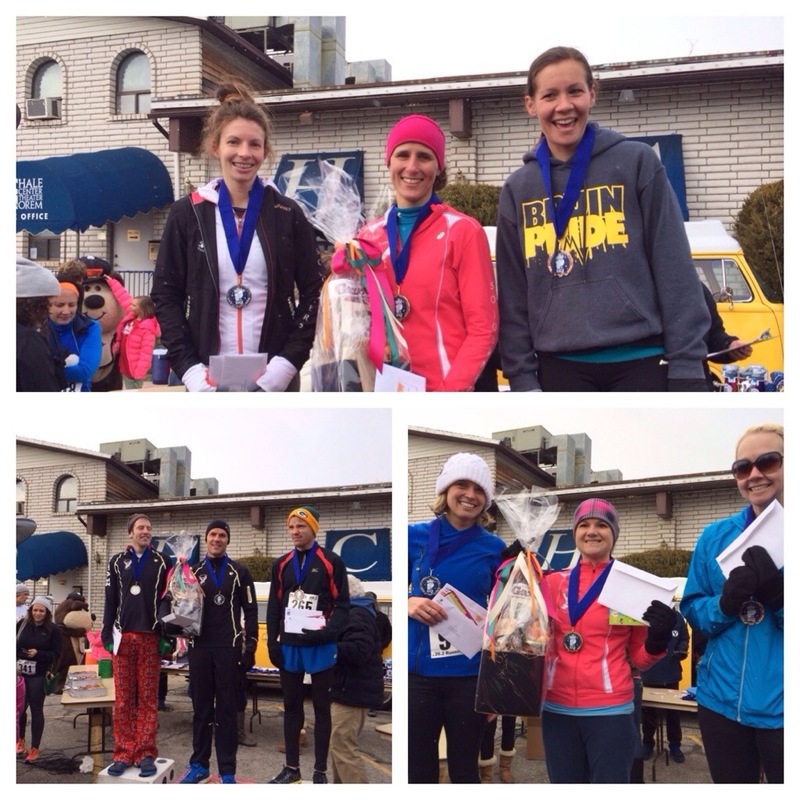 Beth and I took 3rd and 4th overall. That was a nice surprise. 🙂 I also carried my water bottle with XOJO in it, the entire race. I drank some before, during, and after and I felt and feel great! I love this product!!! I am so glad I ran this. 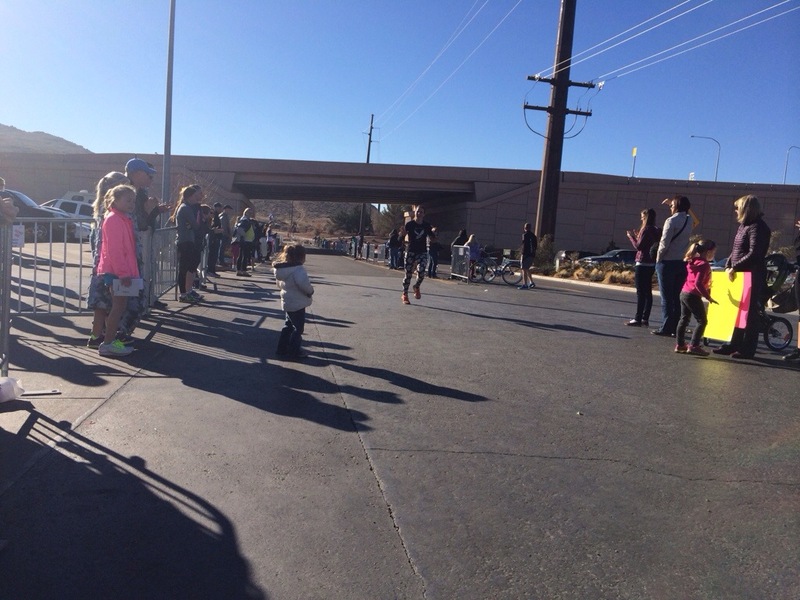 I put in a 10 min warmup before the race and a 15 min cool down… Ran back to find Sarah. (about 16 total). It was a beautiful morning. Happy Thanksgiving!!! 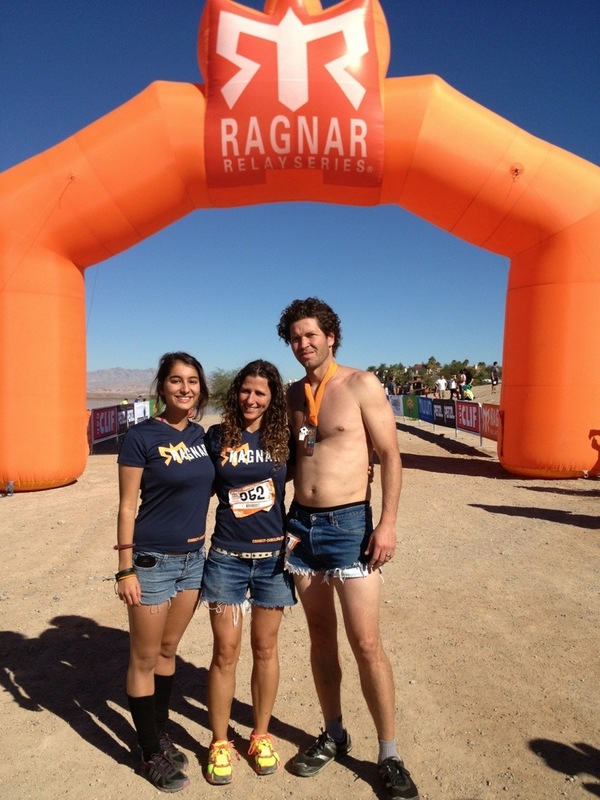 Las Vegas Ragnar… Another year with the Nevernudes!!! Tanner handed off to Ryan Southwell. Ryan’s leg was a non-support leg, so we were not able to stop and give him water or take pictures. 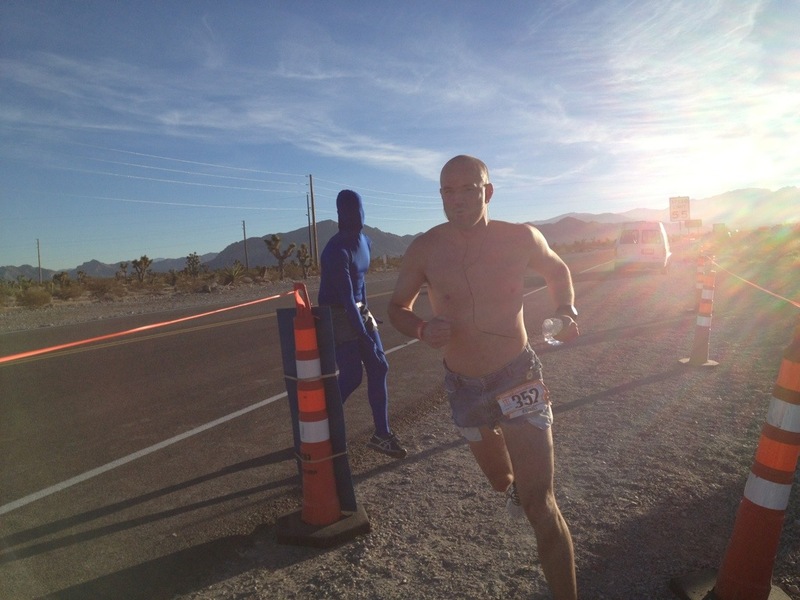 He is a good solid runner and he is also the one who makes all the Ragnar videos. Pretty amazing. Mark Lovell finished off our van 1. 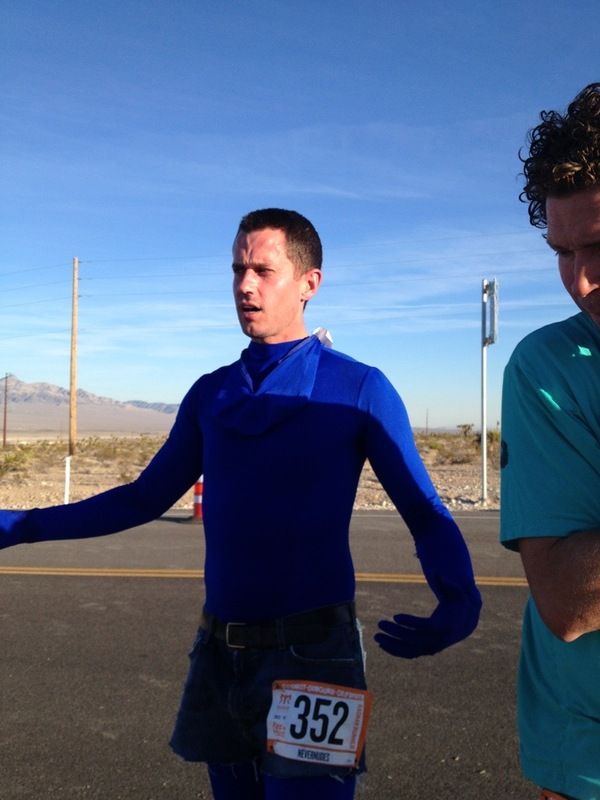 He did awesome and came flying in to hand off to van 2. Our team did really well! On the other side of the sidewalk is Ryan & Kelly (bending over) Southwell -van 1, Damon Chamberlain (he made it to the Olympic Trials for steeple chase back when he was in college) – van 2, Tim Hubbard -van 2, and then Tanner Bell – van 1. 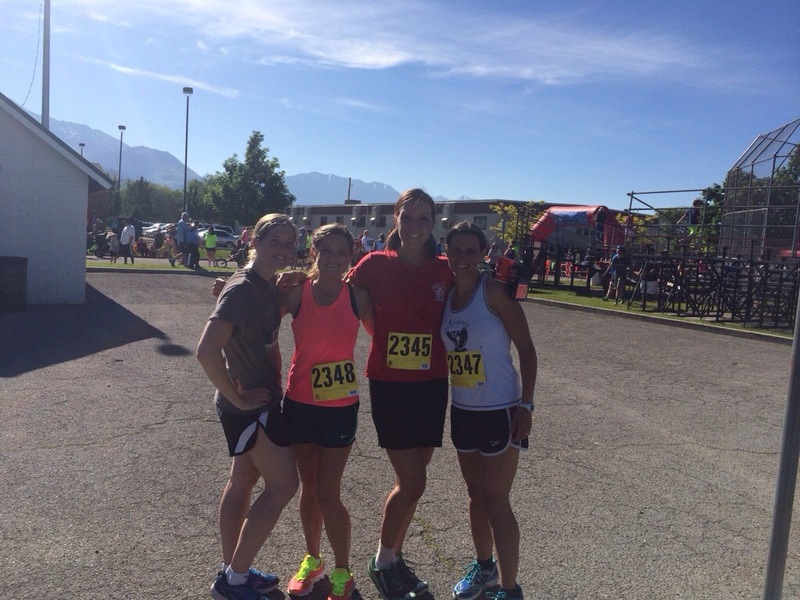 Van 2 rocked it! They were way fast and didn’t give us the break we were hoping for. 🙂 While they were running we went out to eat at a Greek restaurant. 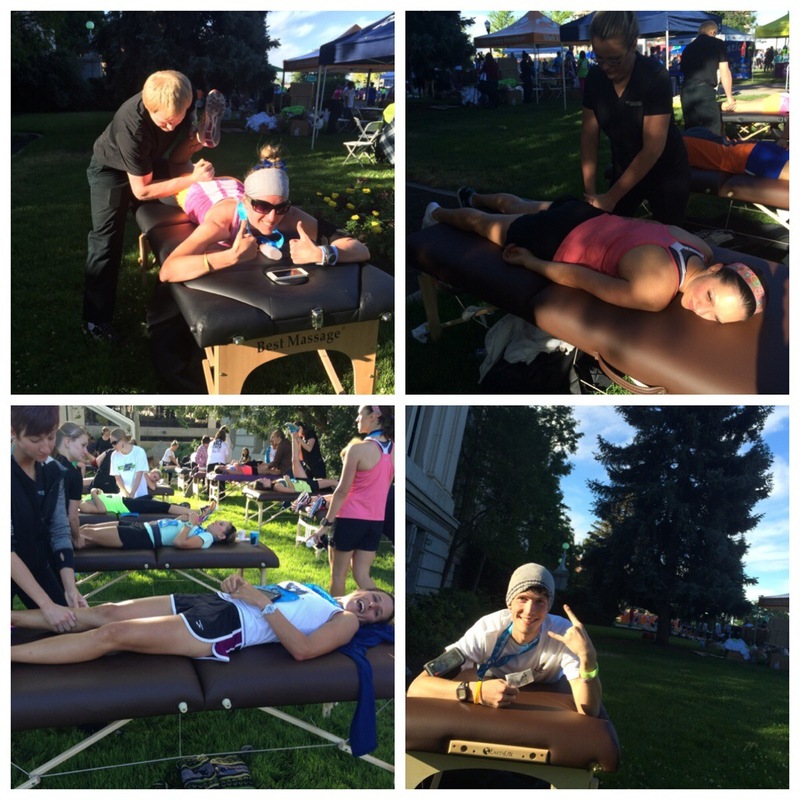 Here are a few pictures of van 2… They had a blast together. 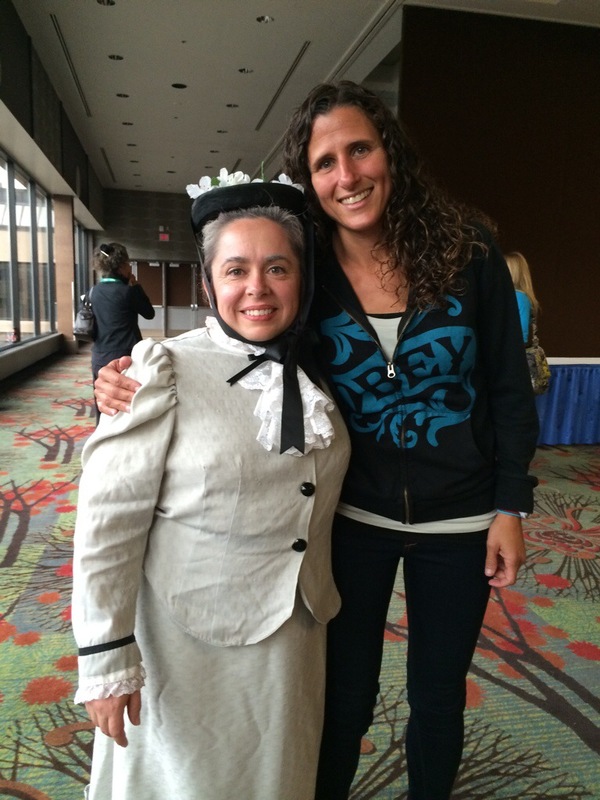 It was fun meeting up at the major exchanges! 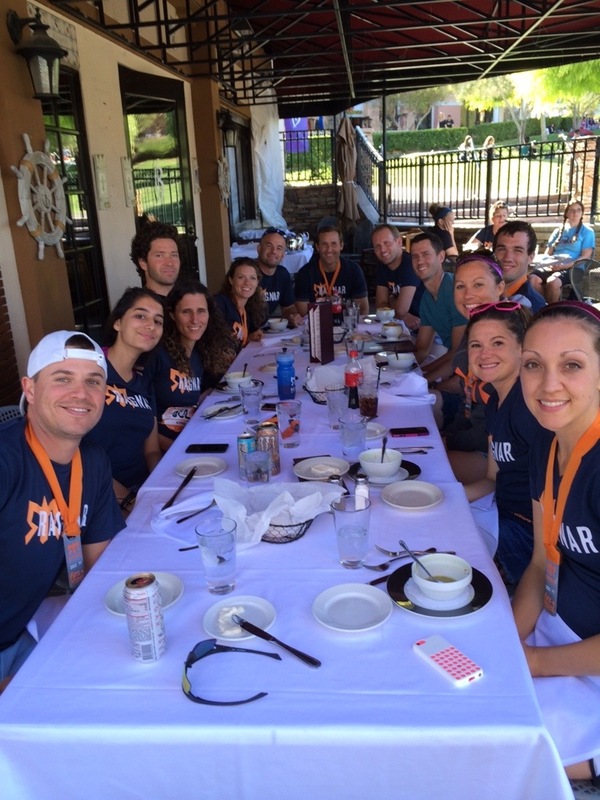 After the race, the entire team went out for lunch! 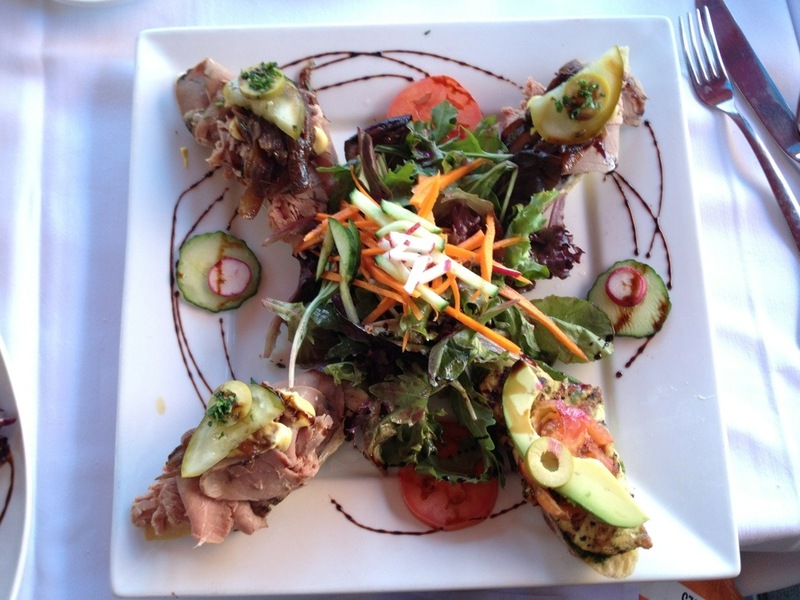 Good food, good times and good company! 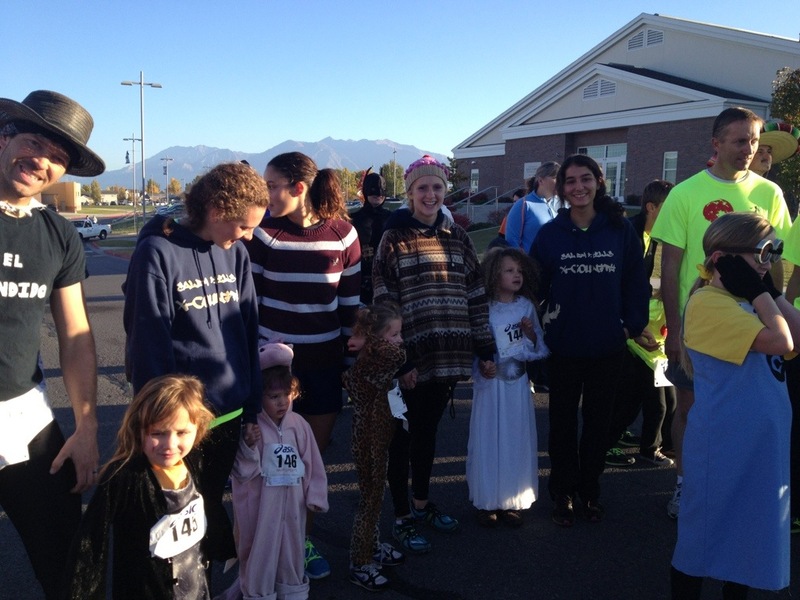 Here at the high school, the cross country team put on a Halloween 5K community fun run. We had a good turn out this year. 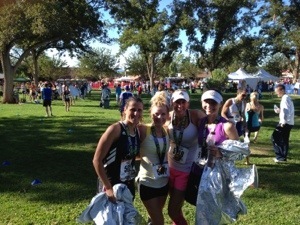 I ran it this time with my girls. 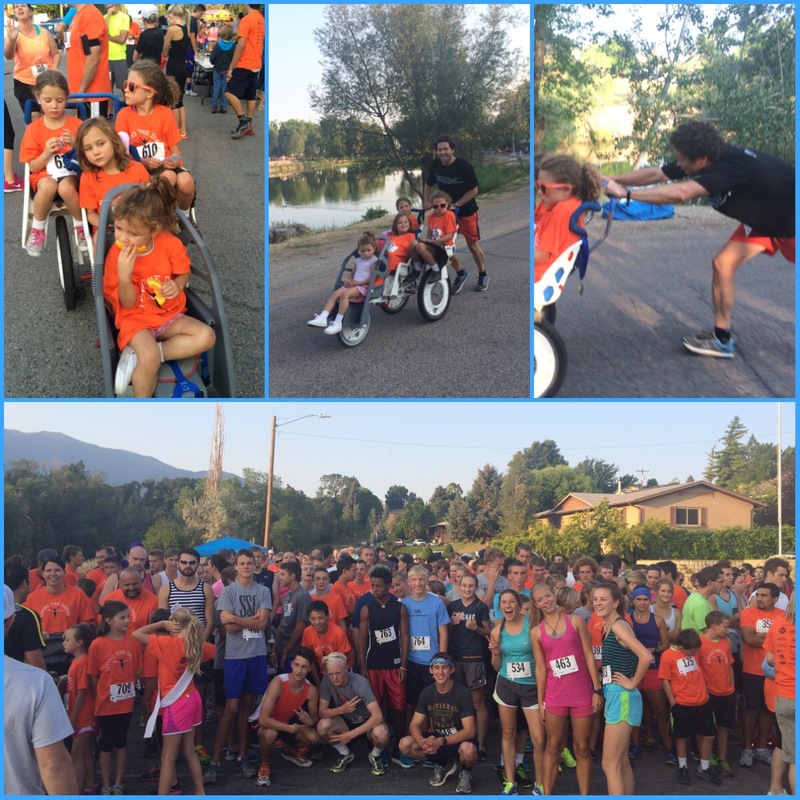 I usually work the finish line but we had enough helpers that I was able to help Corom this year and push the girls. I had a blast but it was tough!!! I couldn’t stop laughing… The rest was a piece of cake (after that hill). I took off with the girls and we made sure Corom and Mike wouldn’t catch up. 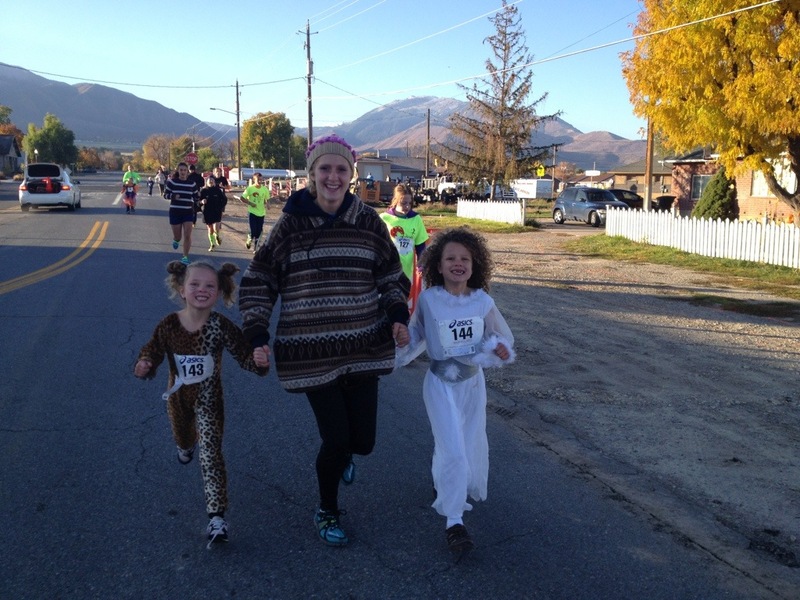 (The girls kept yelling for me to go faster…) the girls and I finished in 23:58 for a 5k. It was quite the workout and my arms are tired! 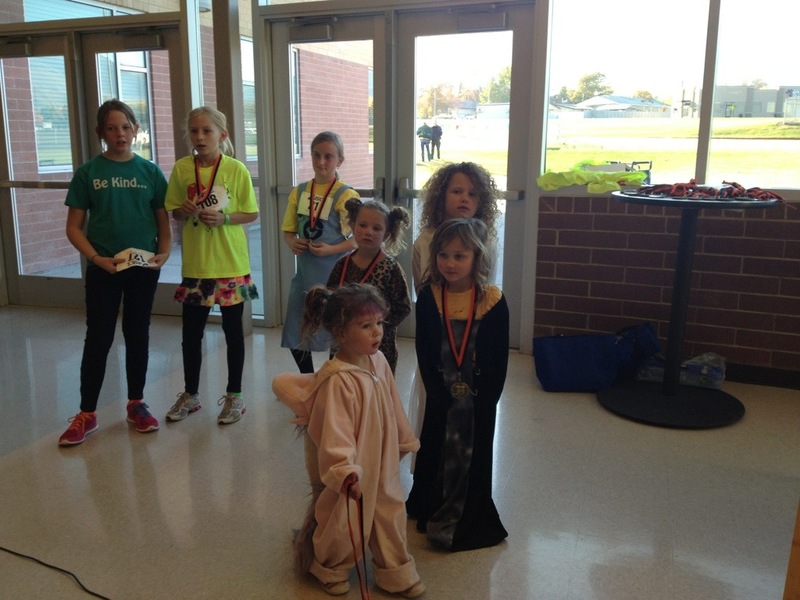 My kids ran in the mile race… They, too, did really well! The 2 older ones ran the entire way and the other 2 ran and walked. None of them had to be carried this year. The high school kids helped a lot!!! 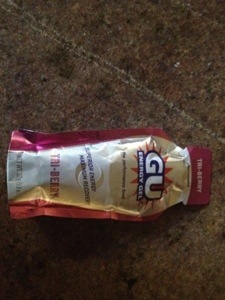 I have never taken a Gu during a marathon. 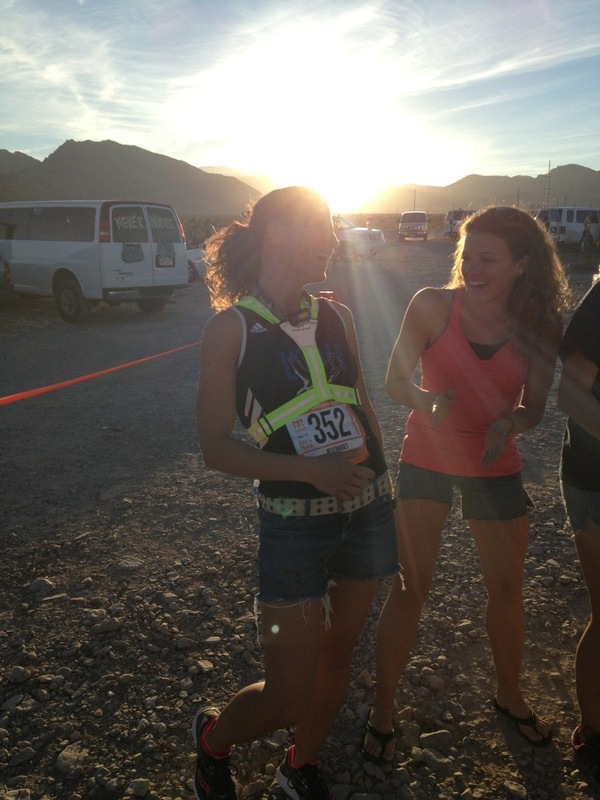 I survived solely on the gatorade, water, bananas and oranges they have throughout the aid stations in the past years. 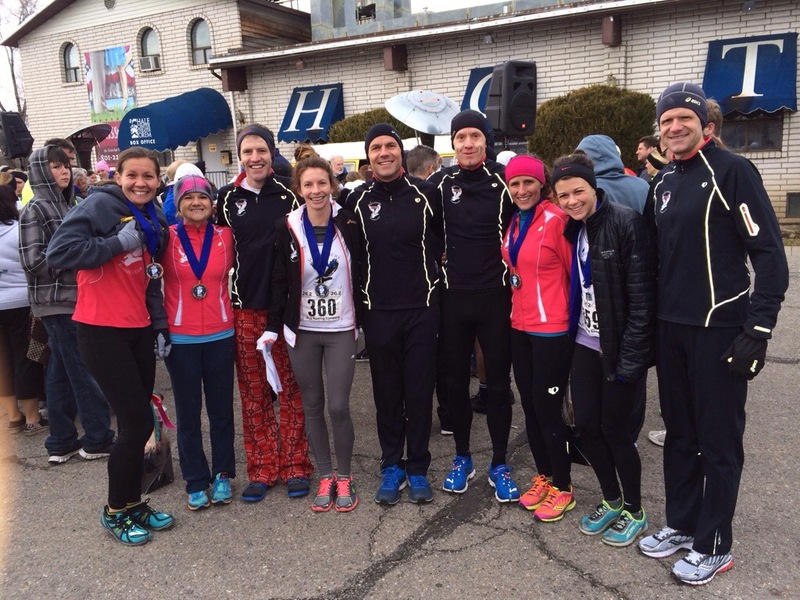 Thanks to all my running friends who have taught me the “importance” of Gu! I had 3 throughout the race. Mile 8, 16 and 23! At mile 14 or 15 something just clicked and I felt good! I was a little nervous that I would crash the last 3 to 4 miles, but I still felt like I had to go with how I felt with 11 miles still to go. I started to get a little ahead of my “2:58” goal. 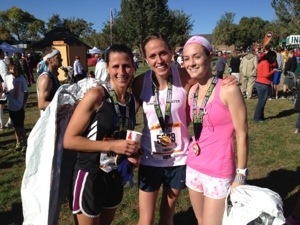 I got to mile 18 and there was an angel there waiting for me!!! Rachelle Wardle was a Major Help to me today!!! Even if I wanted to slow down, I wasn’t able to with her there. 🙂 She talked to me, sang to me, encouraged me, etc. the entire last 8 miles. She held a great pace and I just had to follow! 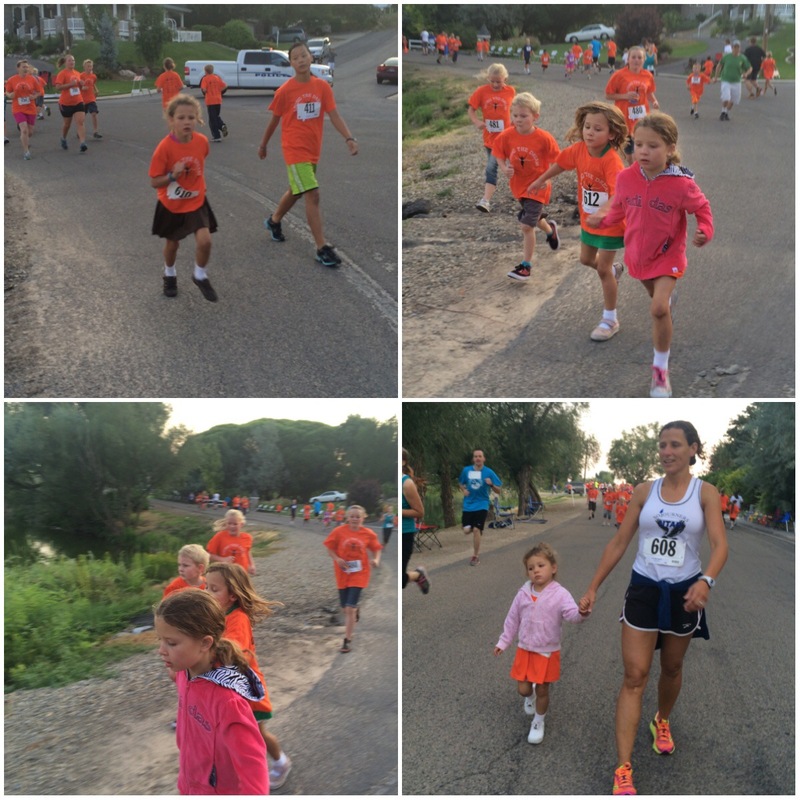 Our last 3 miles were under 6:10s. I will admit, the last straight away to the finish line was forever long. My legs began to feel heavy and I realized how tired I was at that point. 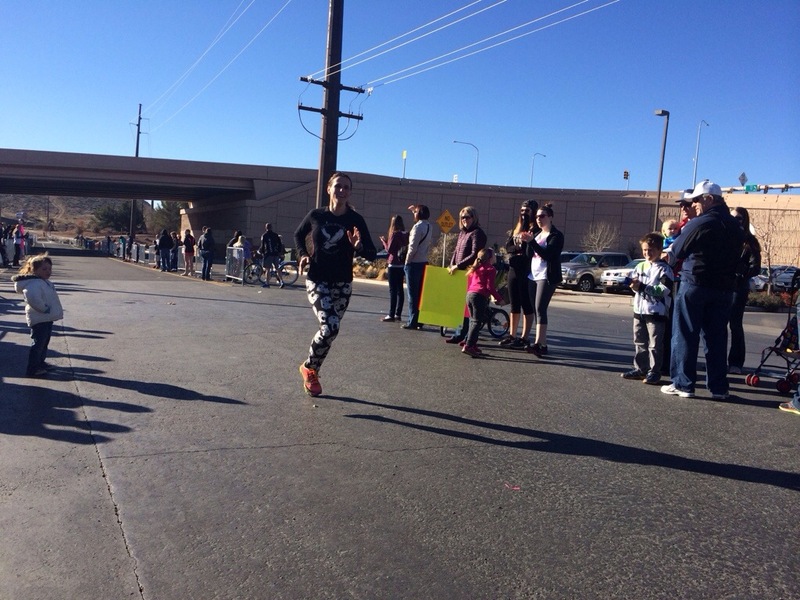 But I finished with an 8 min PR (personal record) in the marathon with a time of 2:54.22. 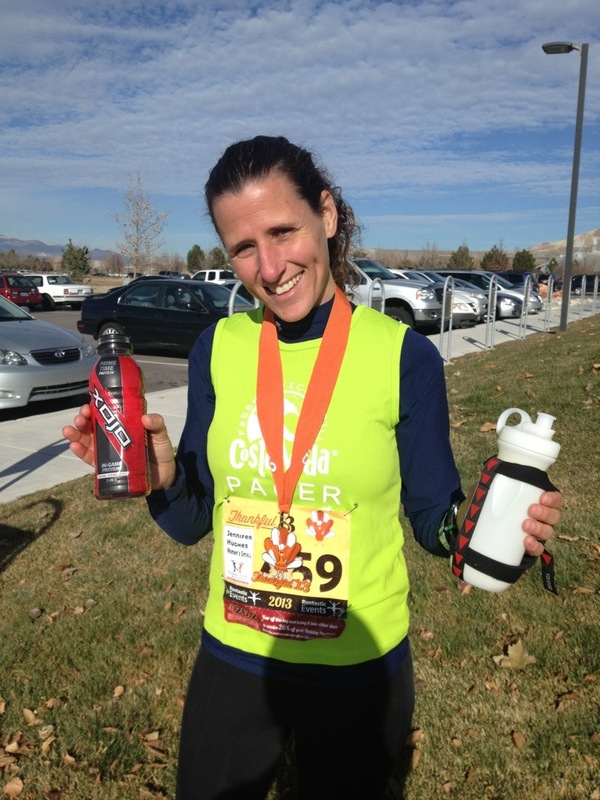 I took 15th overall in the women, 5th in my age group and 1st in Utah County (which I won $100). My pace was a 6:39. I am stoked! Now I can quit… J/K. Sarah just ran a huge PR. She ran a 4:42.39. Her best before was a 5:18! 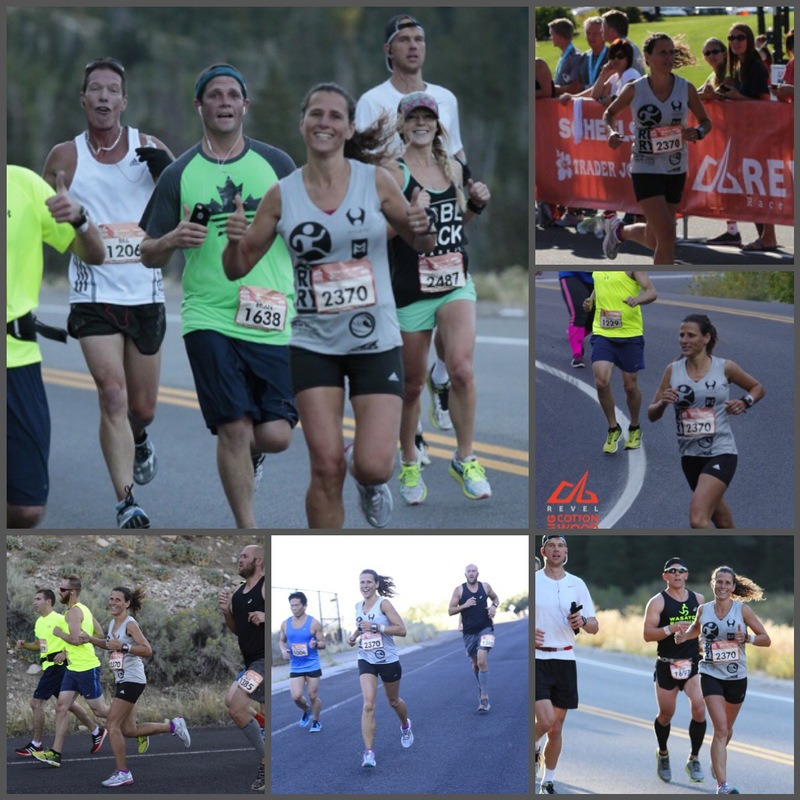 This was her 28th marathon. Amazing!!! All my friends (and I am sorry if I miss putting your name down) Mac, Aubrey, Amber, Julia, Josie, Ericka, Tawney, Carina, Tifany, Kelly, Melanie, Kim, Beth, Jasmine, (and all the guys, too), etc. all ran PR’s. It was exciting seeing everyone coming in and doing well!!! Good job everyone! 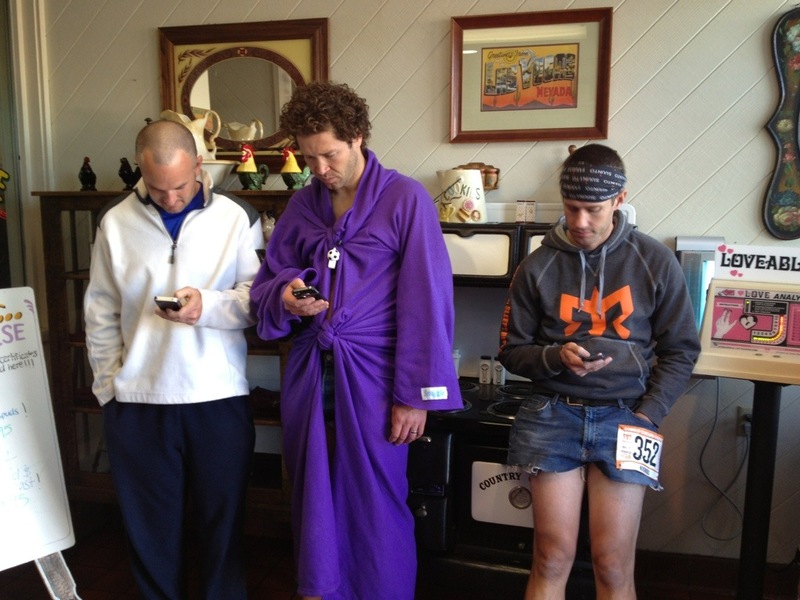 And then there was my husband Corom and our friend Mike Fullmer… They both came in at 4:41. They did not train at all for this and still pulled it off! Pretty impressive…. Until I found them treating a bathtub like a hot tub. Doesn’t surprise me though! 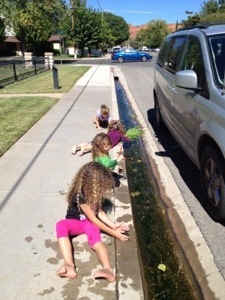 The girls playing in the gutter while we were waiting for Mike and Amy to return (Mike lost his car keys on the run somewhere :(). 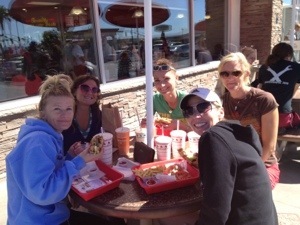 We went to In-N-Out for lunch… It was delicious and I think half the marathoners were there.